Thavorn Palm Beach Resort is located in a quite area in Karon Area in Phuket. The resort is one road away from the beach, which sees much lesser crowd as compared to Patong. The resort is far from everything else and the nearest 7-Eleven is a good 10 mins walk from the resort. If one is looking for a quiet place to relax, this resort can be placed in your consideration list. 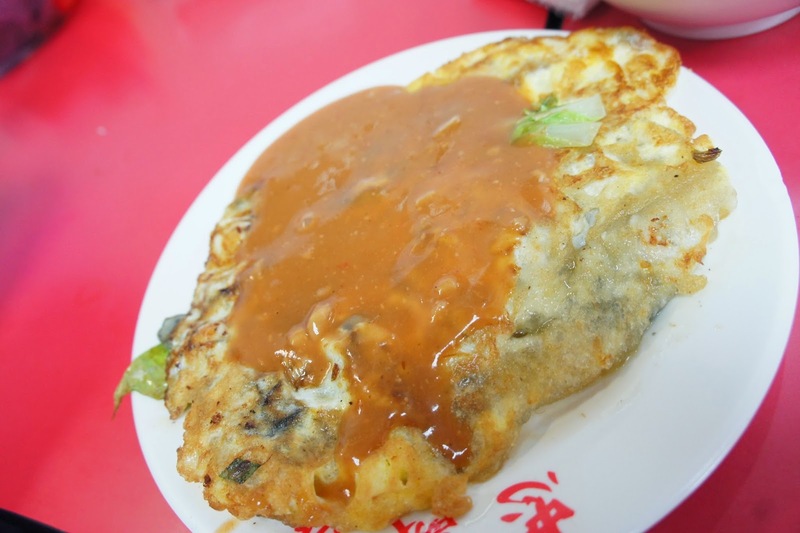 The resort is about 20 mins walk from the famous Phad Thai shop in Phuket. 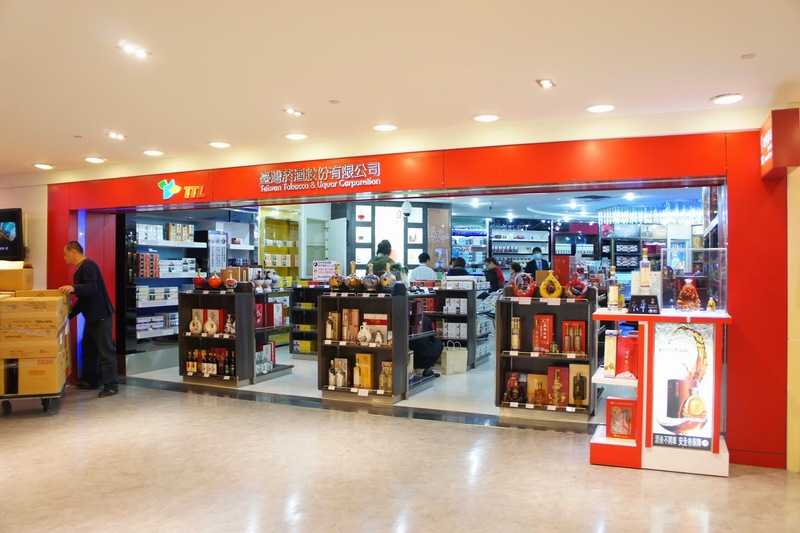 There are some shops about 10 mins walk from the resort selling mostly daily use products. There isn’t much to see or do in the vicinity of the resort. The facade of the resort look aged and run down. The rustic lobby gives guests a feel of being taken back in time to the 60s. 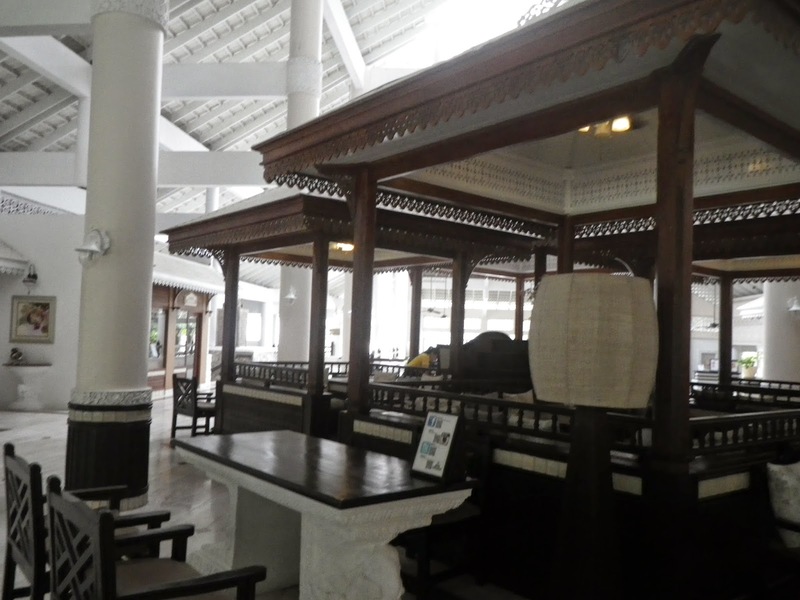 Most of the time the resort feels dark and deserted, perhaps partly due to the period I stay there being the low season for Phuket. After checking-in, we were escorted by a front desk staff to our room. 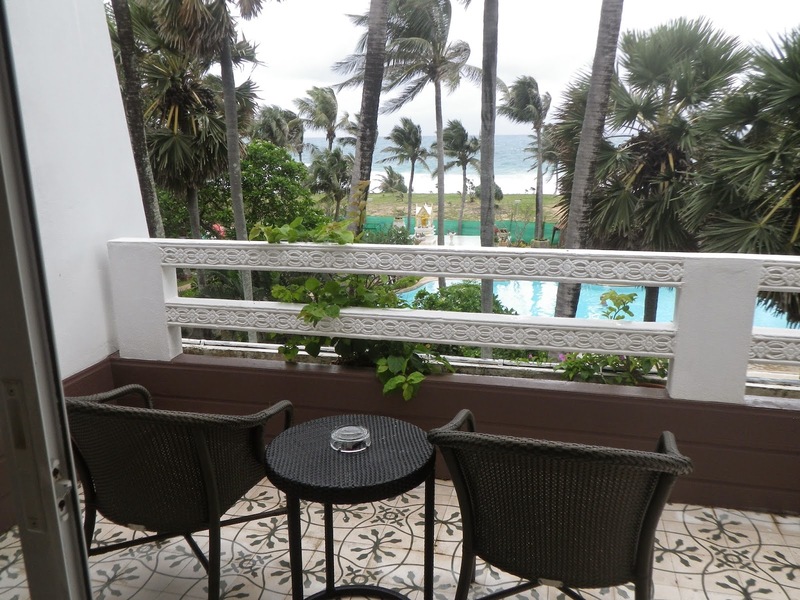 Despite by aged facade of the resort, the Premium Deluxe room, which offers partial sea view, we were assigned to is rather new. The contemporary room seem to be recently renovated, however there are signs of ageing in the room. As one enters the room, one can spot the wardrobe located to the right of the main door. The wardrobe is sufficient for 2 persons to unpack their clothing into. 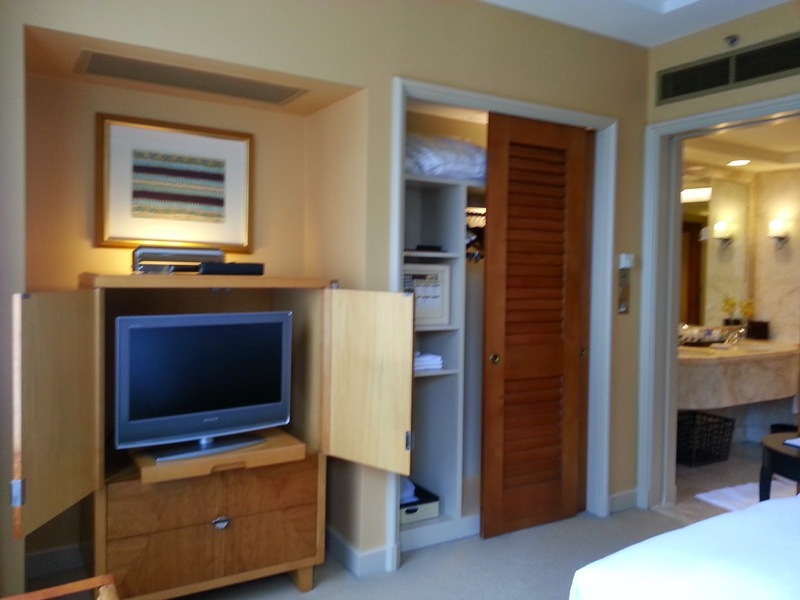 However my friend and I did not utilise this wardrobe much as it seemed aged, this is one of the few areas in the room where the resort did not managed to renovate. Right next to the wardrobe is the mini bar area. 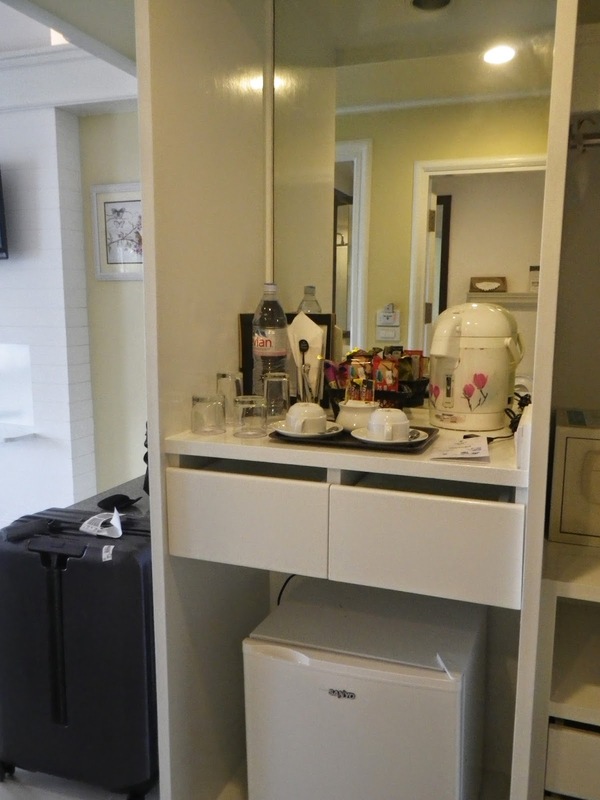 The standard mini bar is where can find complementary coffee and tea, however the rest of the beverages in the fridge is chargeable. We also did not use the electric air pot for water as it looked rusted and dirty. Opposite the mini bar is the entrance to the bathroom. 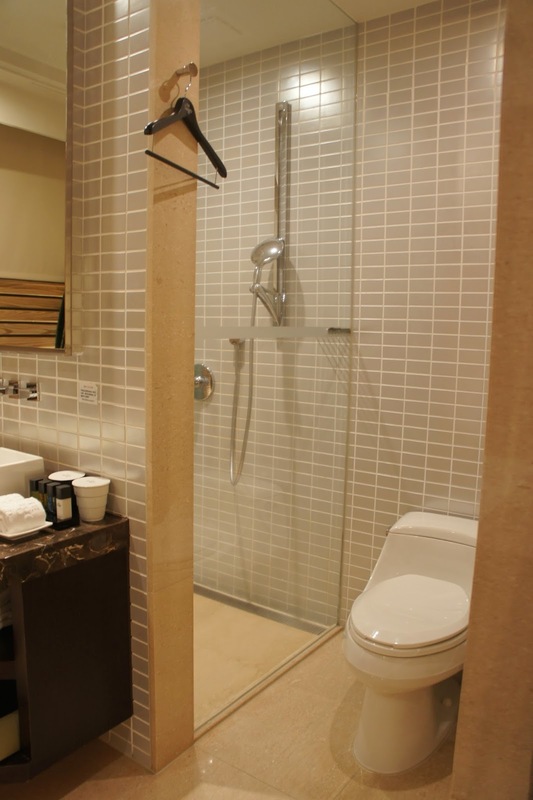 The bathroom provides sufficient space for guests. There is a large glass window in the bathroom, right next to the sink. 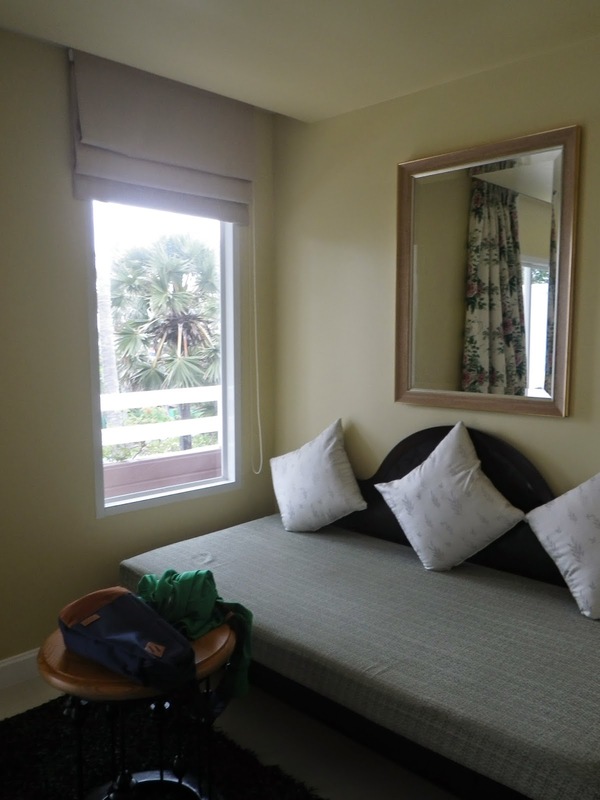 The resort also provided curtains for one to hang for privacy. 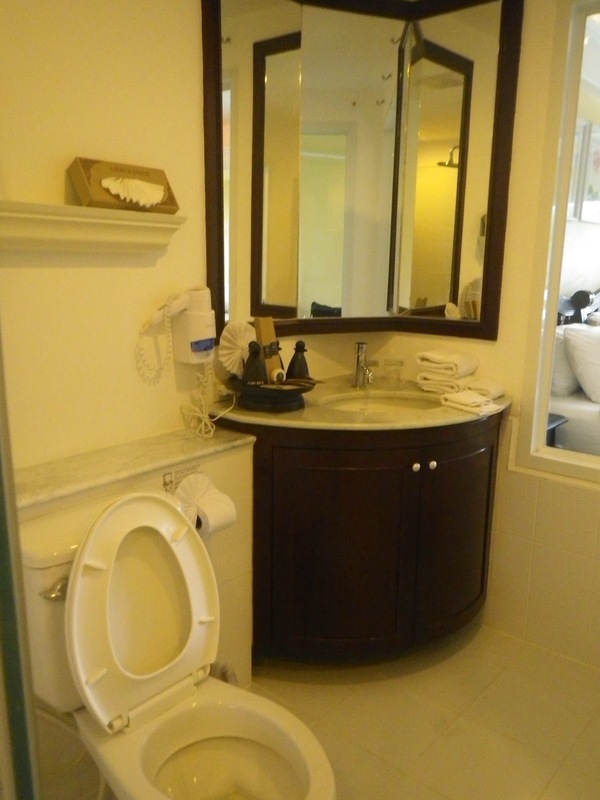 Opposite the door to the bathroom is the toilet bowl and the sink is next to it. This room only comes with walk-in shower. 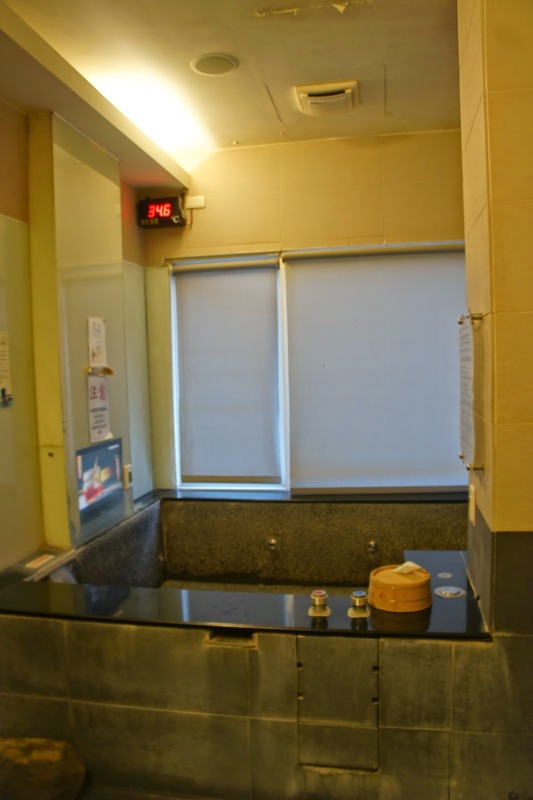 There is a ledge by the toilet bowl, which provides guests space to put their bathing amenities. Walking past the corridor from the main door opens up to the bedroom. The bed room is rather spacious. To the left of the room is where can find the bed. 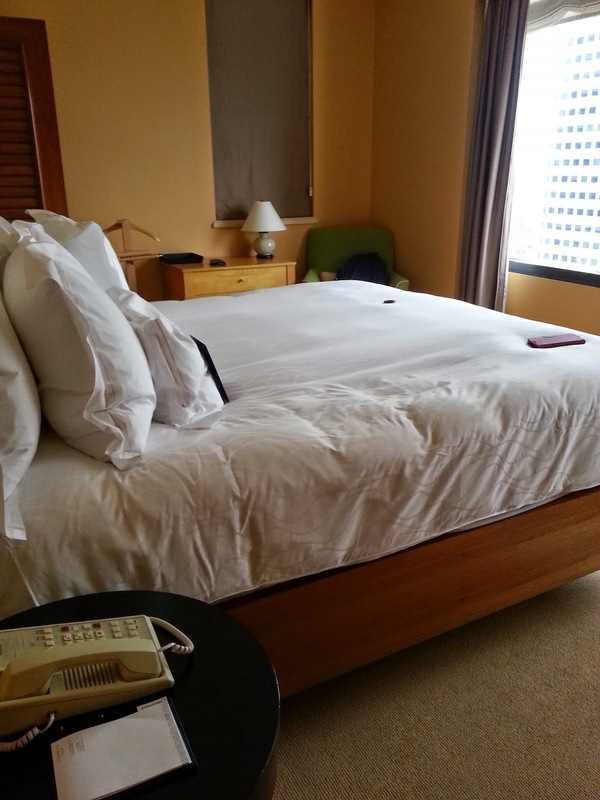 We requested for a king size bed and was given a bed which is a combination of 2 super-single bed. The bed sleep quality on the bed is bad as the mattress is very soft and one can feel the bed frame of the 2 single beds when sleeping. The pillows are also too soft for my liking. Next to the bed is the makeup table, which is of a decent size for female patrons to stow their cosmetics. Opposite the bed is where one can locate the LED TV. The TV only shows local channels and some outdated channels from popular TV shows such as National Geographic and Discovery Channels for free, one would have to pay for the rest of the channels. 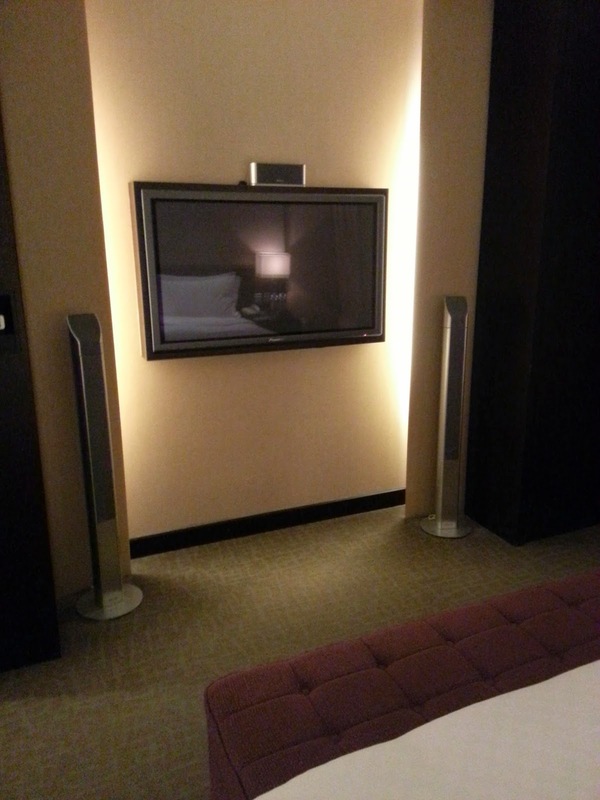 To the right of the TV, and in between the TV and the mini bar area, is a marble ledge where one can stow their luggage. 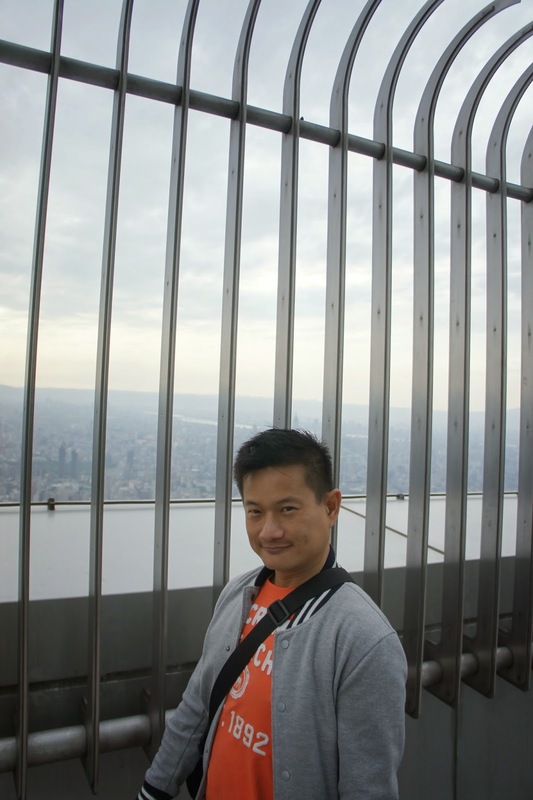 The ledge is large enough to hold one huge luggage or 2 cabin sized luggage. 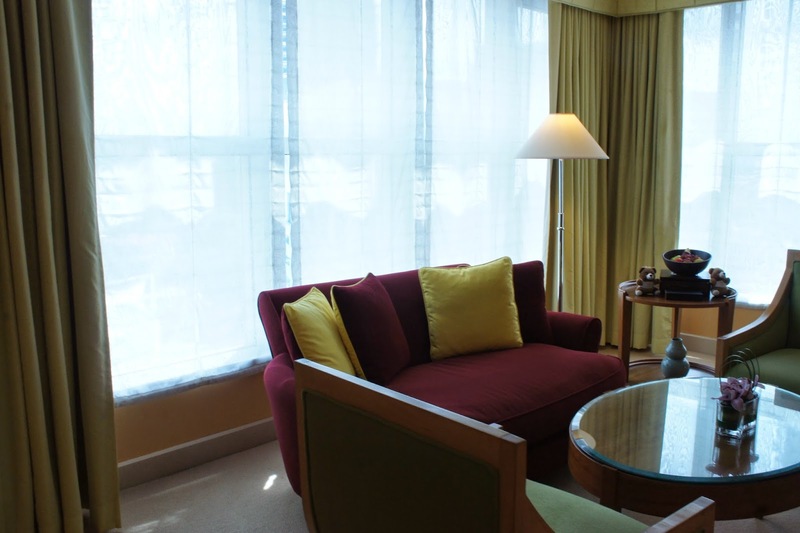 To the left of the TV is a queen size day bed, placed next to a window that looks out into the balcony, this day bed is good for one to relax and laze without messing up their bed. There is a coffee table placed right in front of the day bed. Beyond the makeup table is a glass door that leads to the balcony. The balcony is quite big, taking the entire width of the room. There are a couple of straw made chairs and a table placed on the balcony that looks into the beach a far and the swimming pool below. On a clear day, this is a good spot for guests to see the sunset. We had very minimal interaction with the staffs in the resort. The service in the resort is generally acceptable. Cold drinks were being served upon arrival, and the front desk staff invited us to sit by the lobby while she processed our check-in. It took quite awhile before we were handed our keys. The staff volunteered to show us to our room, despite us rejecting a few times. She was however very friendly, and showed us the way to our room and the various facilities within the resort. 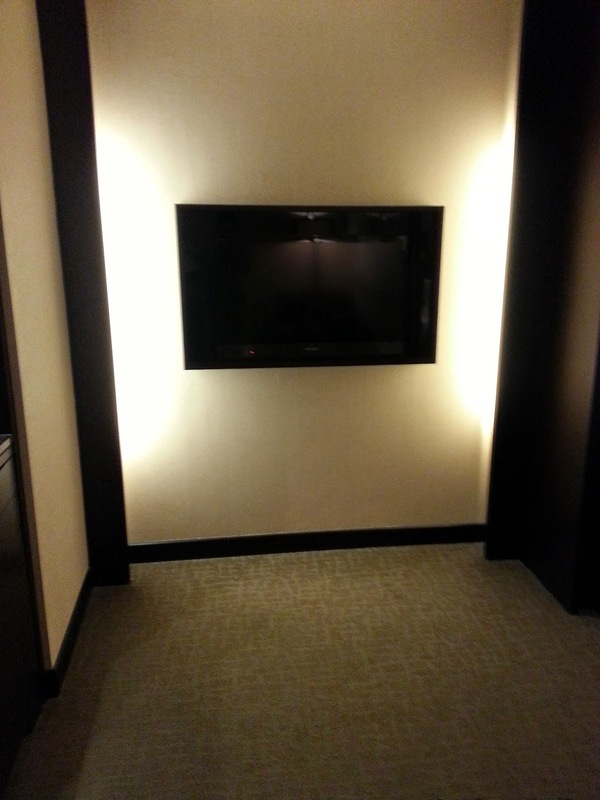 Upon entering our room, she also show us the fixtures in the room. I can sense that she was waiting for tip and seem to refuse to leave without tipping, by going into mindless introductions such as the air port and the toilet bowl flush. We had tipped her to get her off our back. 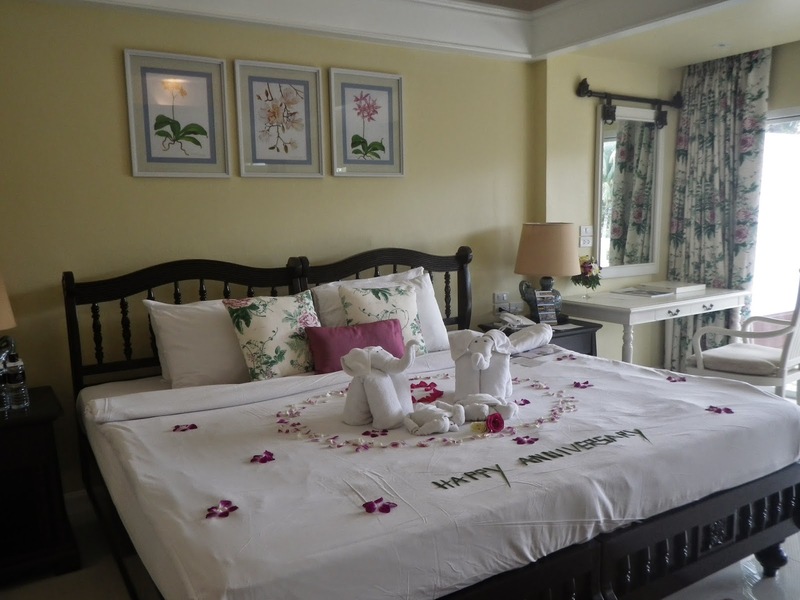 The housekeeping staffs are very friendly and was never stingy with their smiles and greetings. However the same cannot be said of the staffs at the restaurant where breakfast was served. We had to search for our seats as the staffs were engaged in petty gossips amongst themselves, paying occasional attention to guests. The bellboys at the lobby is a nice bunch of people, who truly portrays the spirit of Thais. They are always asking how was our day, where did we go and if we needed help with our luggage whenever we walked past them. 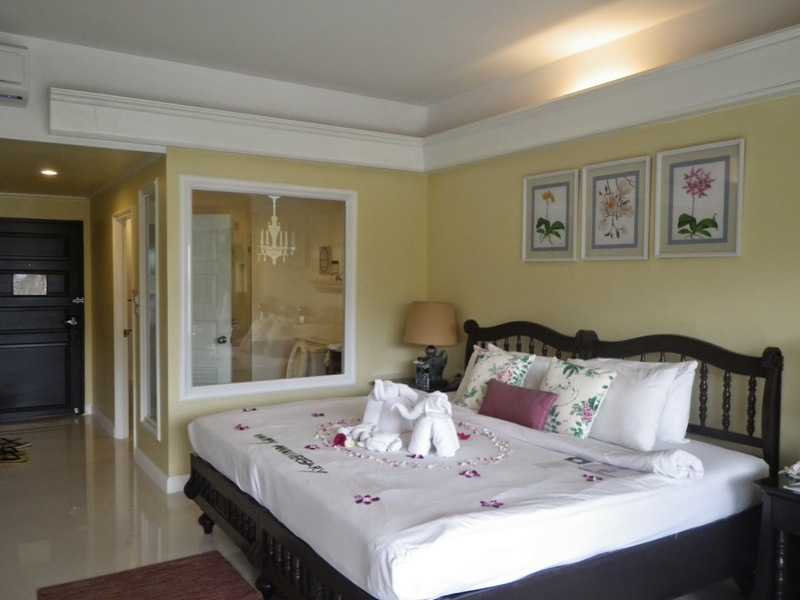 Despite efforts to revitalise the resort, the effort is only restricted to the rooms. The facade and parts of the room still show signs of ageing. The location of the resort is very bad as it is far form everything else. 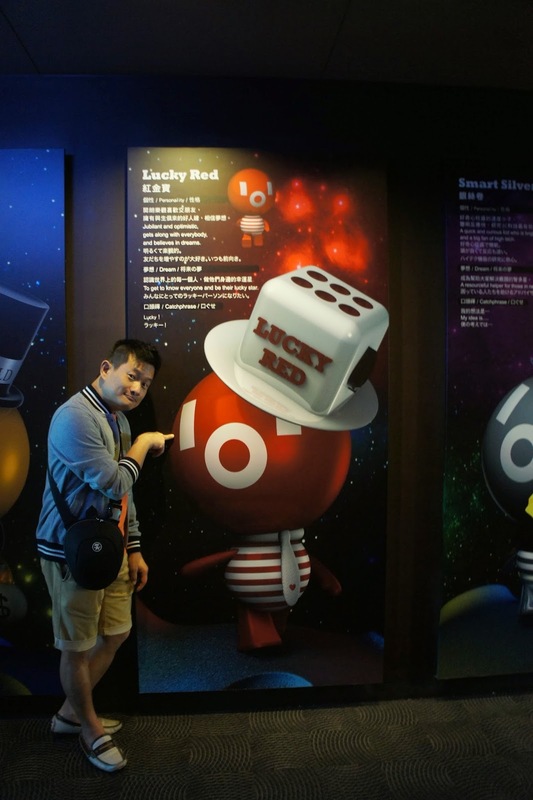 Throughout my stay in the resort, it felt that most of the staffs did not bother to initiate a relationship with guests, rather the relationship building is left to chance. 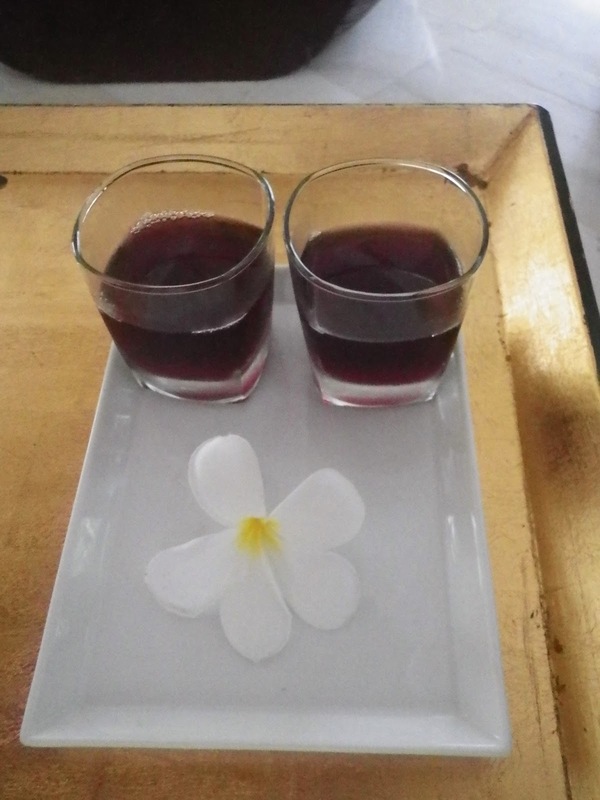 At the period of my stay in the hotel, it was low season for tourism in Phuket, however the attitude of the staffs towards guests seemed to be lukewarm. The sleep quality of the bed is also pretty bad, despite being a spacious room. This resort is not worth staying. 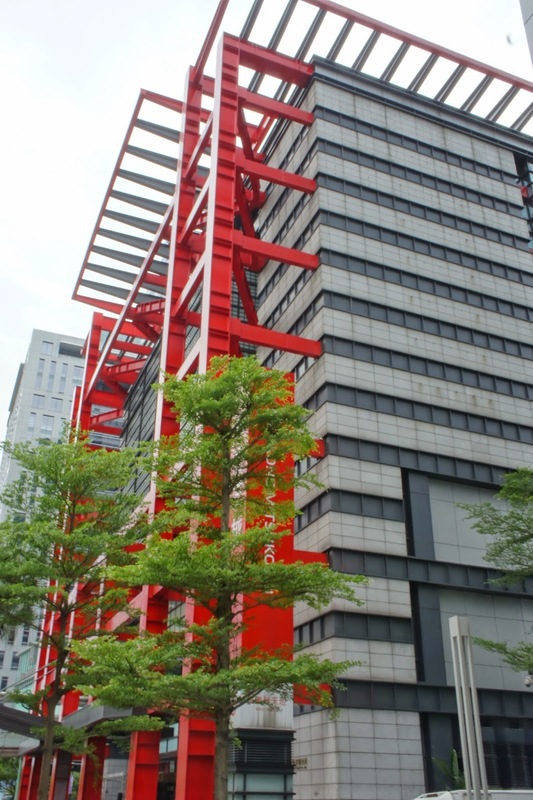 Conrad is located next to the Millennia Walk Shopping Mall as well as the Suntec City Shopping Mall and a stone’s throw from the Marina Shopping Centre. 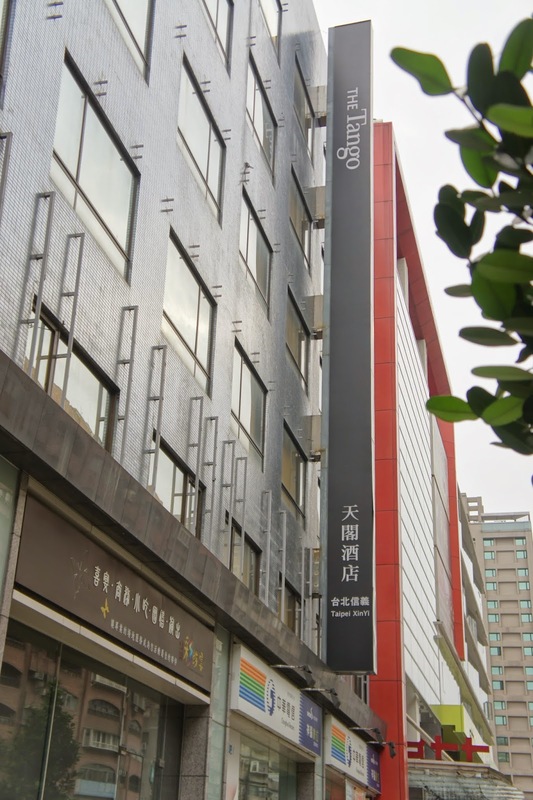 The hotel is a great place to stay for those who prefer a convenient location with links to the subway stations and lots of shopping around. 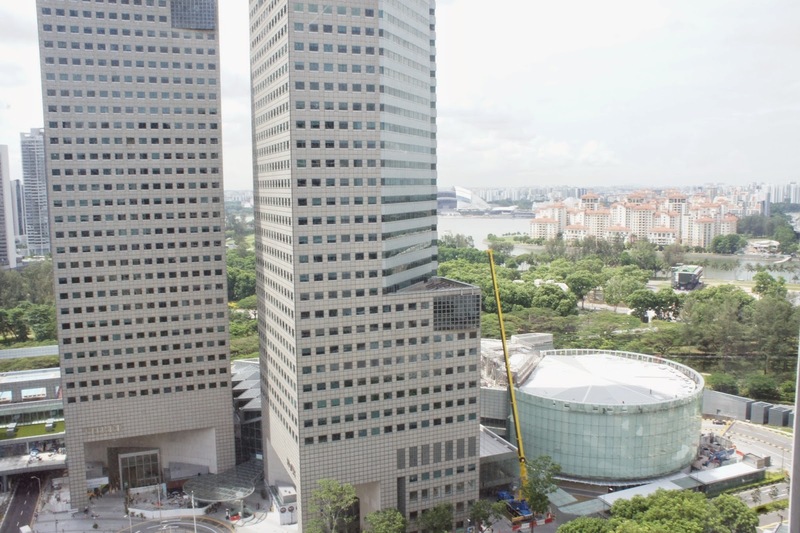 The subway station is accessible via Suntec City Shopping Mall. 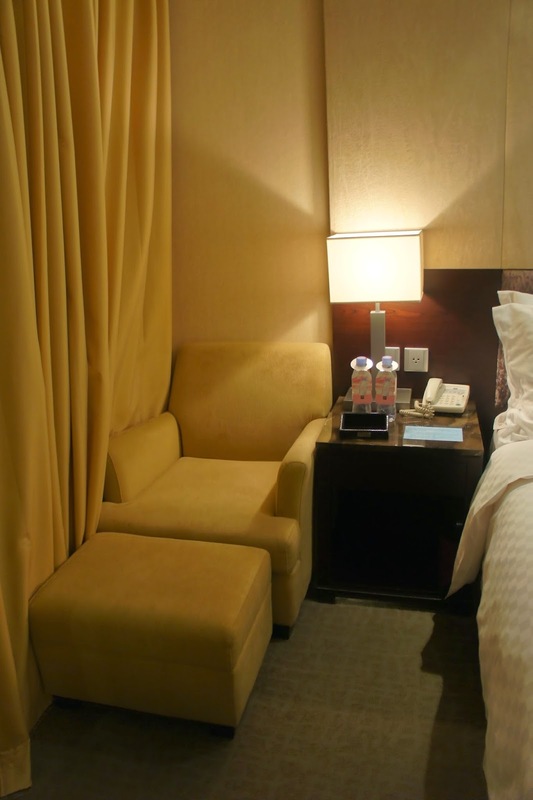 I checked into the One bedroom Executive Premier Room, also known as the Centennial Suite. Once entering the suite, a small corridor decorated with sculptures by the walls leads guests into the living room. The first thing that caught my eyes is the study desk. Here is where one can find a couple of powerpoint outlets to charge their electronic gadgets. Making a turn to the right, one would find the living area of the suite. The chich living room is the home of a 2-seater couch decked in maroon colour, coupled with 2 single seater olive coloured armchairs. 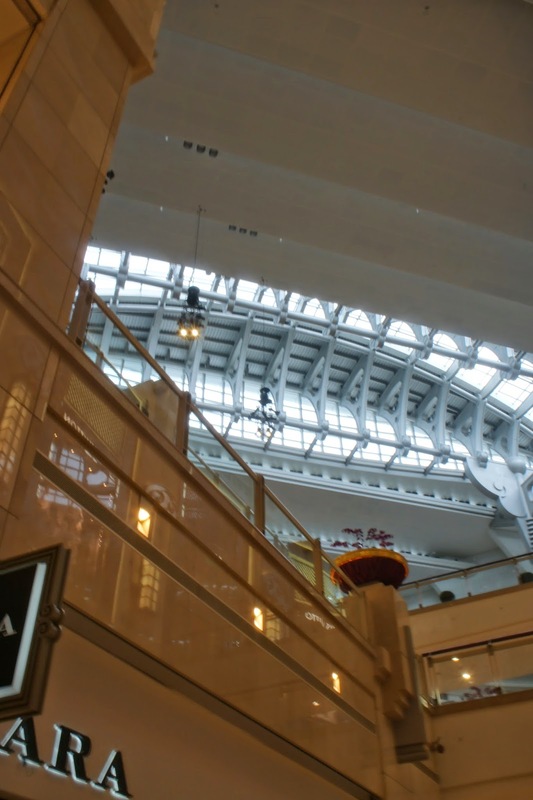 Behind the 2-seater couch is where one can find the floor to ceiling windows that peeks into Suntec City Shopping Mall. Right between the 2 armchairs is a coffee table and a side table, decked with welcome tropical fruits. 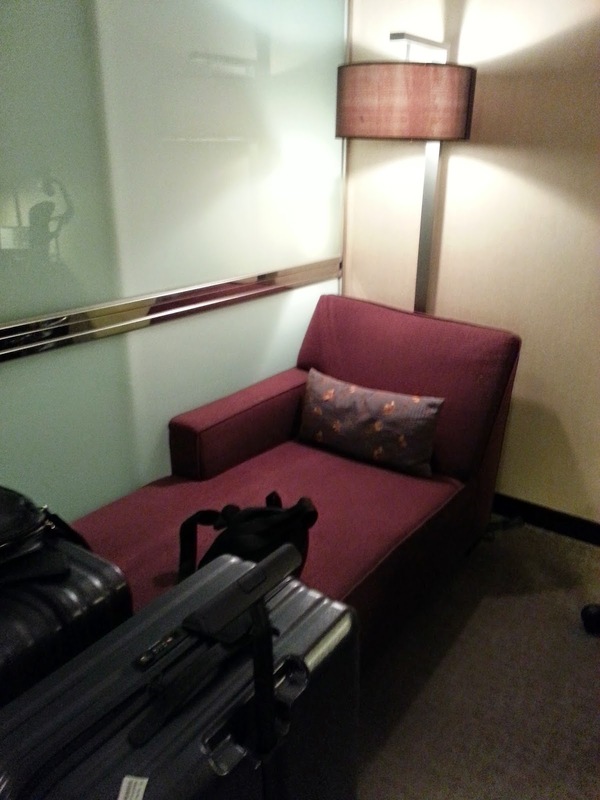 There is also a small wall side table behind the armchair that is closer to the door to the bedroom. In front of the 2-seater couch is a large cabinet housing the entertainment system., The minibar and glasses are hidden on the right side of this cabinet. On top of the cabinet is a large 46″ LCD TV. 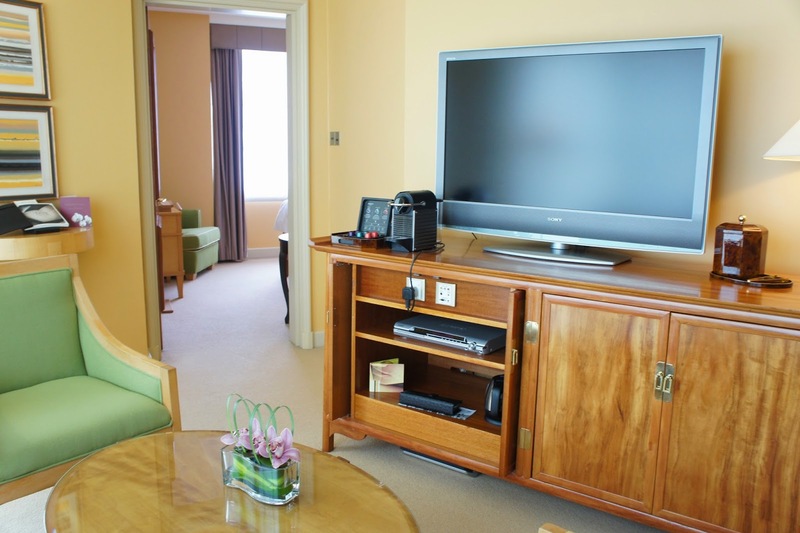 The TV is controlled by a all-in-one remote controller that also controls the radio, the DVD player as well as PC connections. 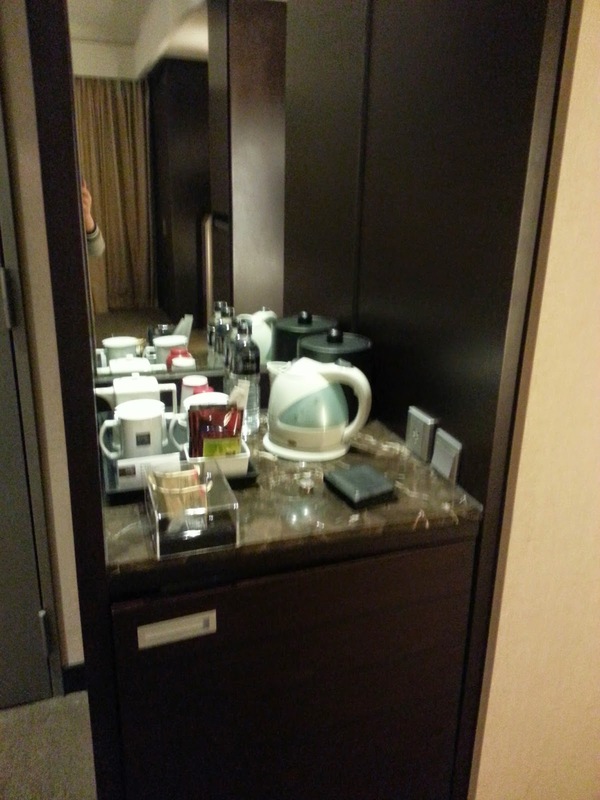 One can also find a Nespresso Coffee machine on the cabinet. 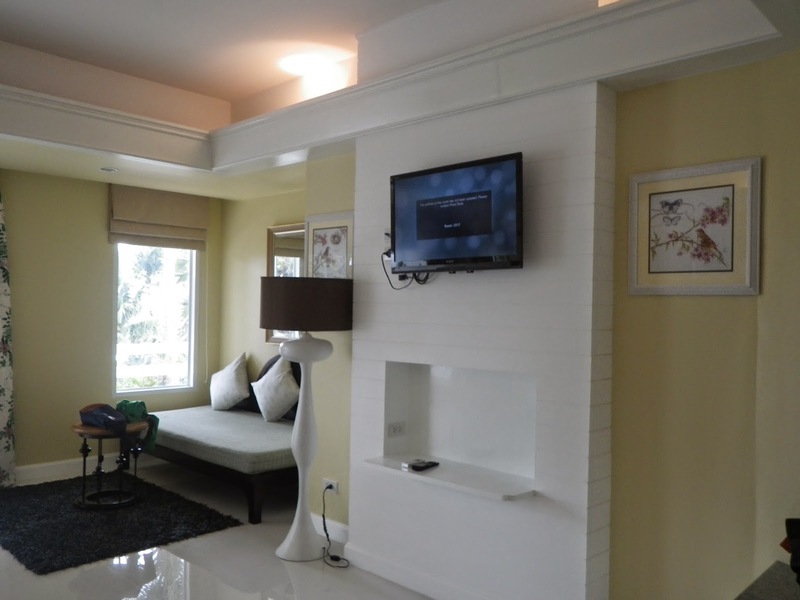 The living area is a great place to hang out and laze around. There are extra blanket and pillows inside the wardrobe in the living room. 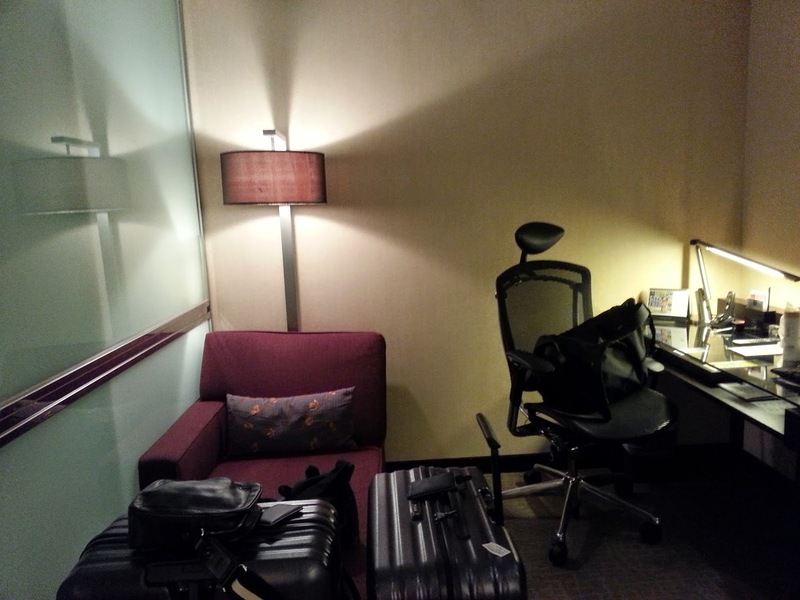 This part of the suite feels rather cluttered as the living room is a tad too small to fit the amount furniture. Having said that, one can still find space to move around the living room. Between the wall side table and the TV cabinet is a door leading into the bedroom of the suite. Here is where one would be ushered into slightly more space. Upon entering the bedroom, a 3-drawer dressing table greets guests. Next to the dresser is a single seater armchair, placed in front of the floor to ceiling windows in the bedroom. The centrepiece of the bedroom is a king-sized bed. The firm mattress provided me with a great night’s sleep. 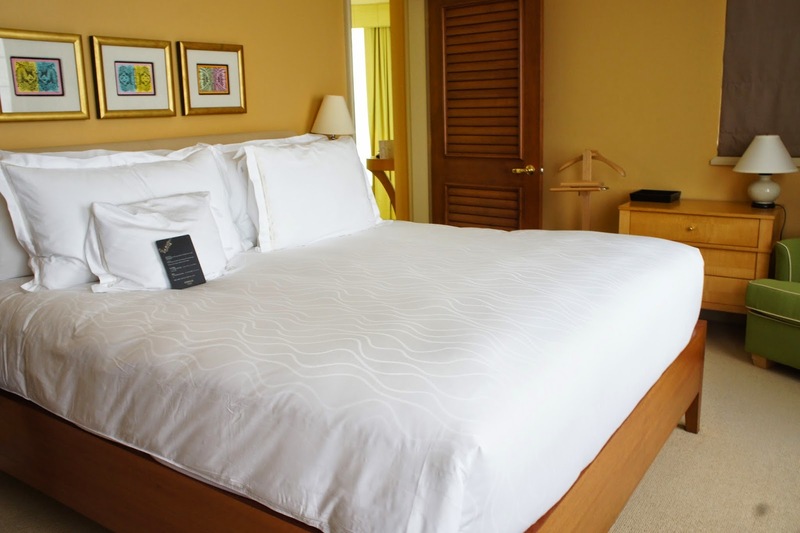 The hotel also provides a menu of pillows for guests to choose from for an excellent night sleep. There is a TV cabinet in the bedroom, which is placed in an awkward position. The placement of this cabinet does not allow guests to watch the TV properly. Next to the TV cabinet is the wardrobe. The wardrobe is rather modest in size, however the presence of the dresser ensured ample space for guests to unpack their clothing into. 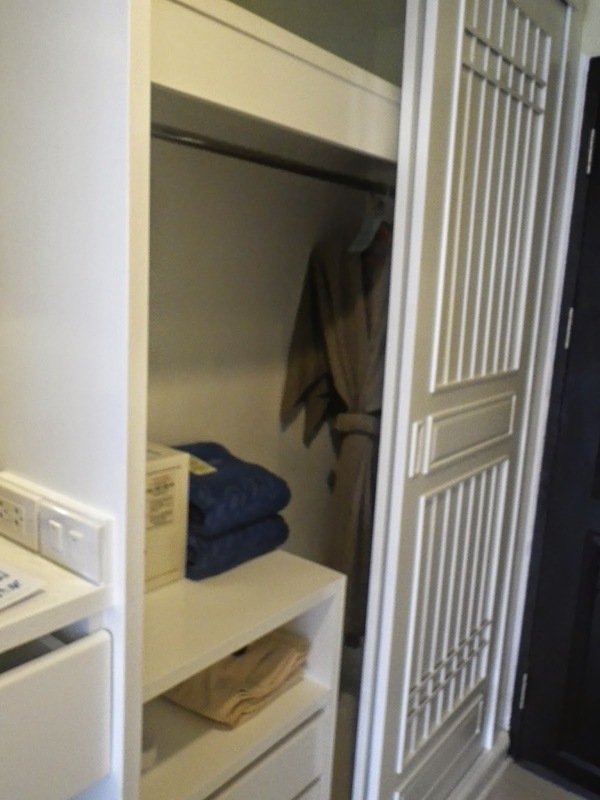 Between the bed and the wardrobe is a door that opens up into a large marble decked bathroom. 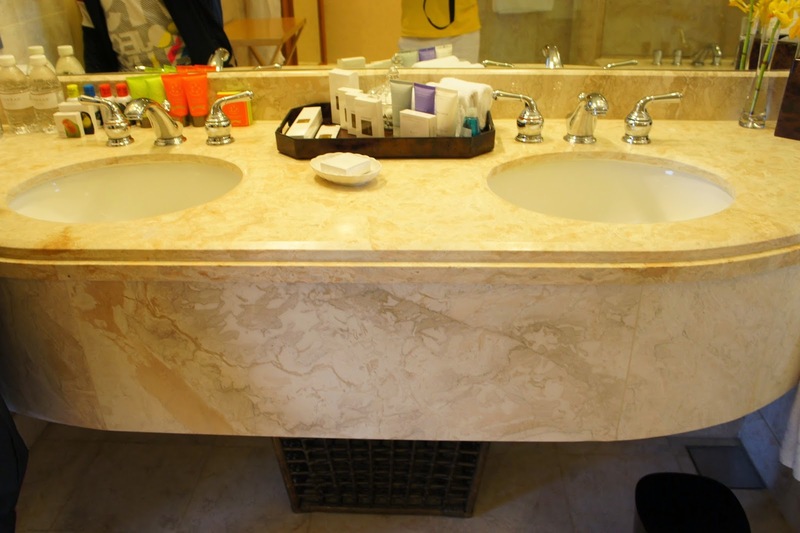 Most of the amenities can be found in the sink area. 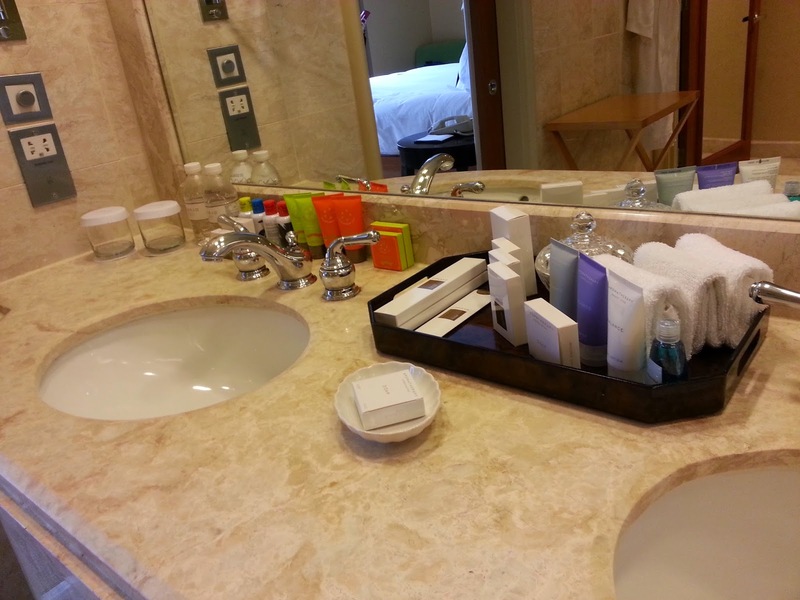 There are ample space for one to place their toiletries and cosmetics onto. 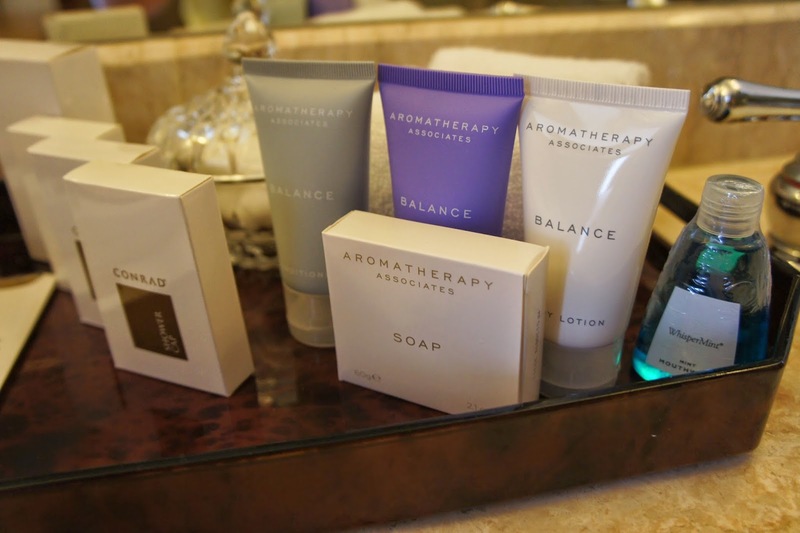 The hotel provided 3 brands of bathing amenities for guests to choose from. 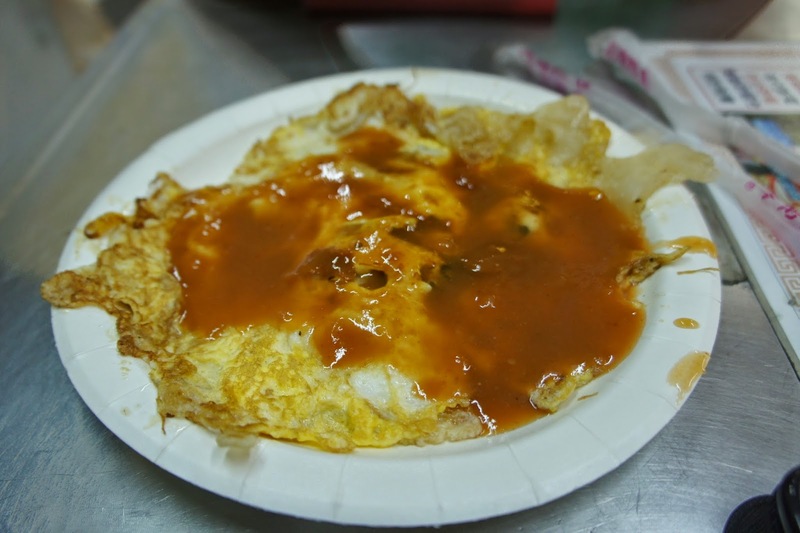 I prefer Shanghai Tang, which is available only upon request. Opposite the door to the bathroom is a large bathtub. 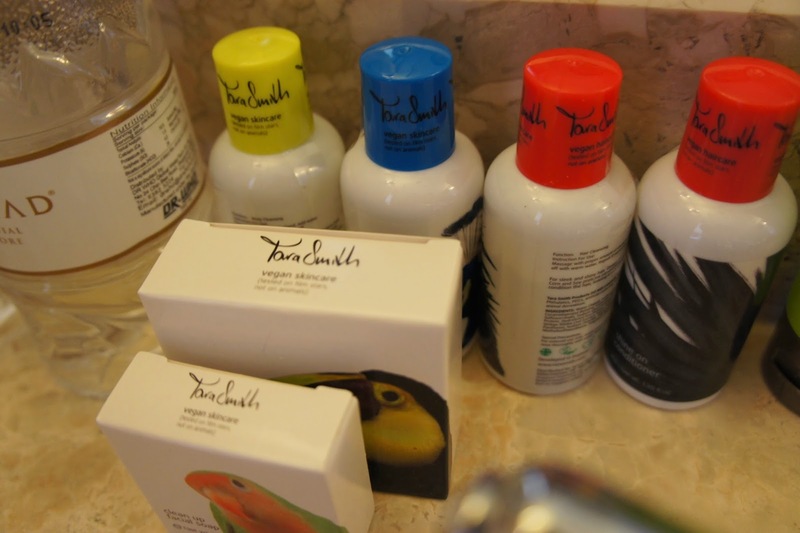 Conrad Hotel also provides bath salt, which is topped up daily by the housekeeping staff. 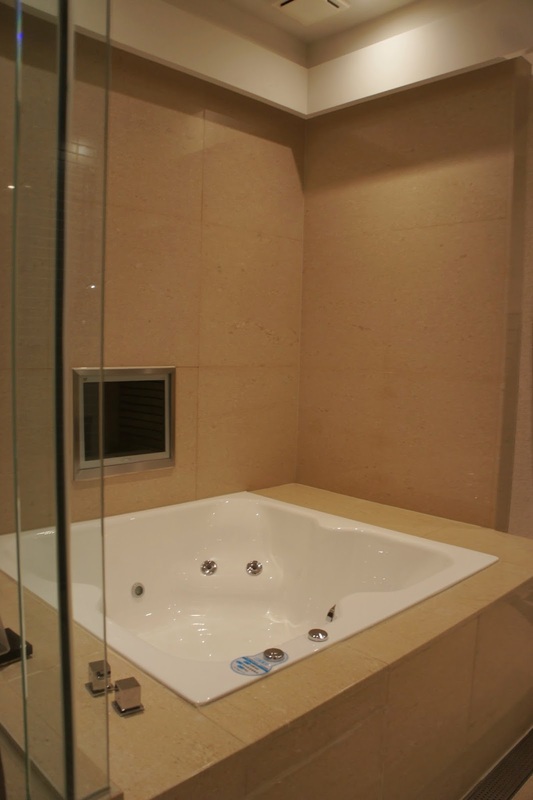 There is also a rubber ducky provided for guests to play with while soaking in the luxurious feel bathtub. 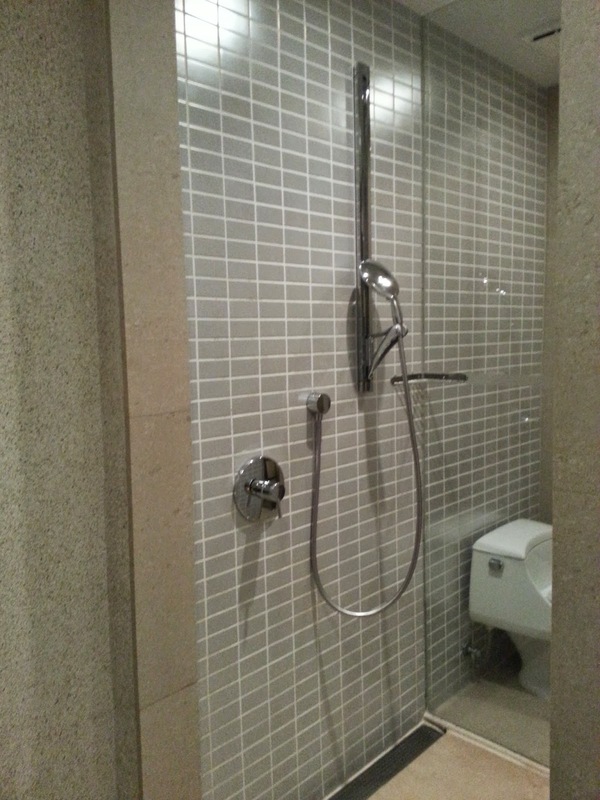 Next to the bathtub is a walk-in shower, which is very spacious and comes with a massaging shower head. 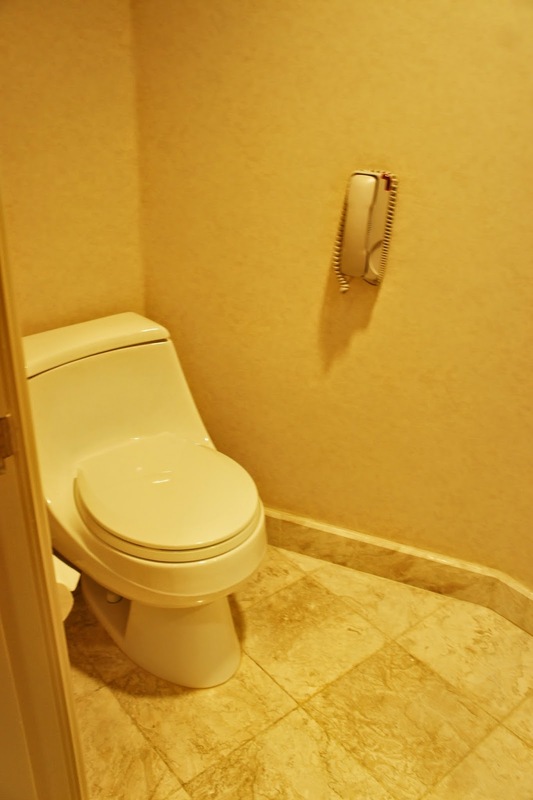 The toilet bowl is found in a separate room within the bathroom, next to the walk-in shower. The suite is very comfortable and is a right size for a party of 2. However the suite is not without its flaws. The powerpoint, other then the one on the study desks, are positioned in rather odd places in the suite. Heavy users of electronic gadgets have to plan a charging schedule in order to be able to continue using them. There are no powerpoints in the bedroom, other than that used for to power lamps and TV. There are also no external HDMI connections other than that found on the back of the TVs. Only outdated VGA port is found on the TV cabinet in the living room. 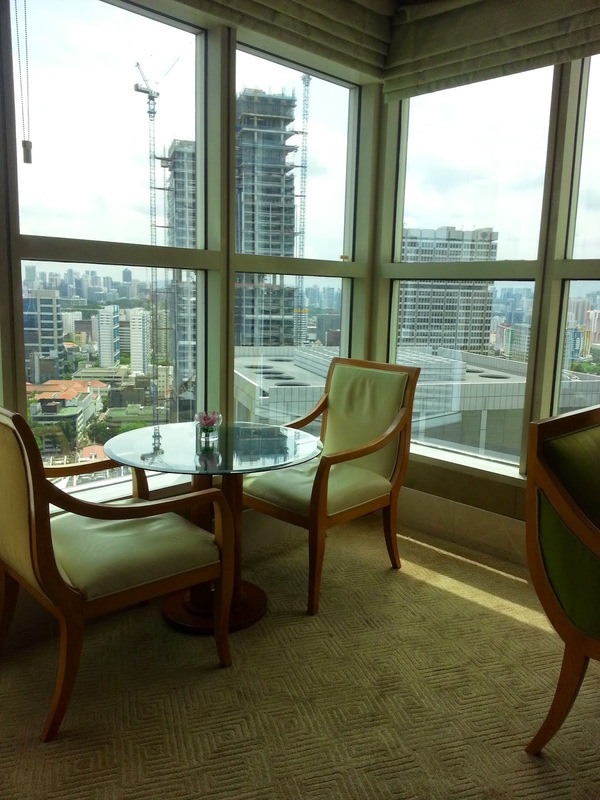 Guests staying in the Centennial Suite are entitled access to the Executive Lounge located on the 31st floor of the hotel. The lounge has a strict dress code of smart casual for guests to abide by. There are limit seats in the lounge, however Conrad Hotel opens up the library and the meeting room to cope with the guest volume when needed. The lounge serves afternoon tea and evening cocktails daily. The lounge is open for guests to pop by and enjoy complementary beverages and snacks outside the afternoon tea and evening cocktail timings. 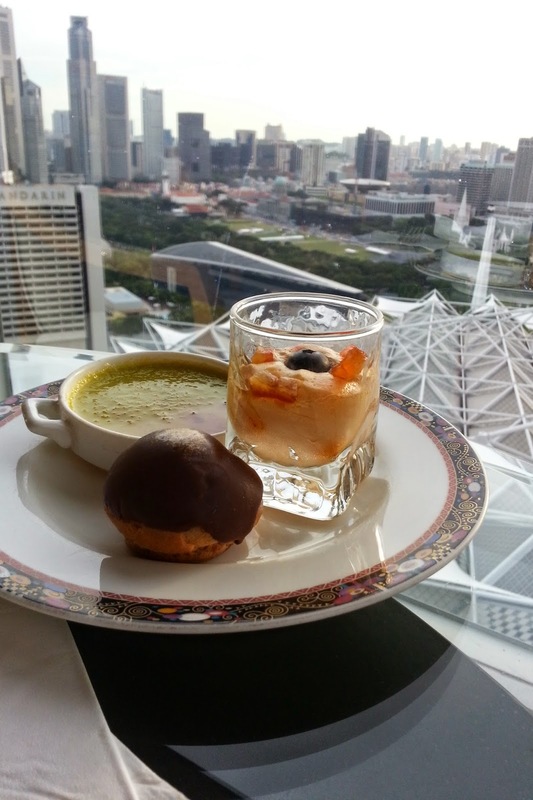 The service standard seem to vary during my stay at Conrad Centennial Singapore. 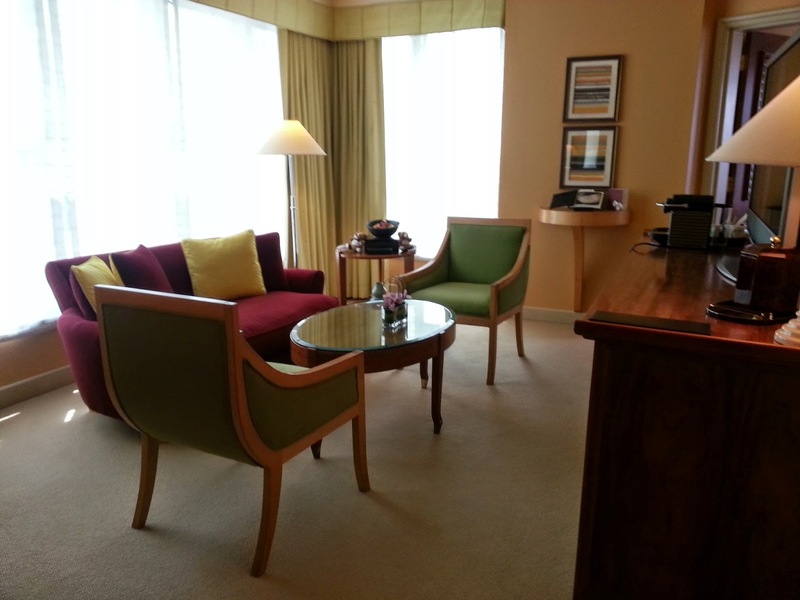 Guests staying in the Executive Premier Suite can opt to check in at the Executive Lounge. Check in was a breeze and I was promptly served by the professional staff during check in. The hotel website stated late check out is available to 6pm. When I checked with the staff, I was told that late check out can only be extended to 2pm. 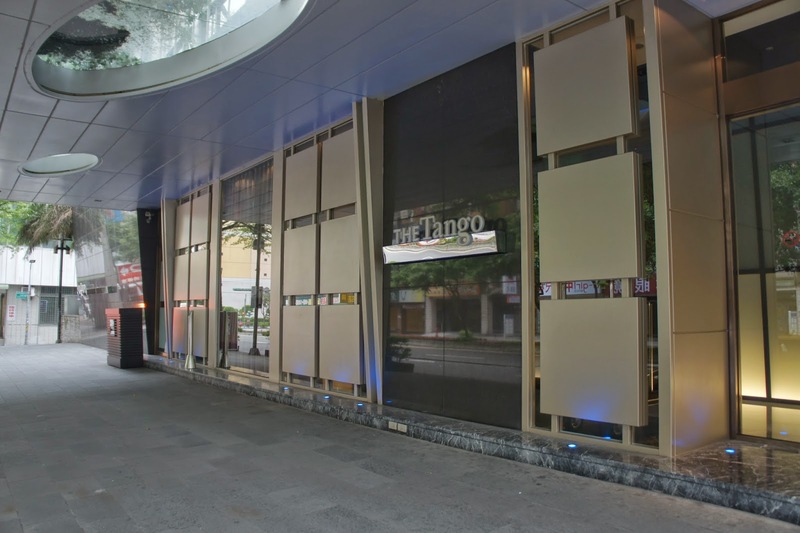 Upon checking with the staff, on the 6pm as stated in the hotel’s website, she reluctantly mentioned that she will get back to me. However a good 8 hours passed and my late check out request seem to turned to deaf ears. I resorted to check with the reception on the ground floor and was promptly granted late check out at 6pm. 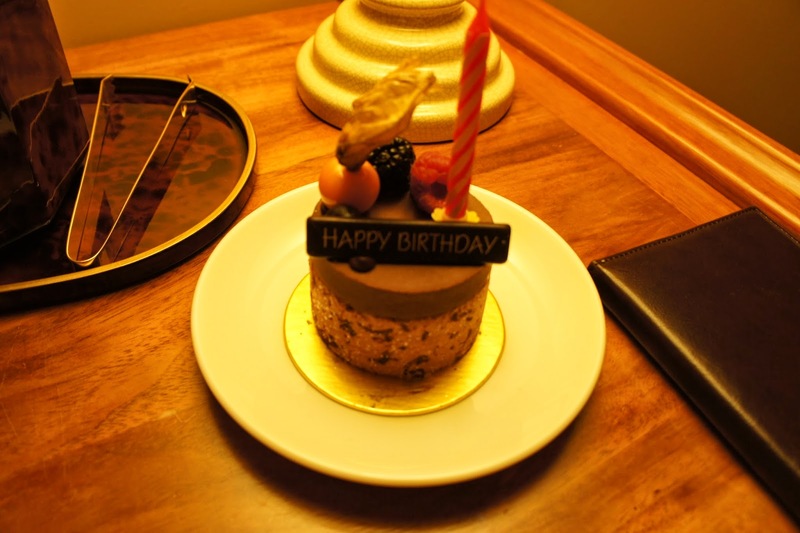 As I was celebrating my birthday during my stay at Conrad Singapore, the treatment for my birthday seemed underwhelmed, a stark contrast to what I had read on TripAdvisor. There wasn’t special greetings during check in, despite my friend highlighted the purpose of our stay weeks prior to arrival at the hotel. The hotel provided a very small birthday cake, which is only good for one person. The staff at the Terrace Cafe does not seem too interested in building relationship with guests. I been to the cafe 3 times, none of the staffs bothered to greet me despite appearing doing nothing. They also appear to be disinterested in assisting my choices for food. 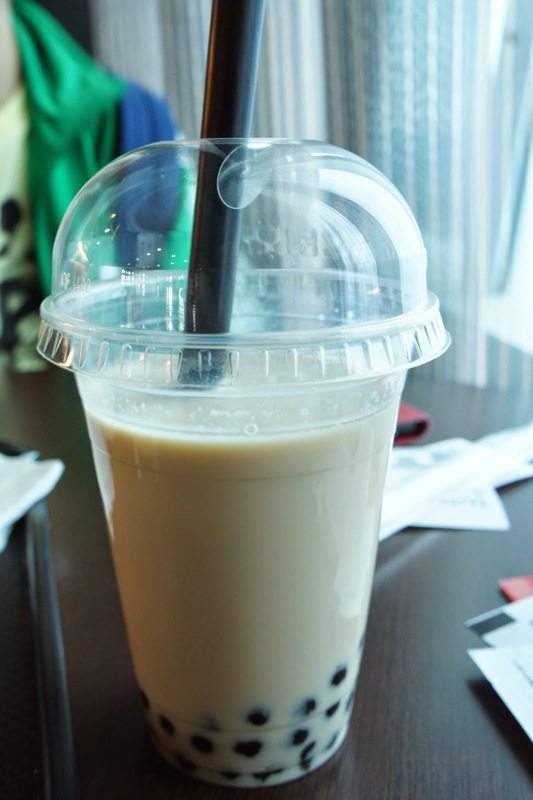 I am sure that the staffs saw me when I was in the cafe, and all the times I was met with cold shoulders. My initial impression of the staffs at the Executive Lounge was negative. 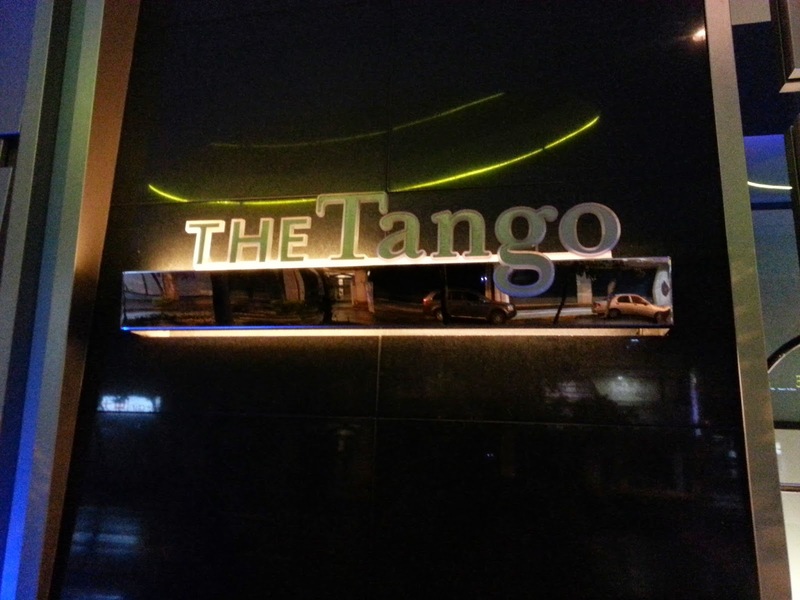 During my first few visits to the lounge, none of the staffs offered to help me and my friend in getting a seat. These staffs did not even approached us to take orders for our drinks. We had to help ourselves and figure out where the drinks are located in the lounge. All these while, the lounge was not crowded at all. During afternoon tea and evening cocktails, our table was overflow with plates and none of the staffs bothered to clear our table. We had to signal to the staffs to make space for us on our table. 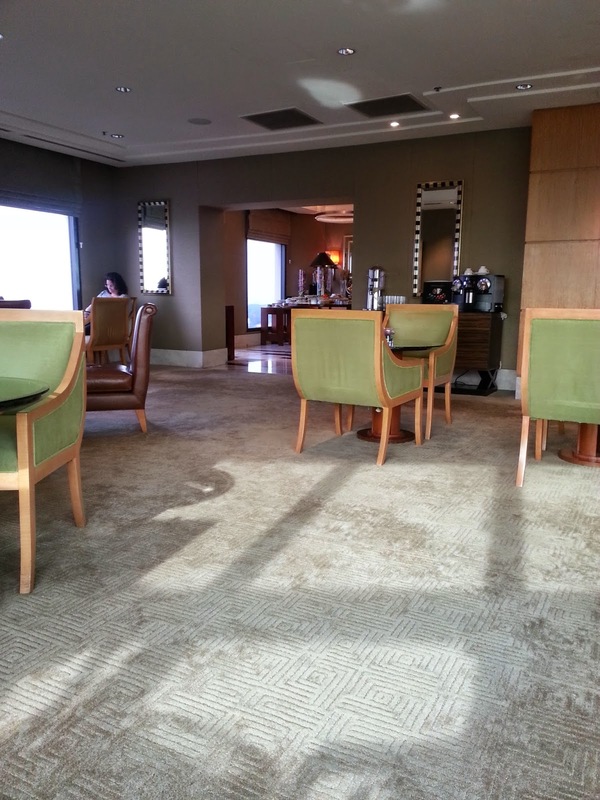 Staffs at the lounge are seen standing around like statues or chatting among themselves. 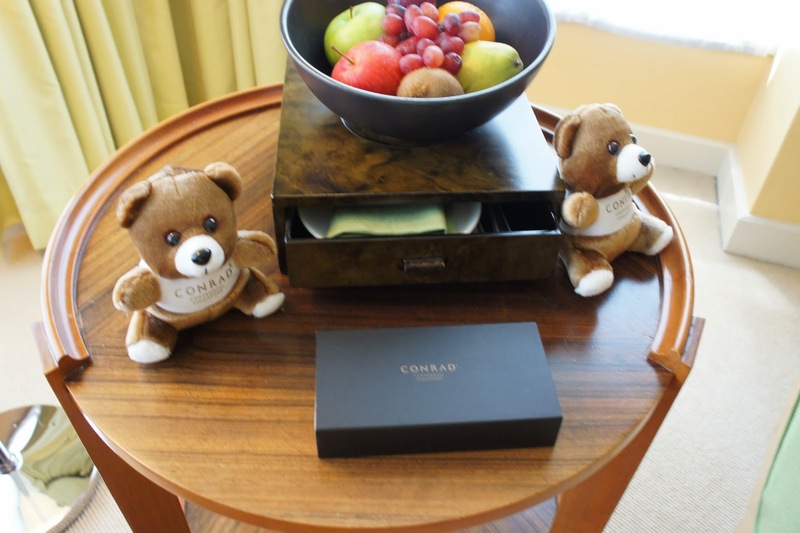 There are some staffs that made a difference during my stay at Conrad Centennial Singapore. 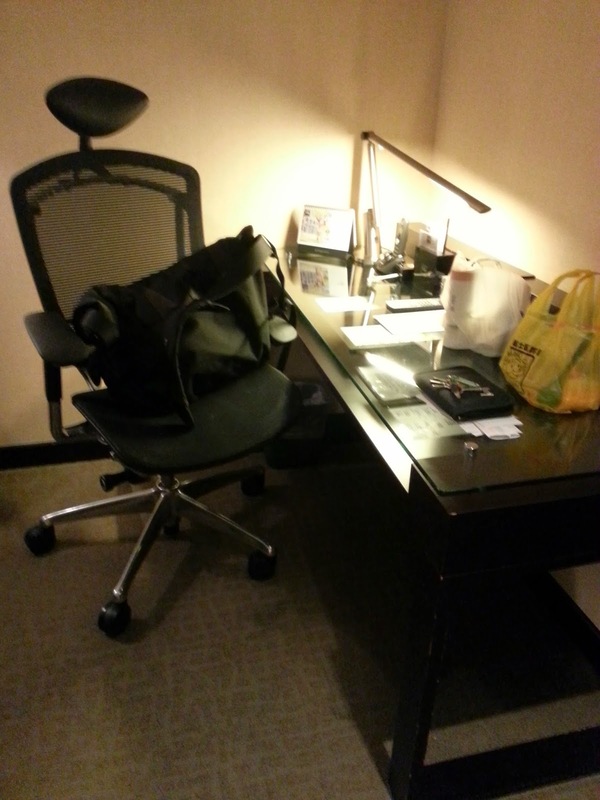 We met a housekeeping staff, Mdm Goh who was friendly and ensured the supplies in our suite is sufficiently topped up. We were pleasantly surprised that she offered to make up our suite on the day of our check out, which most hotels do not even offer. Mdm Goh never failed to greet us with a smile and checked if our supplies are sufficient in the suite for our usage. She also never fails to check if we are sufficiently comfortable during our stay whenever we bumped into Mdm Goh. 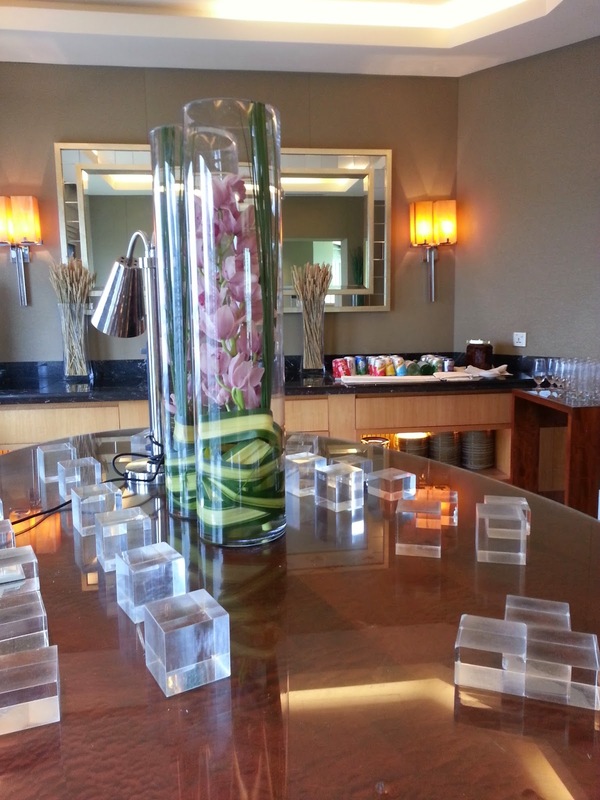 There are also a few staffs in the Executive Lounge that also make a difference. Stacia, with her bubbly personality, jumped into action and quickly offered us drinks during one of our visits to the lounge. She constantly popped by our table to see if there are empty plates on our tables and promptly clears them. At the sight of our drinks are finishing, Stacia would appear to offer us more drinks. Another staff from the lounge, Christine, was fun to chat with. 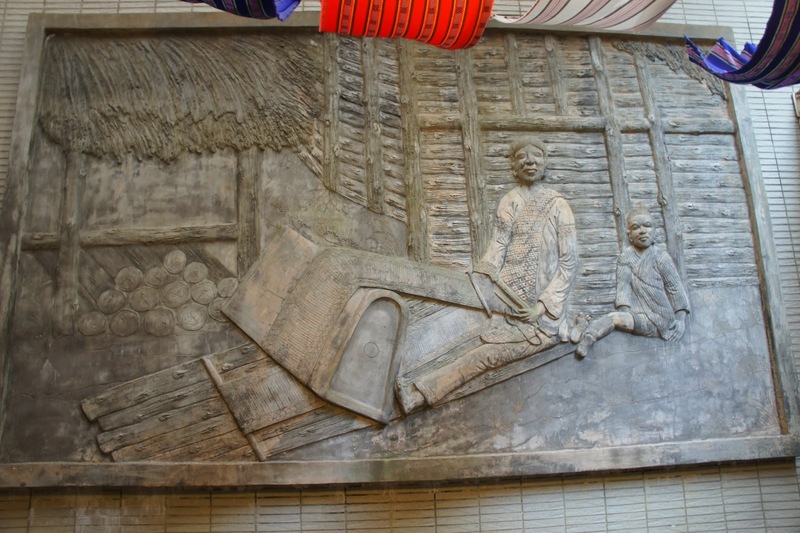 She was knowledgeable on the hotel and shared with us the numerous art pieces in the hotel. During our check out, Christine even sent us off from 31st floor to the ground floor. 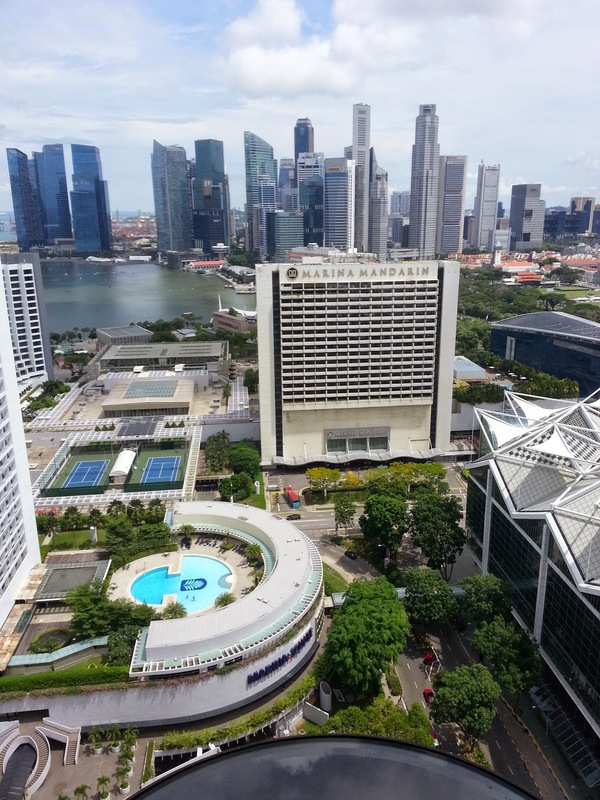 Conrad Centennial Singapore is well appointed in terms of its location. The suite was comfortable and I had excellent sleep quality. The suite despite being chic, seem outdated in the gadgets. The service I have experienced is mixed and seem to be dependent on which staff we met in the hotel. 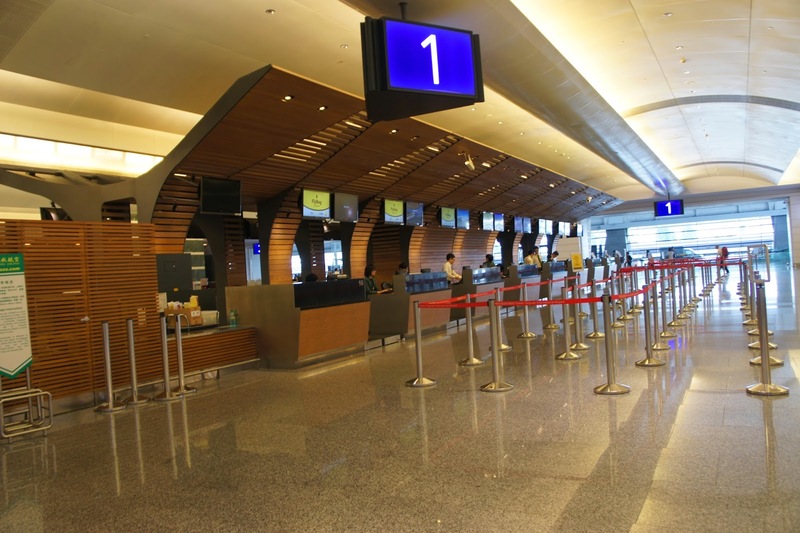 Scoot check-in counters are located at the first row of Terminal 1 in Taipei. As we were one of the last passengers to arrive at the airport, checking in was a swift. Despite us being rather late for for checking in, the ground staff who processed our check-in was claim and composed and reassuring. He kept reassuring us we will make it in time for boarding in a claim manner. We were pleasantly surprised that we were being upgraded to Stretch seats. 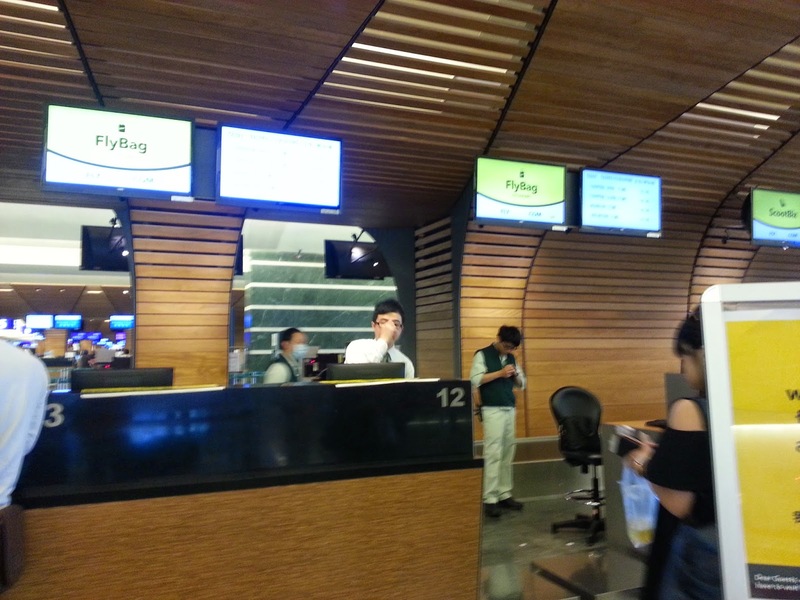 Before leaving the counter, the staff pointed out the gate and the time for us to be at the gate for boarding. Scoot uses 777-200s for all their flight. All the aircrafts in the Scoot fleet is decked in the standard 3 classes, namely Business Class, ScootinSilence, and Economy Class. We were promptly welcomed onboard and shown the aisle that will lead us to our seats. The legroom for the stretched seat are decent, and I can see we got an extra or 2 inches as compared to the rest of the seats. These yellow seats were located up front in the Economy Class section. The seat boasted a 86cm (or 34in) seat pitch, which allowed me to stretch onboard the aircraft. The seats are rather comfortable for the short 4-hour flytime to SIN. 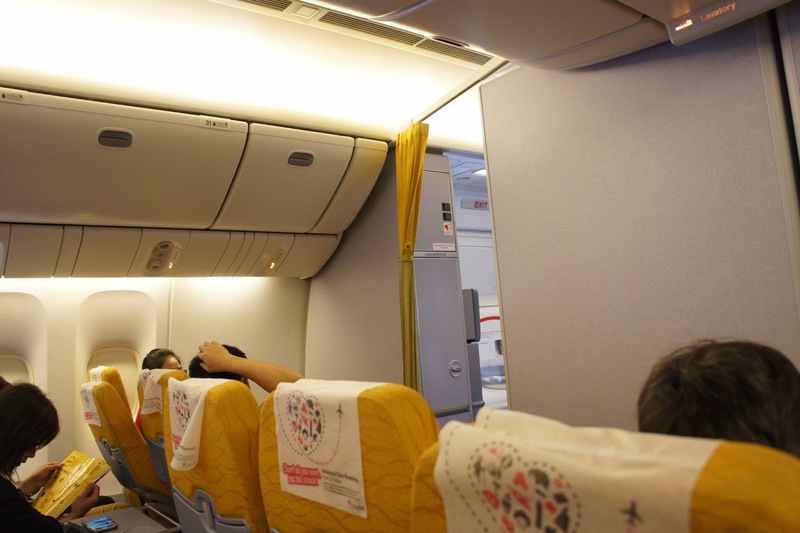 There are no personalised entertainment onboard Scoot flights, controls of the seat is only limited to the button for one to adjust their seating position. 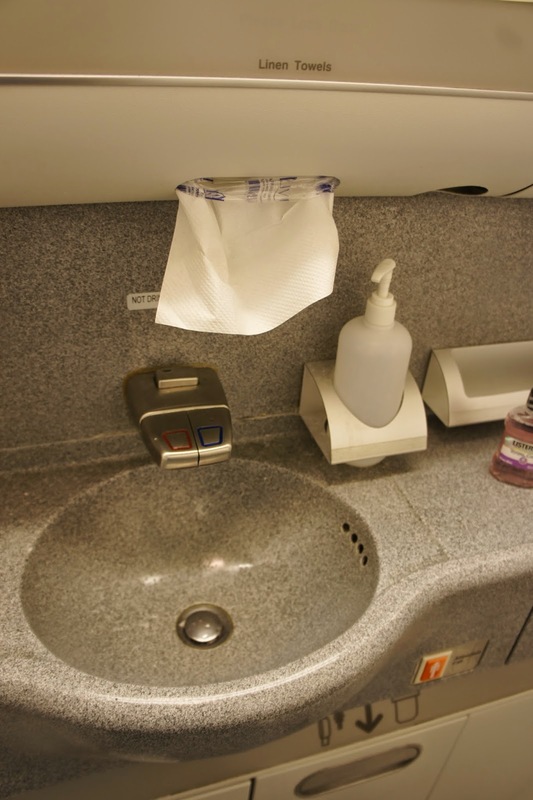 Lavatory onboard this section of the aircraft is located in the front section between ScootinSilence Cabin and Economy Class Cabins. 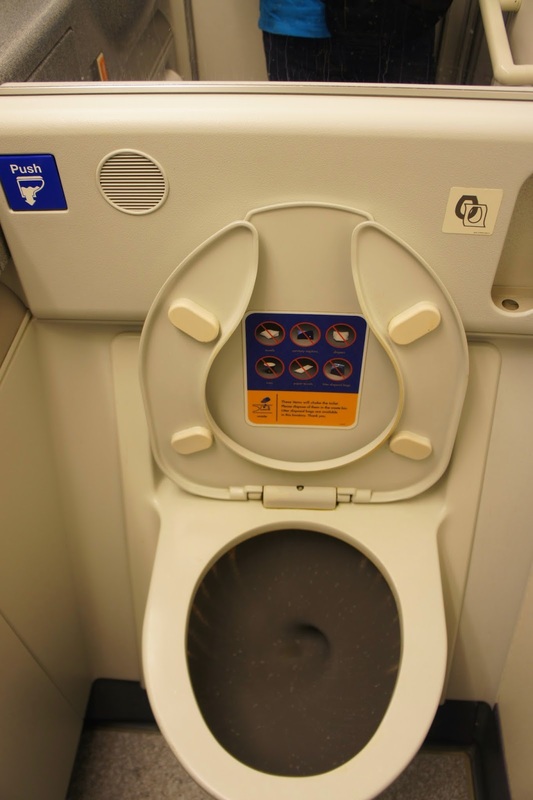 The lavatory has the standard Economy Class amenities that one can expect in any other airlines. Service onboard is rather prompt. about 30 minutes after taking off, the crew came by with our pre-ordered food. The food portion is rather small, sufficient as a snack more then a proper meal. Having said that, the food that we bought is rather tasty. Cabin crew will request your boarding pass and check off before serving food. 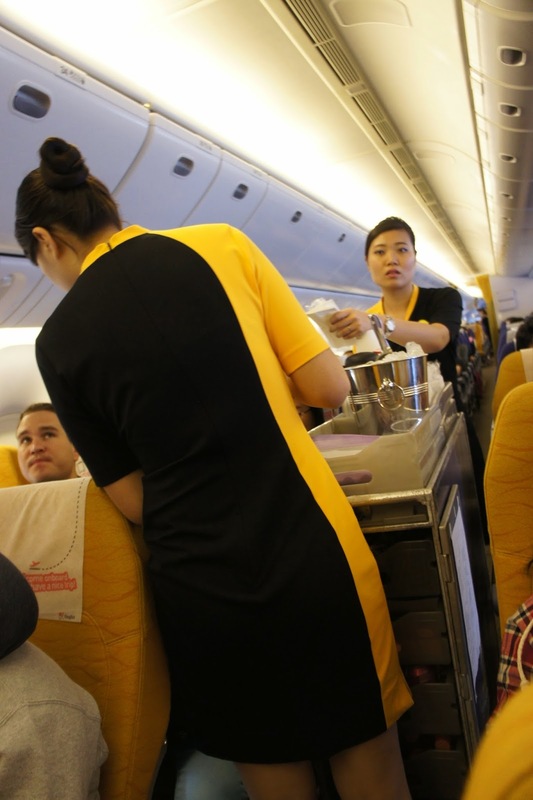 Cabin crew is also seen selling food and duty free to passengers onboard. 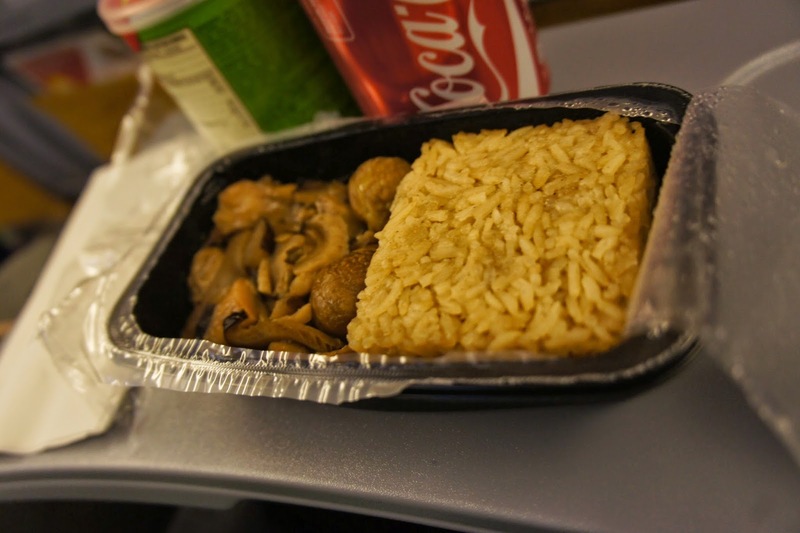 The crew cleared the tray in good time, allowing passengers to slowly enjoy their food. Scoot is a no-frill airlines, one only pays for the seats. Anything extra is chargeable, from food to comfort kits and even check-in baggage. Scoot is a decent choice and is certainly above the rest of the budget carriers. The seats are rather comfortable for the 4 hour flight. 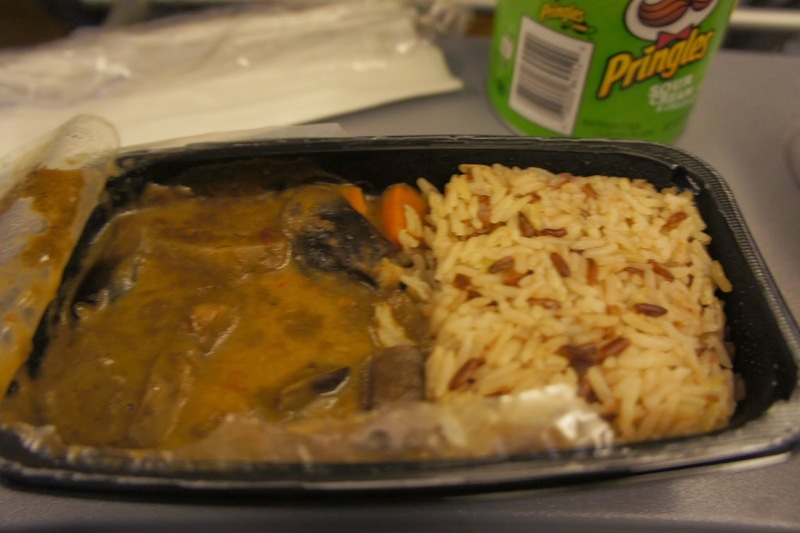 The food portion is rather small, other passengers who pre-order food are seen buying extra snacks. 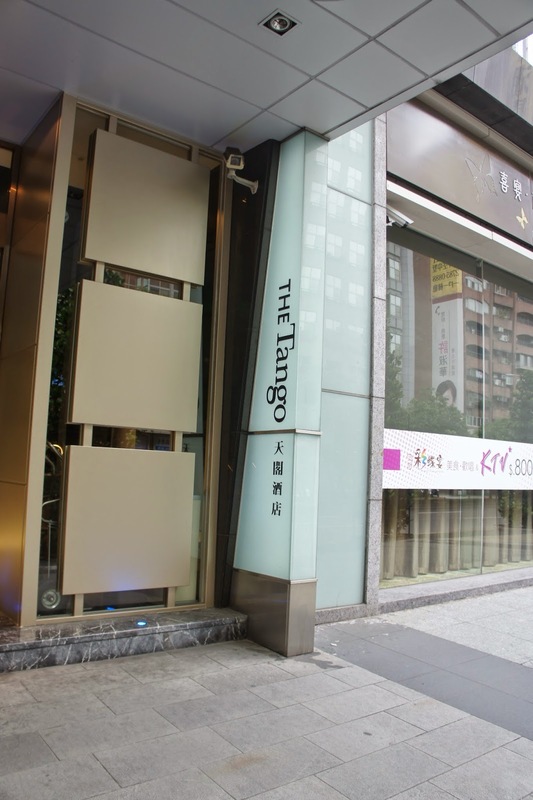 Tango Xinyi is located near downtown Taipei, within mere minutes walk to YongChun Subway station. 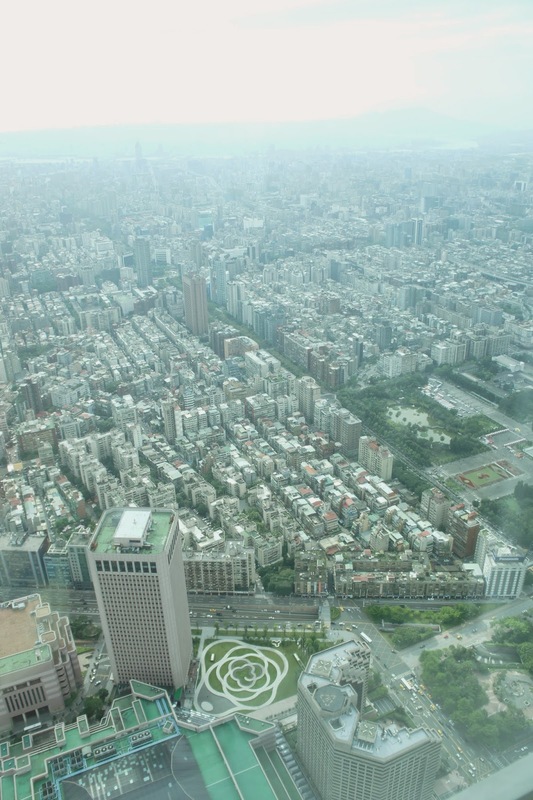 The subway station is within a few stops from the main Taipei Subway station. 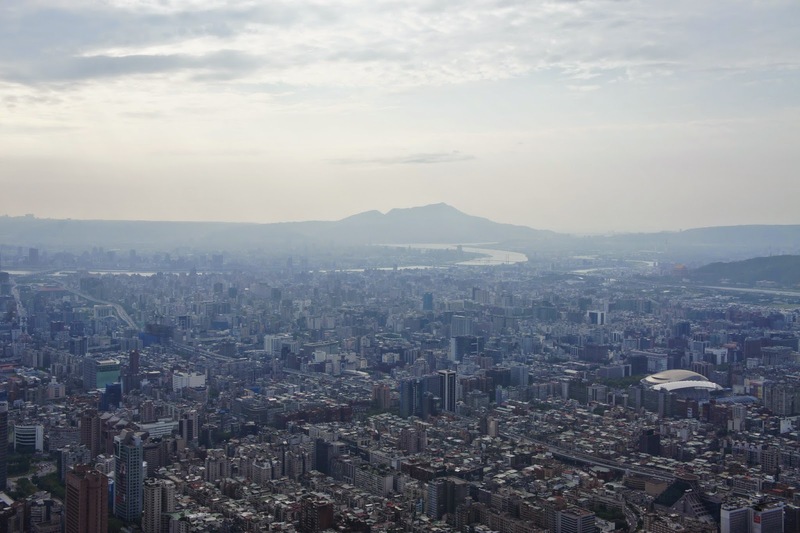 With the subway system in Taipei, the hotel is conveniently located within reach to major parts of Taipei via the subway. There are several banks and 24hour marts around the hotel. The location is rather quiet and seem to be located in a local neighbourhood. 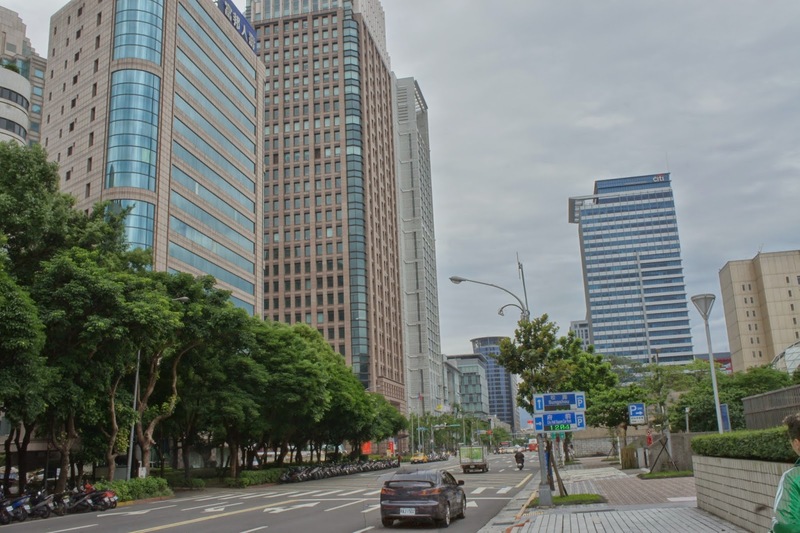 There isn’t any mega shopping malls within walking distance from the hotel, however with the subway system, it makes staying in this hotel convenient. The hotel seem to be falling part perhaps due to poor maintenance. We were checked into our suite (having made to pay extra half a day’s rate) and discovered the door to the wardrobe come loose. When my friend and I were getting ready to head out to explore the city, we discover the door was about to give way. 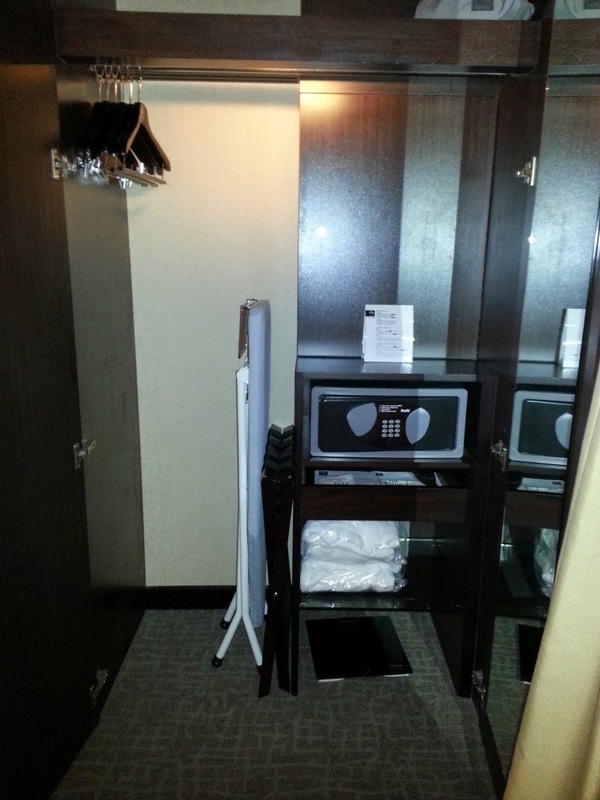 When we returned to our suite at the end of the day, the entire wardrobe door was missing. We contacted the hotel reception, whom subsequently changed our suite for us. As we thought this might be a one-off incident, my friend and I were soon being disappointed even with another suite being assigned to us. The hardware of the hotel suite was decent. The decor is contemporary and comfortable to be in. However if you are looking for a window room, do not bother. Even the Eagle suite, though there are windows, those pathetic panels are only good to let sunlight in. It is placed so high that one can’t even see through it. The curtain between the bathroom (Where the only window is located) and the bedroom is only blocked my fairly thin sheets of curtain, which sunlight would still pass through. There a glass door between the bathroom and the bedroom. 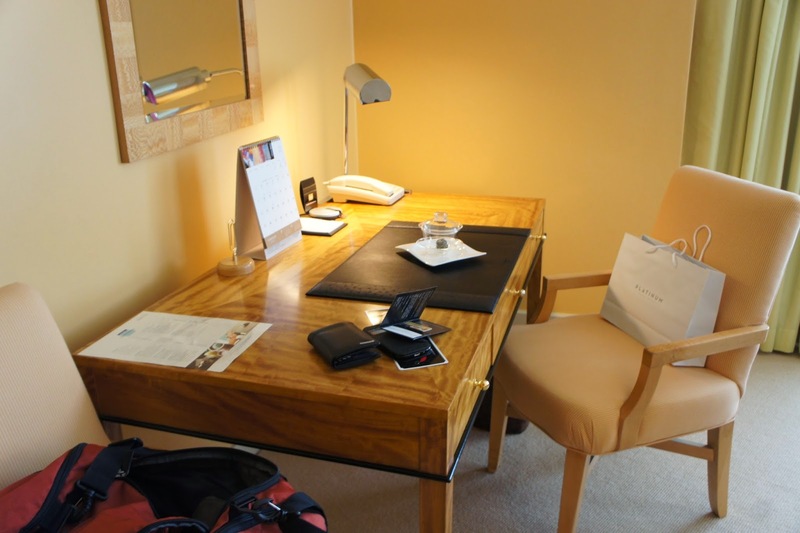 Once one enters the suite, a couch and a study table welcomes one into the suite. This area is small and there is a TV in this area. Here is where one would find the minibar. We mainly used this area to stow our luggage. There is a translucent glass panel dividing the lounge area and the bedroom. The centrepiece of the bedroom is the king-sized bed. The bed was comfortable for one to rest the night. However I do find the pillows too soft (it is a personal preference). In front of the bed is another huge TV. 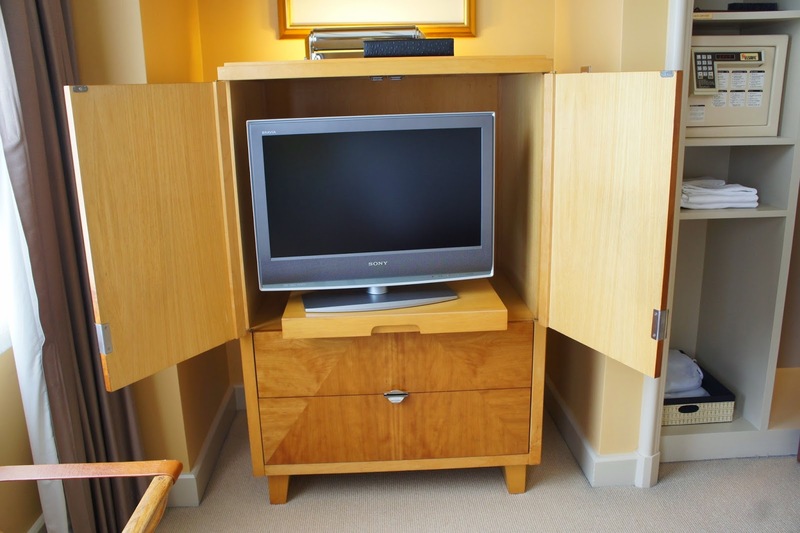 Beside the TV is a smallish wardrobe, which has little space for storage and is definitely too small for 2 person. Further into the suite is the bathroom. 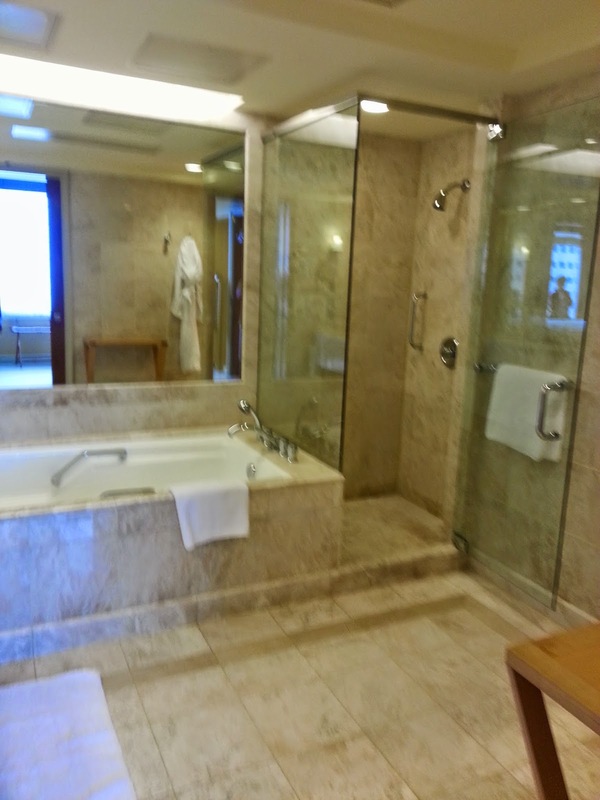 The bathroom is huge and has a small TV in front of the jacuzzi tub, which is rage enough for 2 persons. 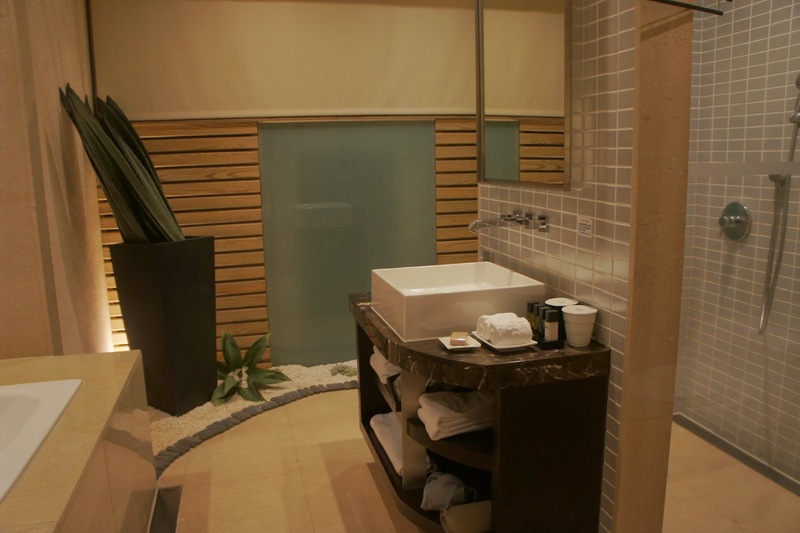 The jacuzzi tub has a unique feature, where the water will fall from the ceiling. 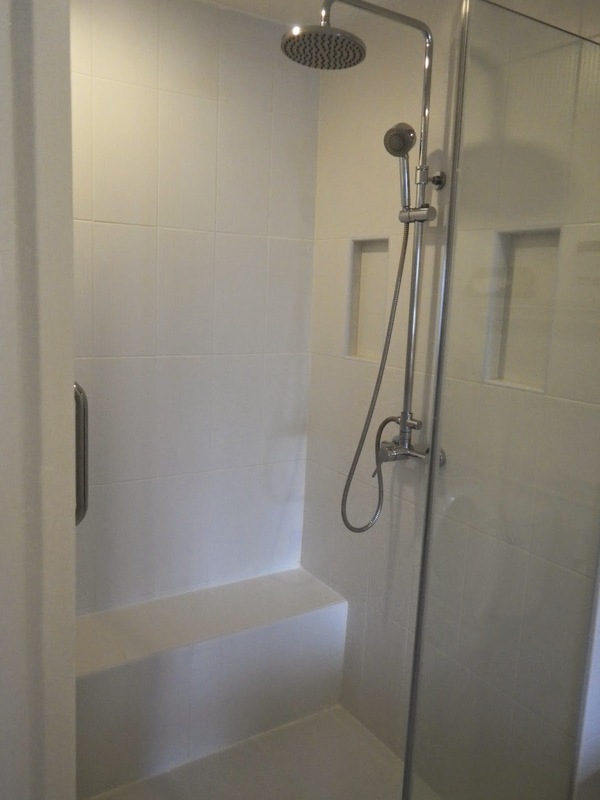 In front of the tub is a sink and behind the sink is the walk in shower area and the toilet bowl. I am impressed with the tub (that is one of the reason why we opted for this hotel over others). 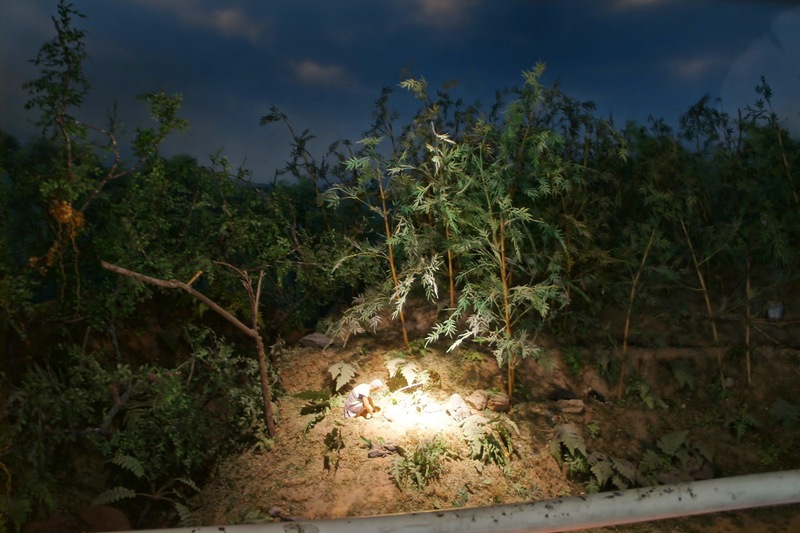 However there are a few areas that demonstrated the hotel was poorly maintained. Firstly the wardrobe door in the first room as maintained earlier on. Secondly, the nozzles for the bubbles in the jacuzzi were all gone except for one. Thirdly, metal piece on the taps were all loose. The suites are already in such bad shape, i can’t imagine how the other type of rooms would fair. We stayed in one of the top range Eagle Suite. 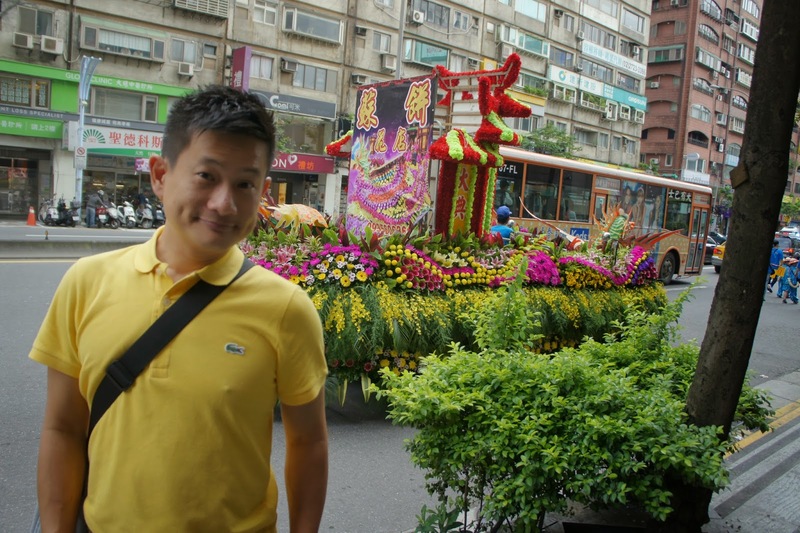 I was initially very excited to stay here and looked forward to a wonderful stay on my first trip to Taipei. I was shortly disappointed by the hotel’s response when my friend tried to arrange a complimentary cake for my birthday. 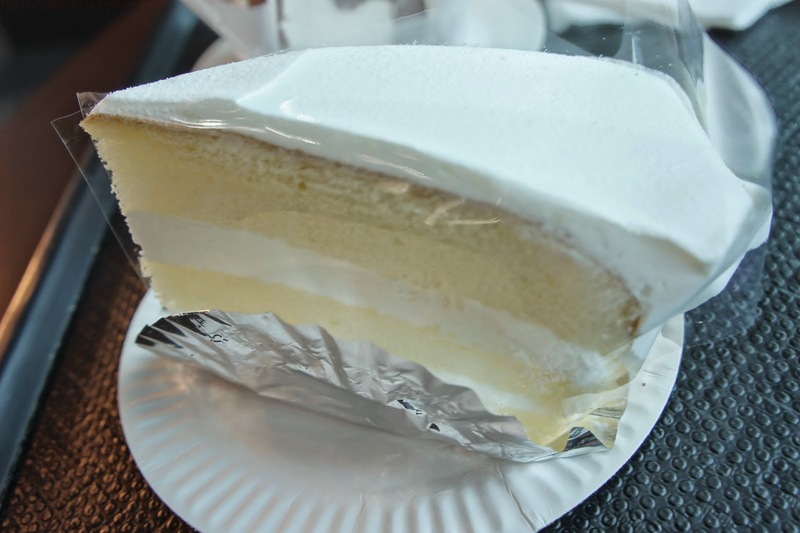 The hotel mentioned that they do not give out complimentary cake, and leave it as that. Given a 4-star rating, the hotel did not bother to do much to impress my friend. 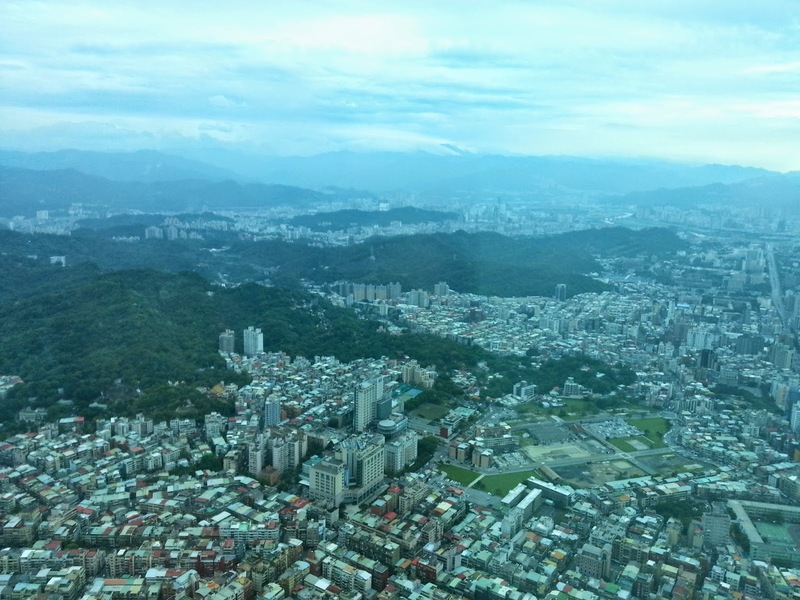 As we arrived early in Taipei, we were given the option to leave our luggage at the concierge or pay for early check in. This is the first time i was made to pay for early check in, granted this is a 4-star hotel, however I have stayed in hotels ranging from 3-star to 6-star rating, they did not have such a policy. Nonetheless we paid for the early check in and caught up some rest. Prior to resting, as we were unpacking, we found one of the doors to the wardrobe came lose. When we were about to head out to the city, the whole of the defective door seem to be coming off. We highlighted to the staff at the front desk, whom assured us that they will have it sorted out by the time of our return. We also requested for make up room while we went out to explore the city. By our return at night around 10pm, we were horrid to discover our room was not made up despite leaving the make up room light on and informing the front desk staff about making up our room. When we returned to our unmade up room, we also discover the defective door to the wardrobe is missing. No one has left any messages nor inform us of what they have done to our room. We called up the front desk and was told that the parts to the defective door is not available and had to be ordered. We were given the option of either staying put, while the hotel get someone to remove the bulb in the wardrobe or to change to another room. Without hesitating, we opted to change room. These series of incidents has further increase the already existing bad impression of this hotel. 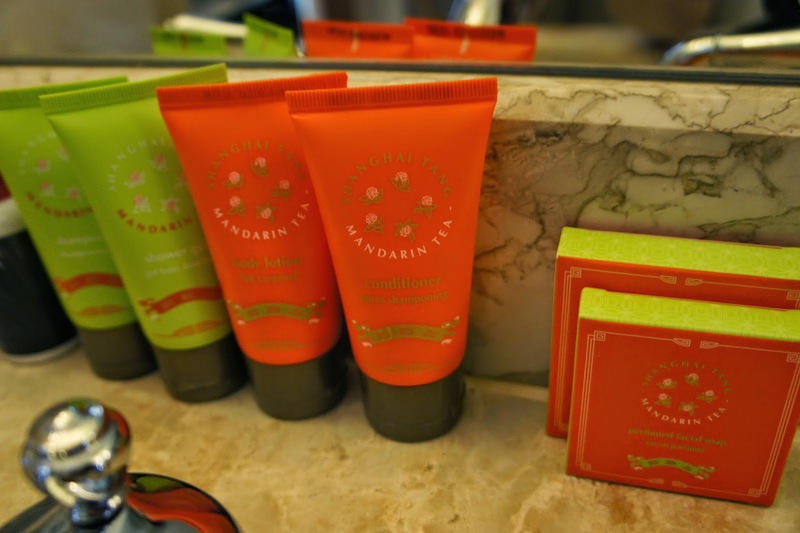 The most ridiculous part is the stinginess of the hotel in giving out bathing amenities. I had requested for 4 sets of bathing amenities on the first night, fearing that we might run out of it soon. 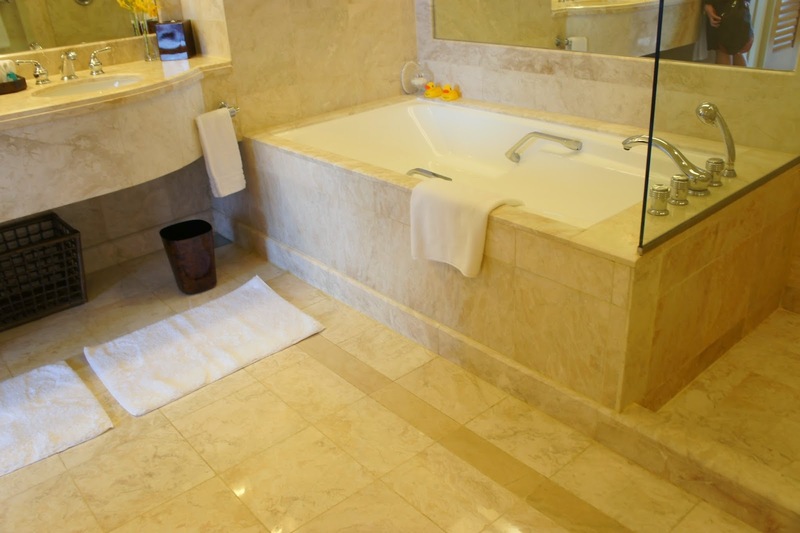 We used the bath foams for the huge jacuzzi tub and the 2nd day when we returned from our day trip, we found that the bathing amenities was not topped up. I called the reception to request for more amenities, to my horror I was informed that the hotel has given us 4 sets and that’s all they will give. 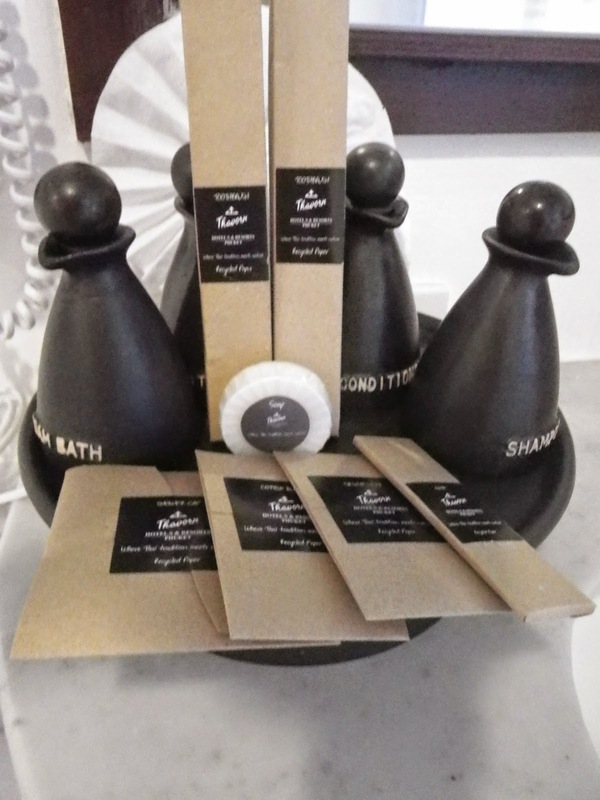 I questioned if the hotel expect their guests to run to the nearby 7-11 to get our own amenities and upon questioning, the reception agreed to replenish a set each day. To think the worst is over, on the 4th day the housekeeping staff did not replenish our bathing amenities again. I called up the reception, again the same excuse is given. I told the staff to check with her colleague about the agreement that I had 2 days ago. After waiting for 5 mins, the reception got her housekeeping counterpart to deliver a set of bathing amenities. On the night before checking out, I was shocked to discover that the hotel did not book my airport transfer. When in my prior communication with them via email, I had booked for return airport transfer on their Mercedes sedan. It was already 3 am when I argued with the staff over the phone regarding airport transfer and we have yet to pack our luggage. When I demanded to speak to their duty manager or supervisor the next day, the staff was still trying to pacify me in accepting his offer of hailing a cab to the airport. Despite my persistence in wanting to leave the issue till the next day when the manager or supervisor is in, the inconsiderate staff still persist on getting me to take a cab instead. 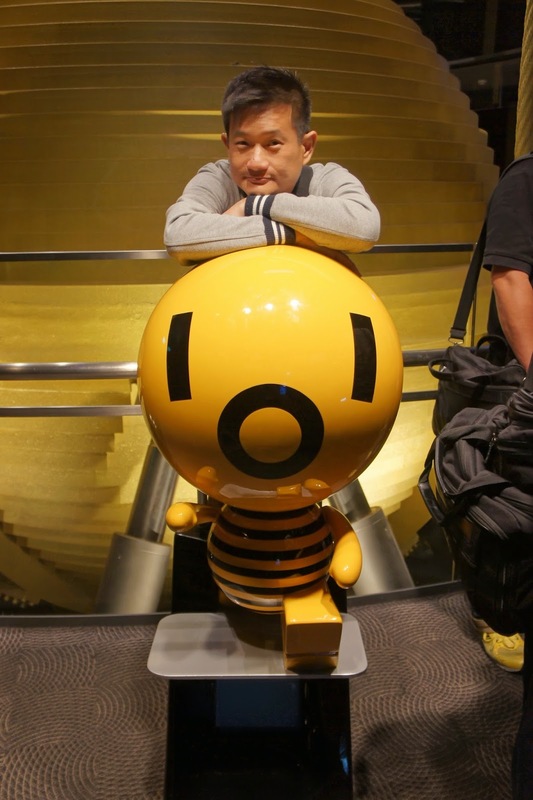 I had mentioned to the staff several times that it is already late and I would want to pack my luggage and turn in soon. However these requests (along with my other requests) were turned to deaf ears. I had to scold the staff to get him off my back. The next day the supervisor called and apologise for all the service hiccups. She assured me that they already has a Mercedes waiting for me. When we were about to leave the room (after packing up all our stuffs, there was a bottle of red wine and a box with all the bathing amenities inside. This was meant to be a gesture of apology from the management of hotel. To think they even dare to pull such a stunt was laughable. We left whatever they have left outside our door in the room and checked out. We did not want to go through the trouble of squeezing the bottle of wine into our already full luggage. The service is NOT up to standard and do not even deserve a 1 star. The apology gesture is insincere and laughable. If one to be looking for a great time here, FORGET IT!! This hotel has the cheek to make us pay for early check-in and yet provided service that is not worth the money. I certainly did not expect a hotel who is stingy of bath amenities. The service is below par and the quality of the hotel is ageing. 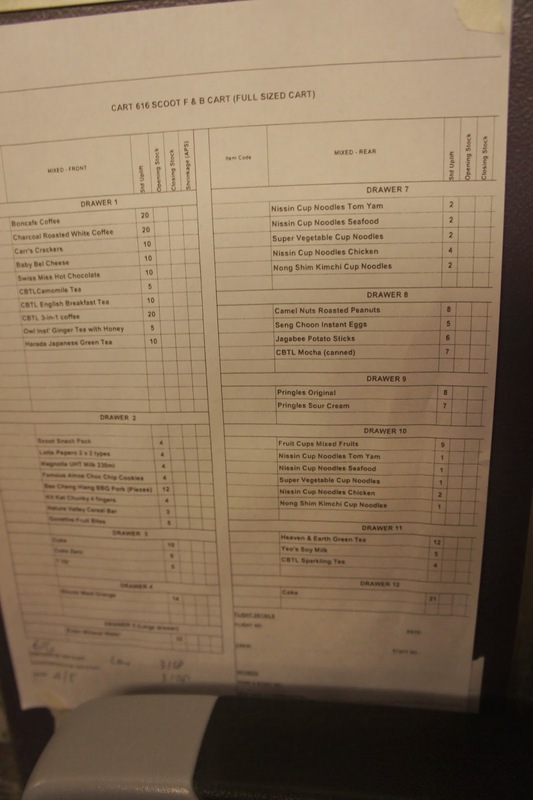 The food selection for breakfast is boring (we only had 2 breakfast out of our 5 days stay). The service level is sub-standard, the rooms are ageing. Do not bother staying here, go elsewhere. I WILL NOT RETURN TO THIS HOTEL FOR MY FUTURE TRIPS TO TAIPEI. 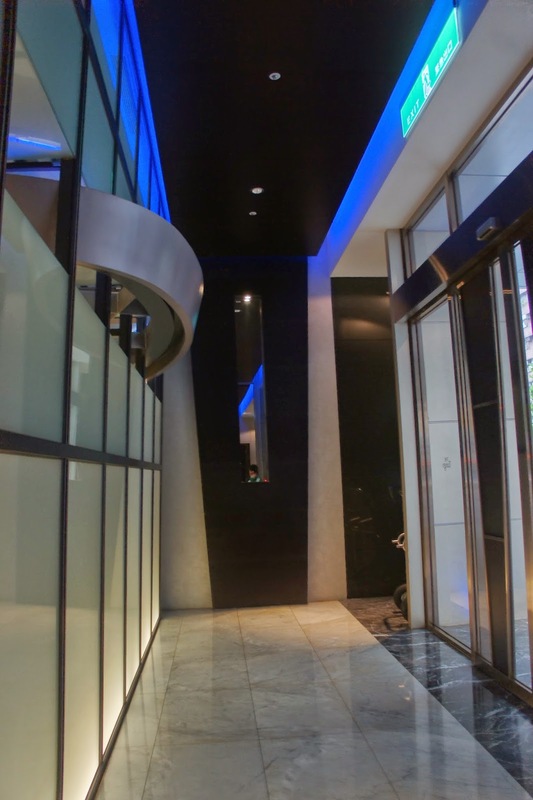 They do not even accord guests staying in one of their most expensive suites the status befitting of it. Leaving any place is always the tough part, especially when one enjoys the place and feels more can be done there. This is the feeling we got today. There are simply 2 things on our list today, get to the airport and make sure we board the plane on time (though there is always the hope that we will miss our flight and get to spend another day here). We woke up later than what we planned today, partly due to the fact that my friend and I stayed up till 5am the night before to pack our luggage, and perhaps partly due to we simply don’t feel like going home, going back to reality. Realising that we are already late, we hurried to prepare ourselves, did a few scans in the hotel room to make sure we did not leave anythings behind, and proceeded to the lobby for checkout. By this time, our airport transfer is already waiting for us. The ride to the airport is uneventful. Once at the airport we quickly proceeded to check in (we were the last passengers to check in), and made our way through the immigration. We boarded our flight back to Singapore. 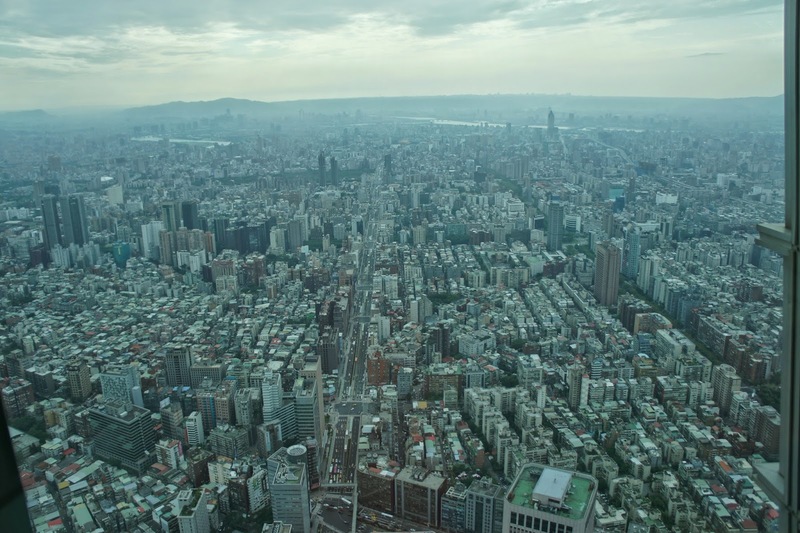 Throughout our stay in Taipei, I feel we are a little too ambitious. 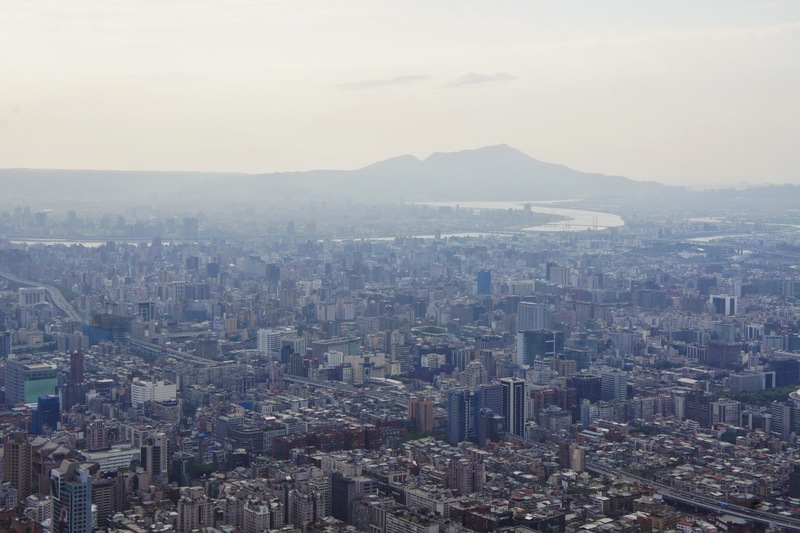 Given 4 days (well today can’t really be counted), we did 2 day trips resulting in sights in Taipei were missed. With this little amount of time, 1 day trip is just nice. 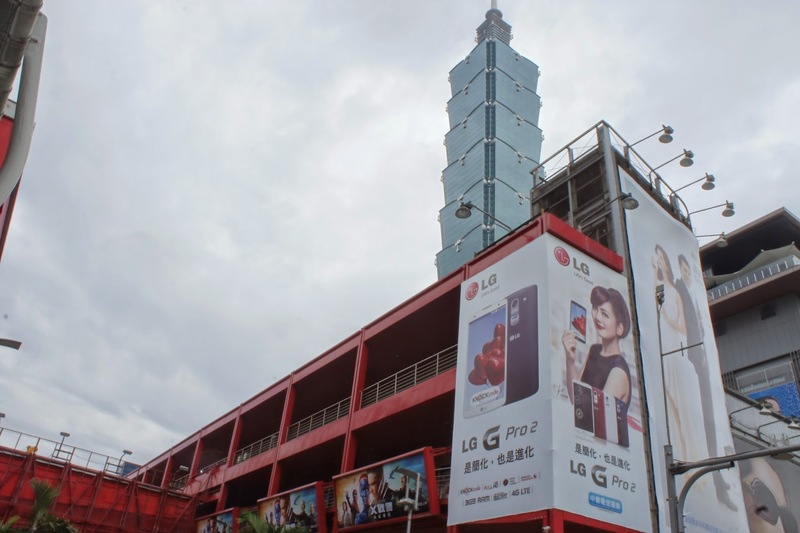 We also did not cater sufficient time for Taipei 101, underestimating the amount of visitors the once titled tallest building in the world would receive on a daily basis. 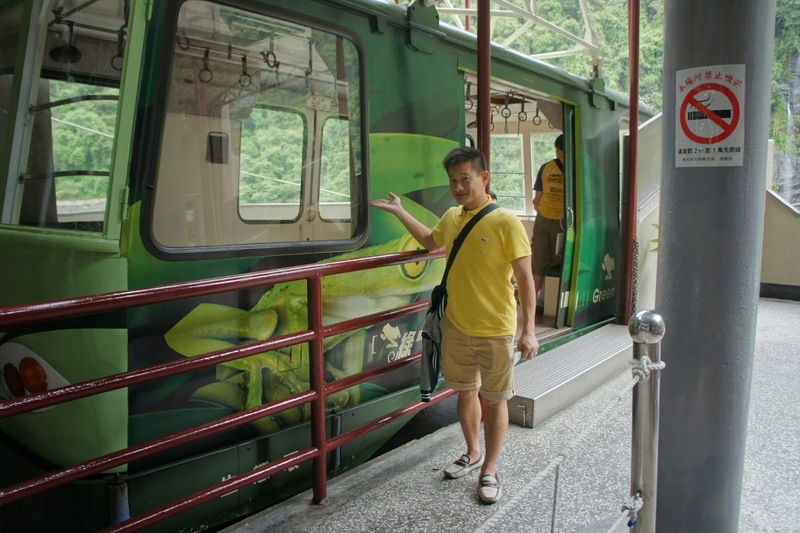 The subway in Taipei is a convenient and inexpensive way to get around Taipei. 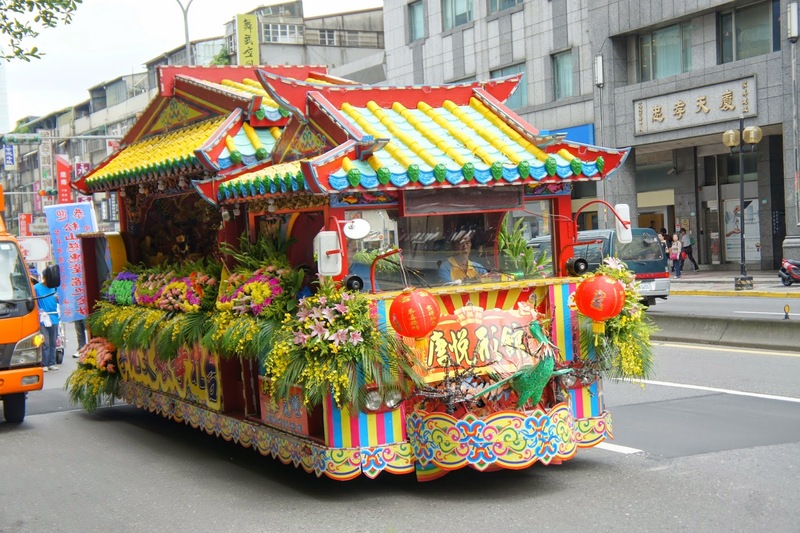 It is fast and comfortable, and also allows us to rub shoulders with the locals. 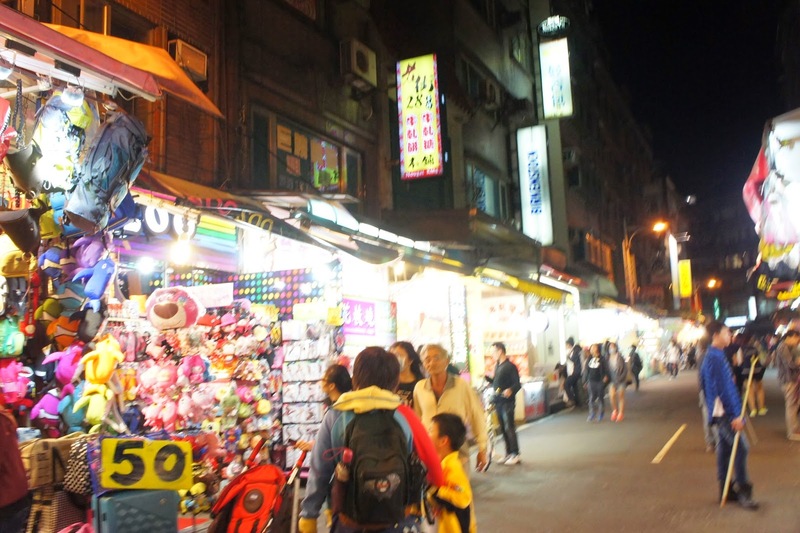 If anyone has only time for one night market, Shilin Night Market is the one to be at. 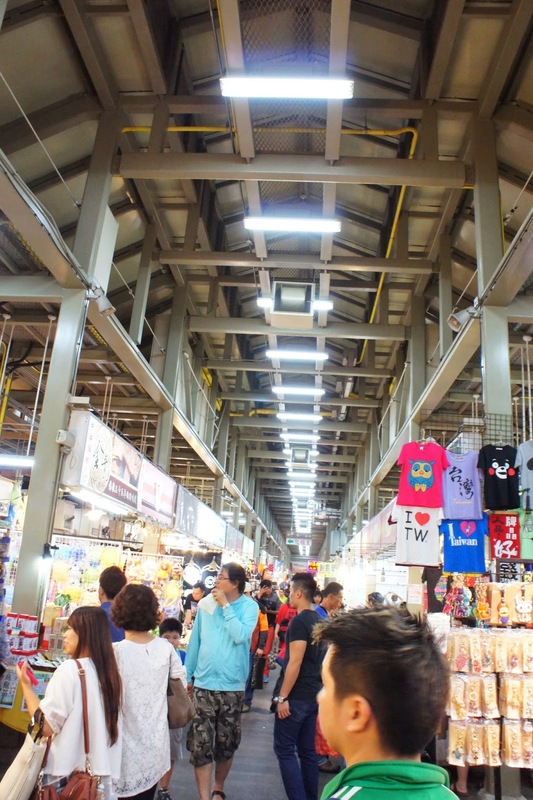 With its shear size and the amount of merchandise and food on offer, it is really a one-stop night market for all. 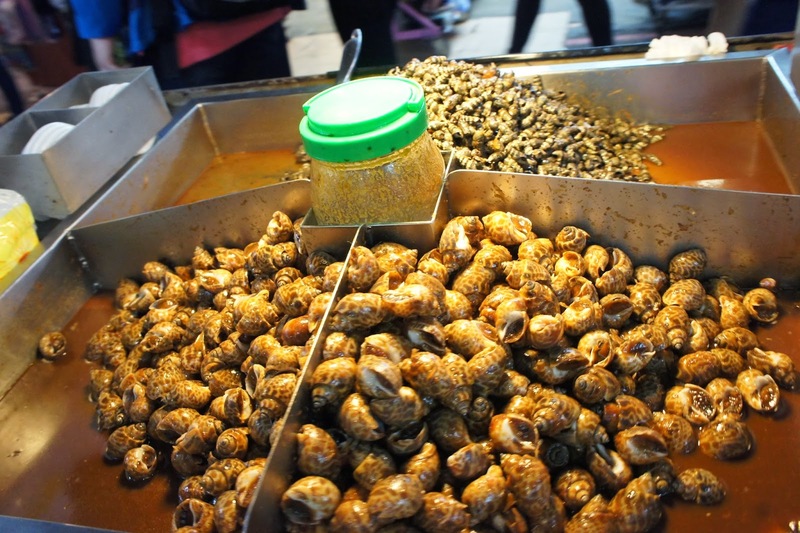 Night market is part of the Taiwanese lifestyle and should not be missed. 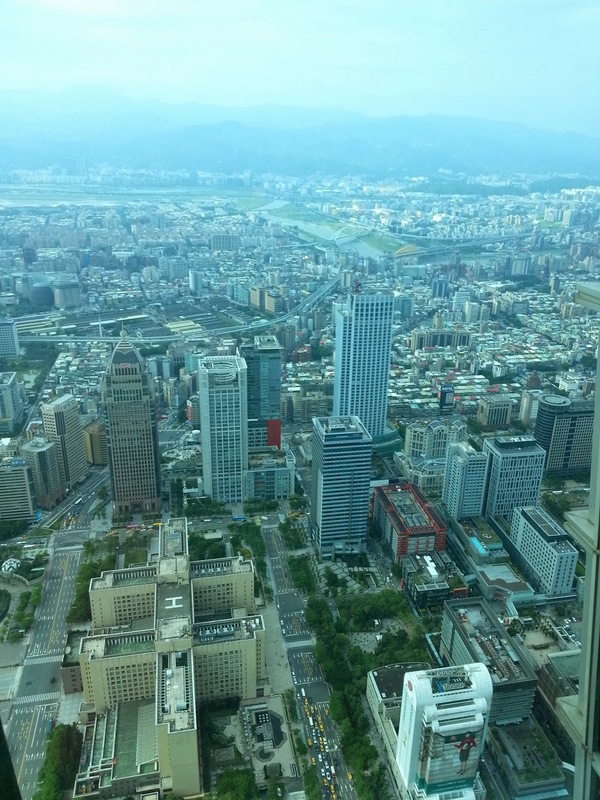 I will definitely return to Taipei again, as I had so much fun in Taipei. The locals are hospitable, the food is fantastic. 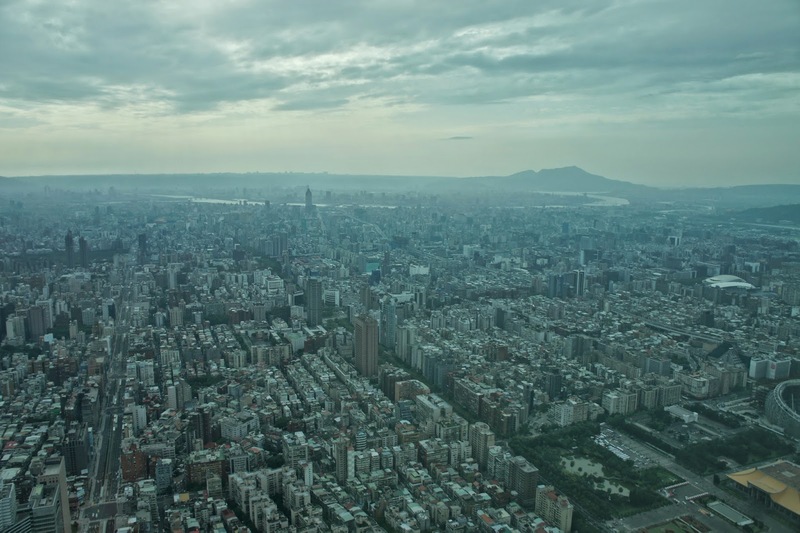 The next time I return, I will cater more time for Taipei, as for now it is just a matter of when I will come back. We started our day early today. 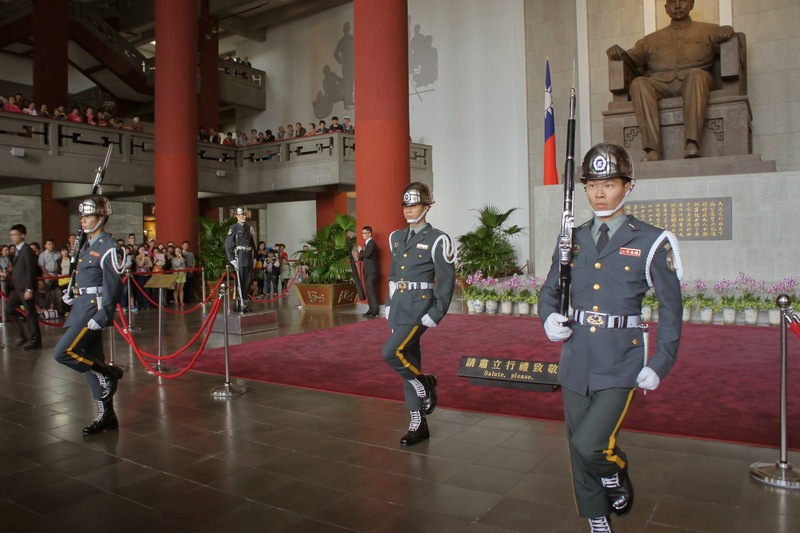 We wanted to visit a number of sights around in Taipei, one of which is the iconic Taipei 101 building along with a couple of monuments where there are change of guards. 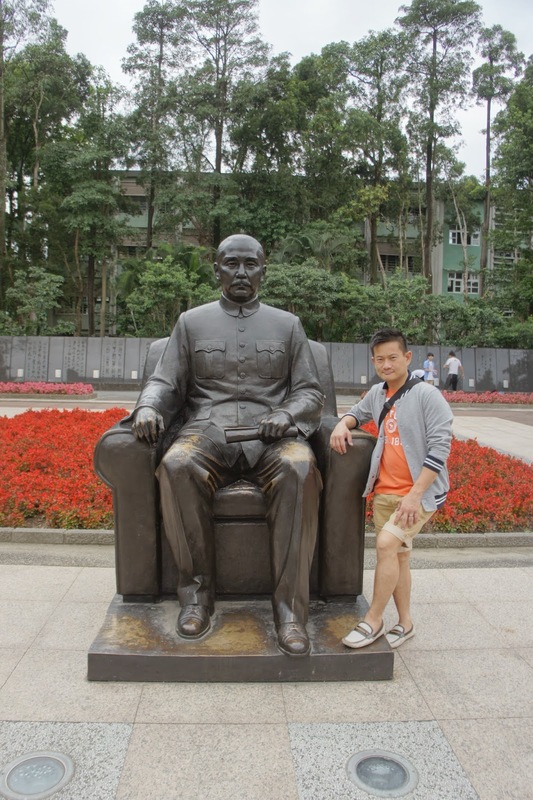 We took the subway to Sun Yat-Sen Memorial Hall, which is just a couple of stations from the hotel where we were staying. 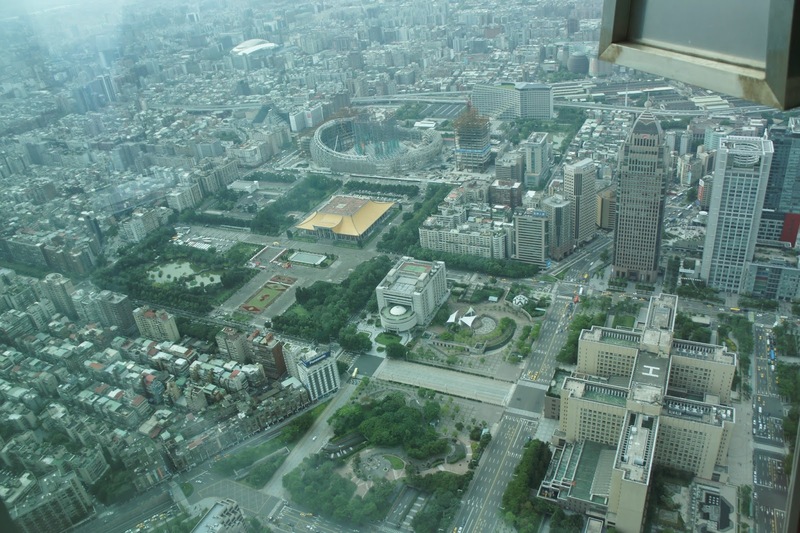 Exiting the subway station, navigating to the memorial hall is a breeze. There are no lack of signage around point to the monument. 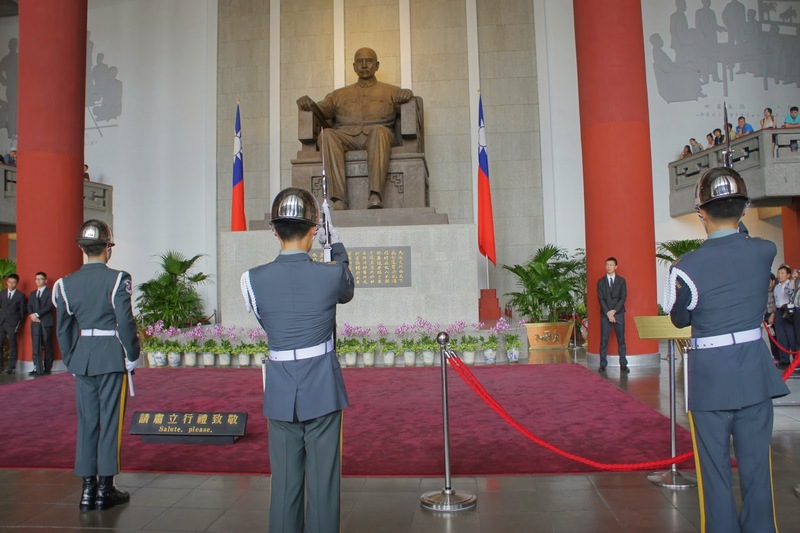 Dr Sun Yat-Sen, also regarded as the national father in the eyes of the Taiwanese, fought for the independence for Taiwan in its early days. 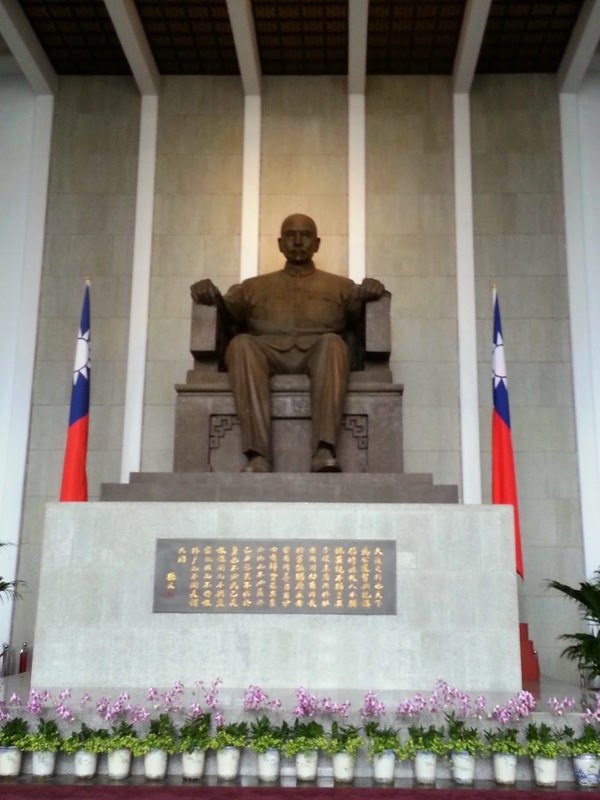 His contributions to Taiwan is so great that the local government carved out a huge plot of land in central Taipei and dedicated a monument to him. 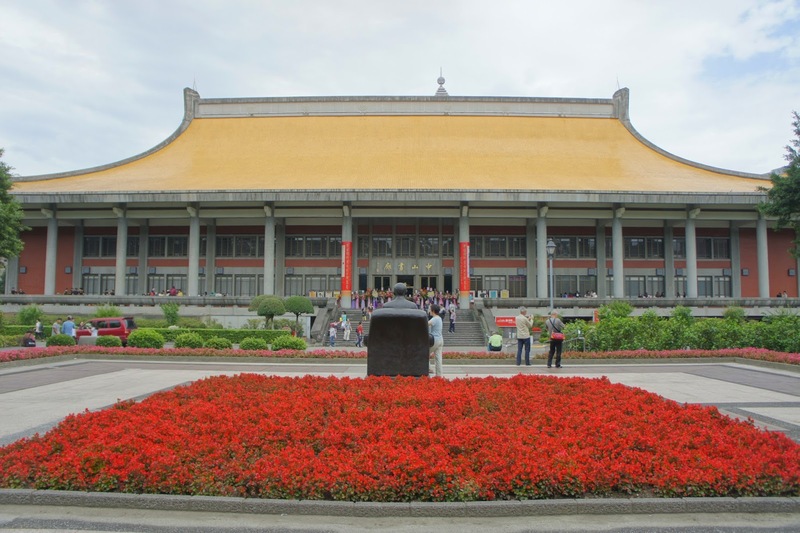 Most of Sun Yat-Sen Memorial Hall (國立國父紀念館) is dedicated to garden space, however the building is also rather huge. 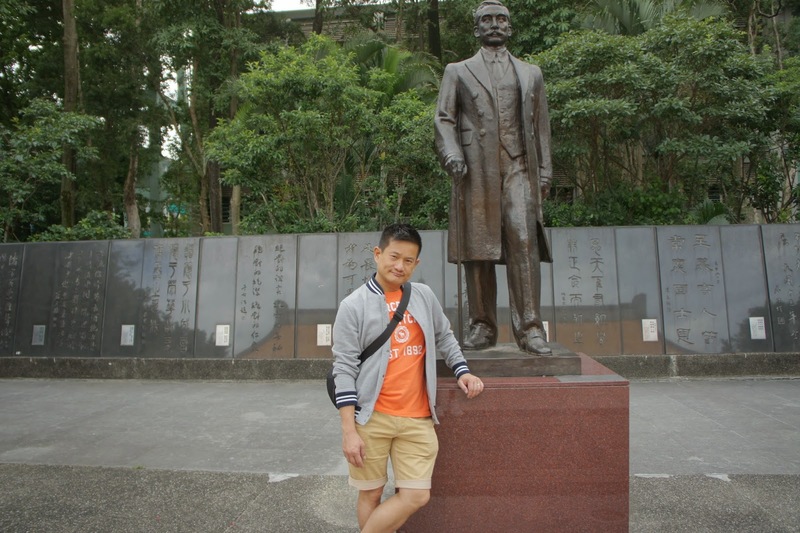 Prior to entering the building, my friend and I took some pictures in a quieter corner of the gardens where one of the several statues of Dr Sun is located. 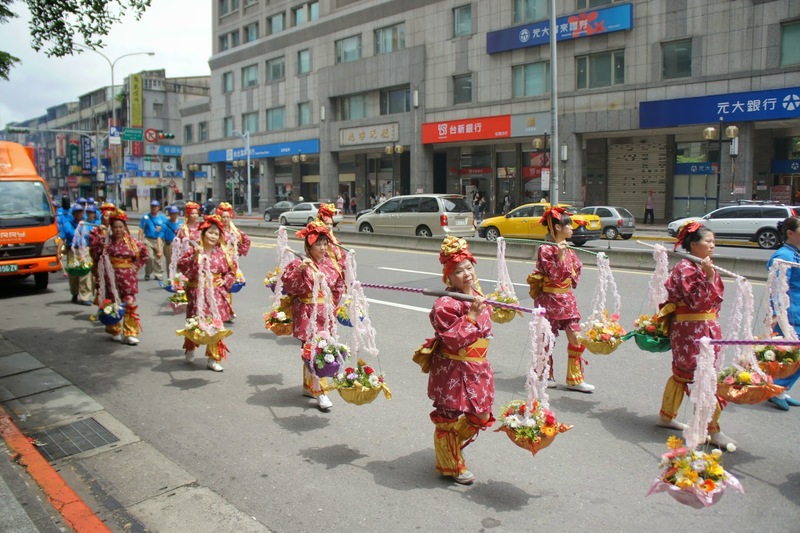 While taking pictures, I saw some youths practicing their dance movements in one corner. 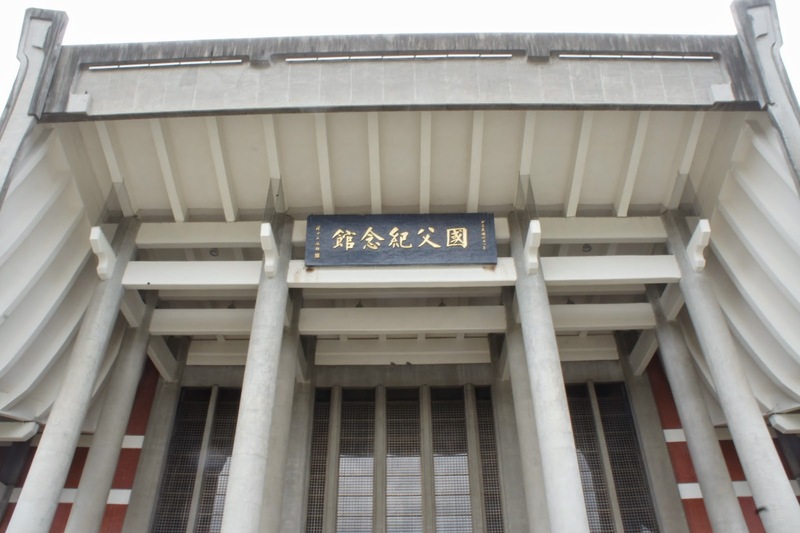 It seem that Sun Yat-Sen Memorial Hall is not just for the visitors to get to know the history of Taiwan, it is not just for the locals to pass down to their next generations on the contributions of Dr Sun for Taiwan, it is also for the locals to hang around, interact with their friends and do something them feel passionate for. 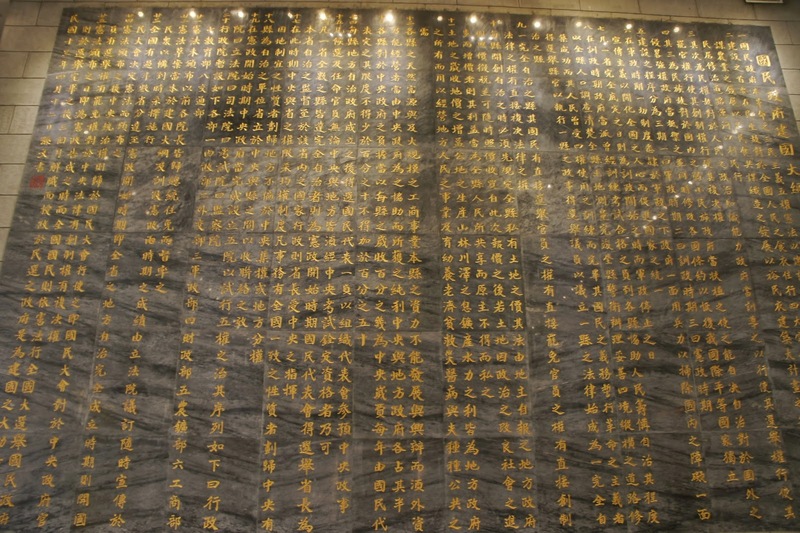 Sun Yat-Sen Memorial Hall is located right in the centre of the gardens. 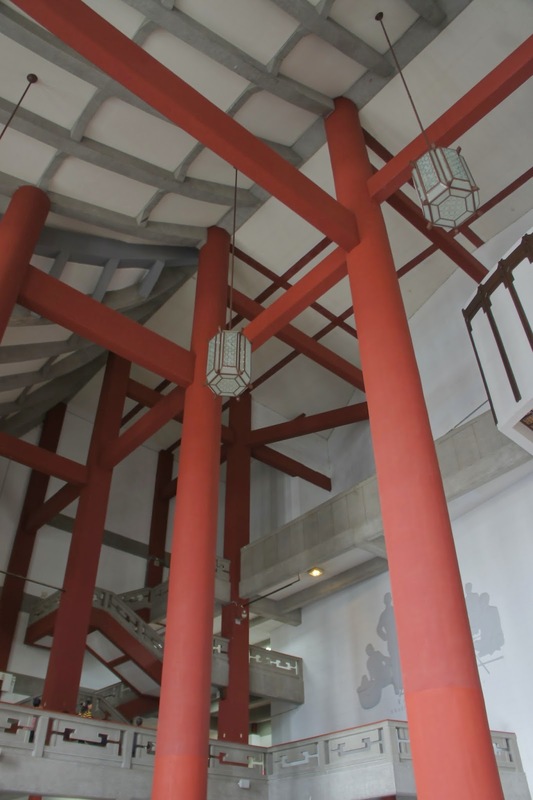 The building has a very traditional Chinese architecture. 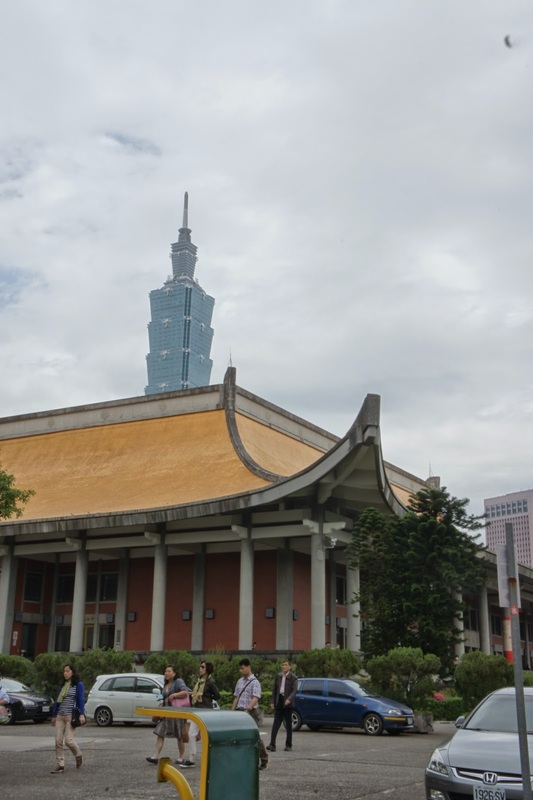 The grey building with yellow roof sits solemnly on the memorial grounds welcoming visitors daily. As we enter the building, it seemed that we were being transported back to the 60s when the building was first built. Despite the age, the building, both inside and outside is still very well maintained. There isn’t any signs of ageing. The building seem to serve more then remembering what Dr Sun did for Taiwan, there seem to be an office and some conference rooms. 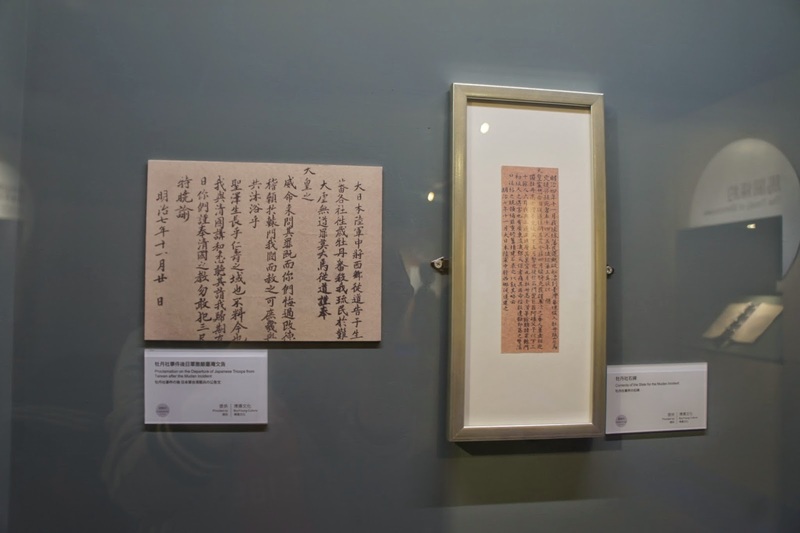 My friend and I headed to a couple of the exhibition halls, which exhibits the teachings, scrolls and texts from Dr Sun. 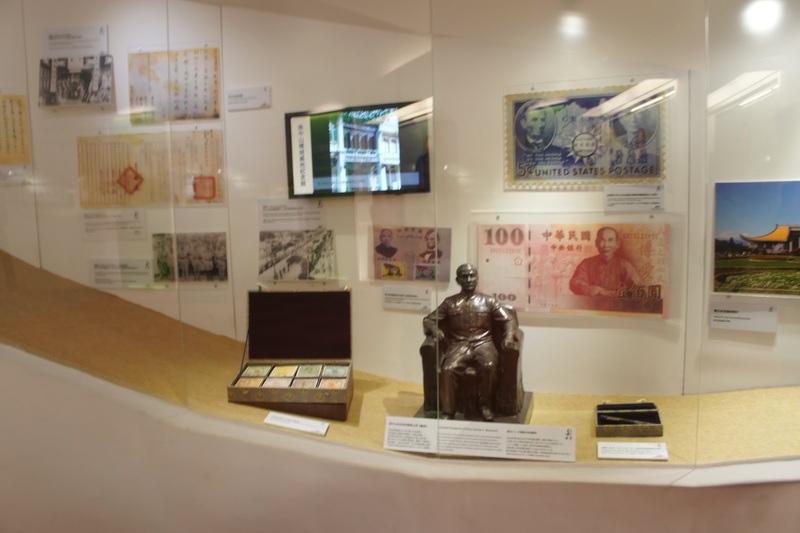 There is also some Taiwanese currencies on display with the picture of Dr Sun on it. 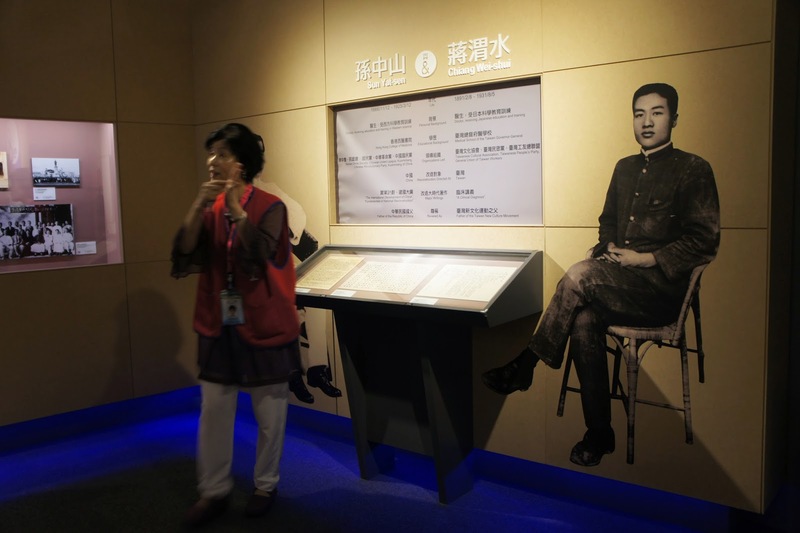 The next hall exhibits the road to independence and the efforts of Dr Sun and his comrades in their fight against the Japanese during World War II invasion. 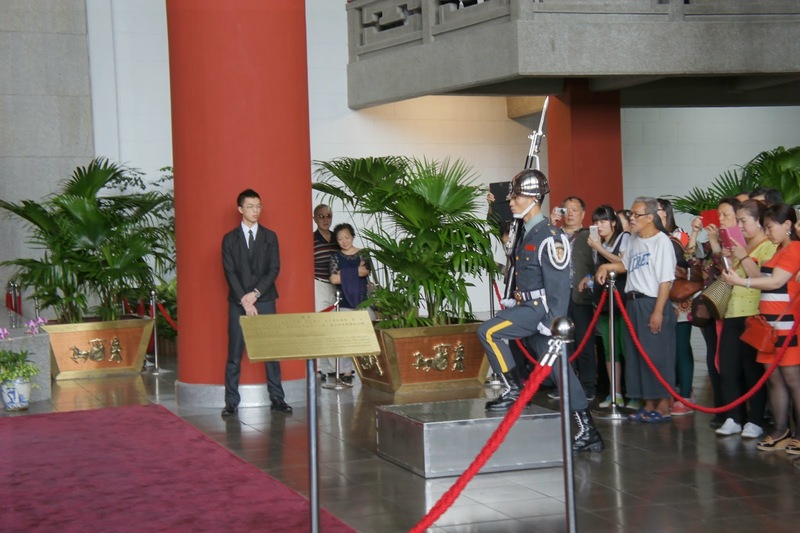 As it is about time for the change of guard, which happens every hour, my friend and I headed to the main hall. 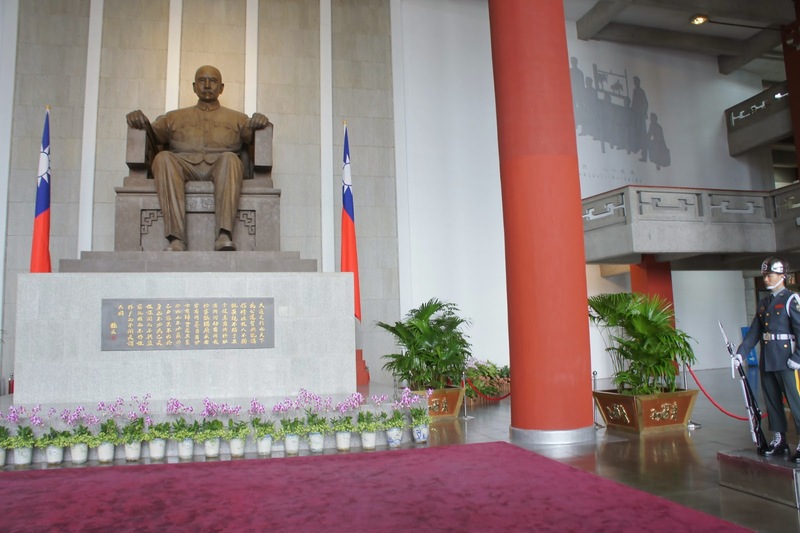 In the main hall, a gigantic statue of Dr Sun is the centrepiece of this hall, very similar to the statue of Lincoln in Washington. 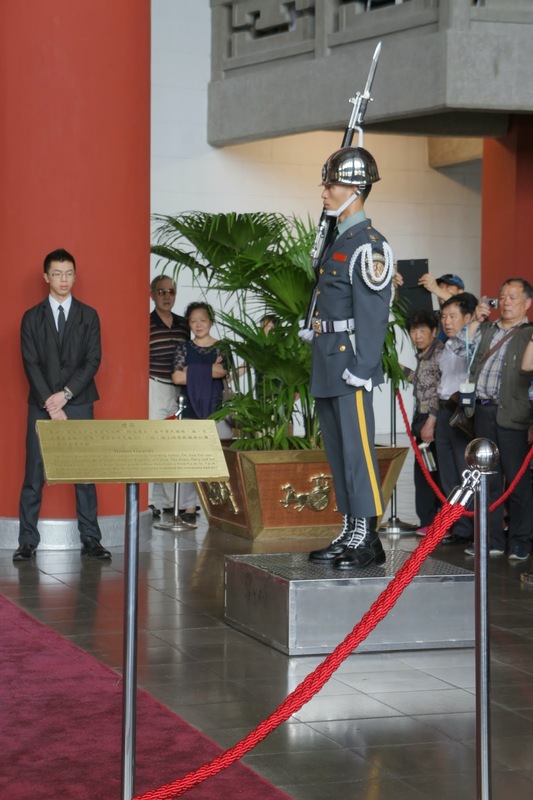 There is an area being marked out by velvet strings to prevent visitors from getting into the way of the guards, who will be matching in from the sides for the change of guards ceremony. 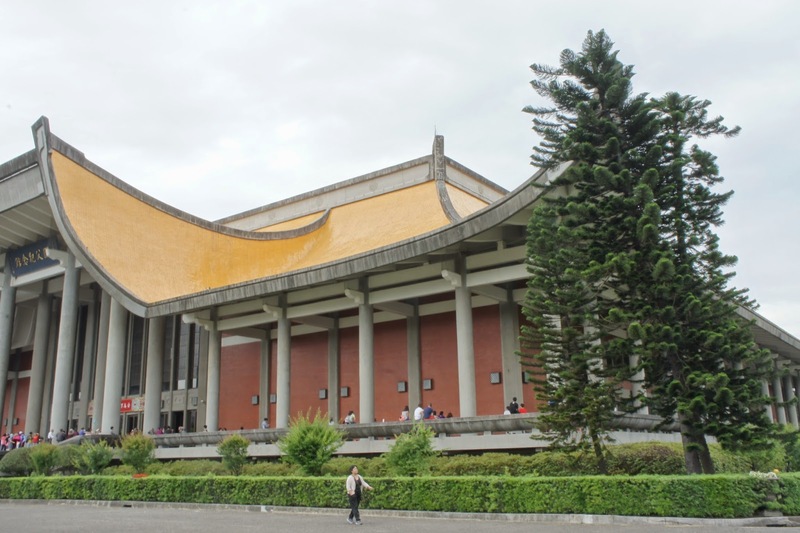 It is a good idea to arrive at this hall around 10 mins prior to the hour to secure a good spot for the ceremony. 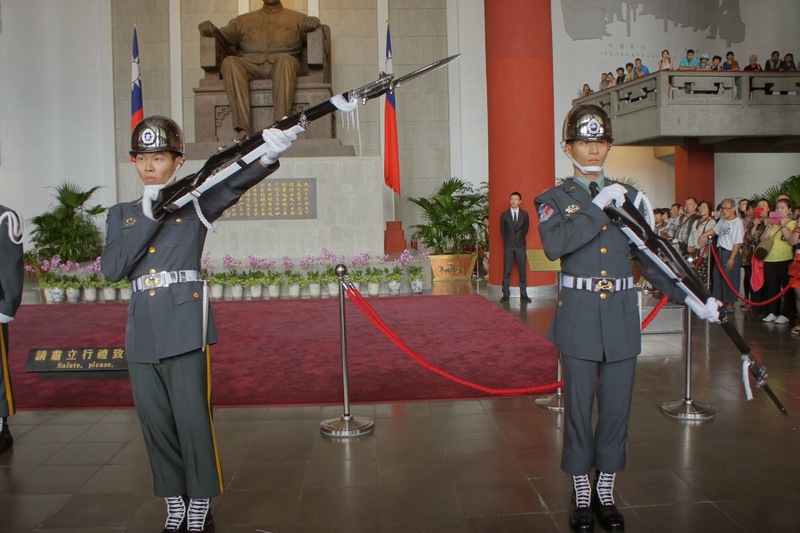 It was soon the hour, we witnessed the guards matching out in synchronised timing like toy soldiers. 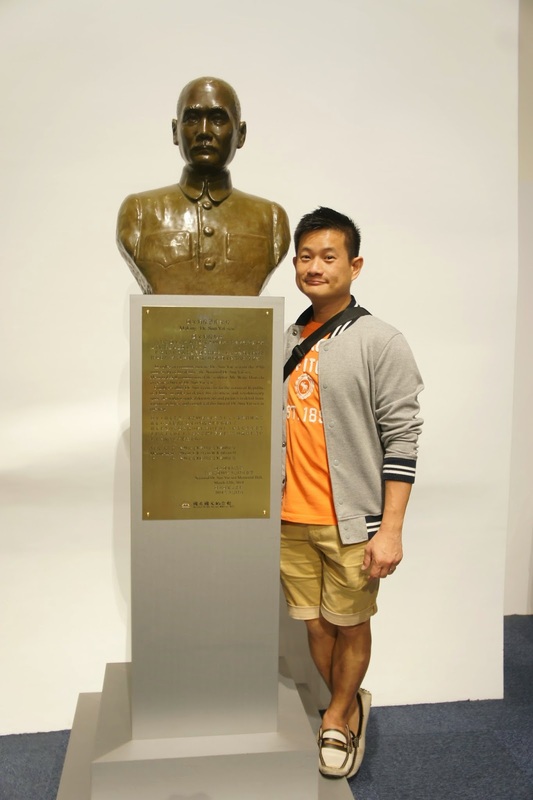 The crisp tidy uniform marks a certain level of discipline and respect for Dr Sun. As they were matching out, cameras clicked off from the horde of visitors gathered around to watch the ceremony. 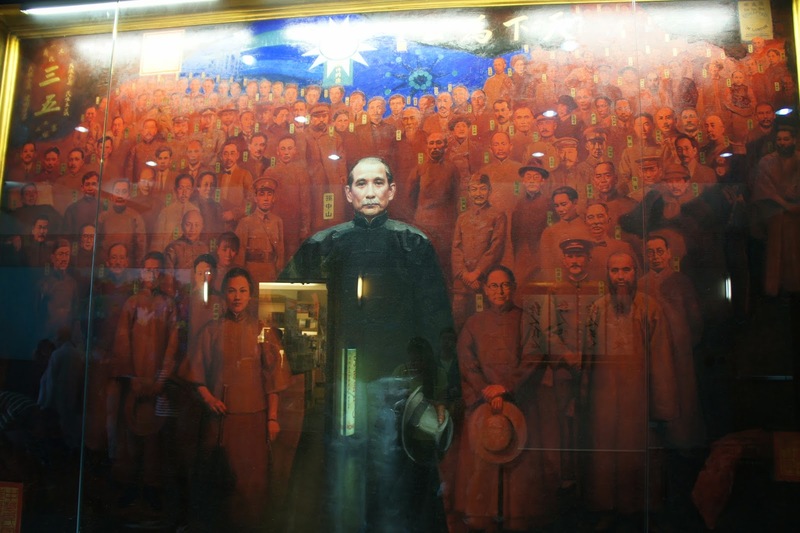 The command from their leader was clear and loud, and made through the clicking on the cameras and the whispers from the visitors. The whole ceremony took around 10 mins. 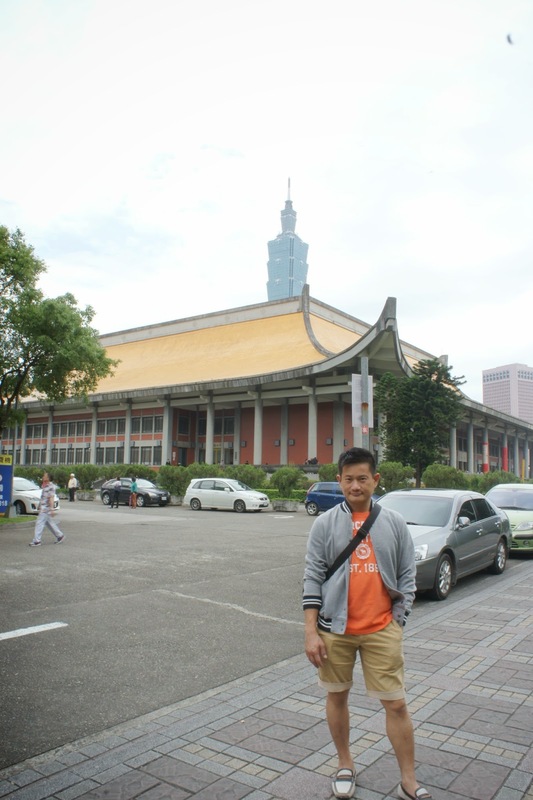 After watching the ceremony, my friend and I left Sun Yat-Sen Memorial Hall and headed to our next destination – Taipei 101. 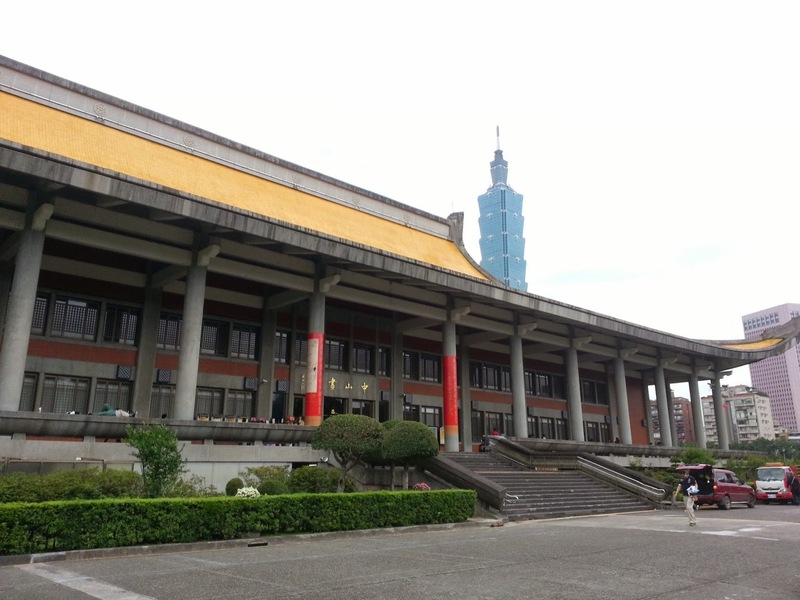 Taipei 101 is within walking distance from Sun Yat-Sen Memorial Hall. 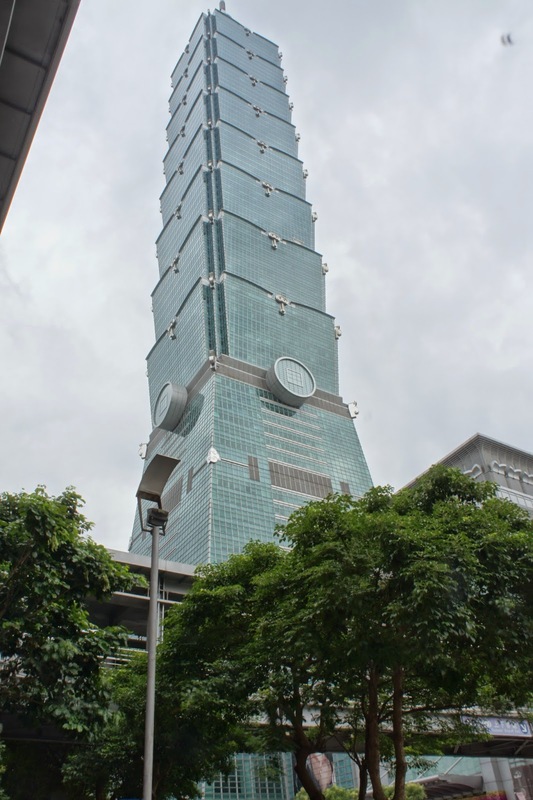 The journey towards Taipei 101 will pass through the City Hall and some governmental office in Taipei. 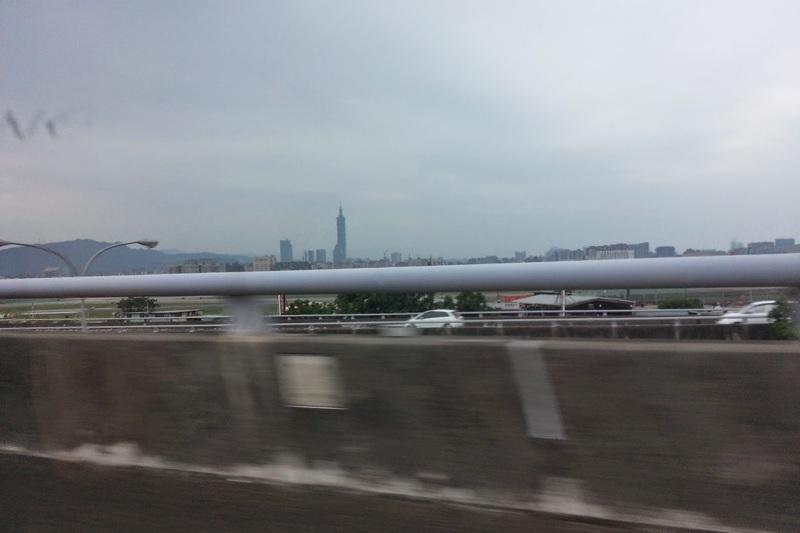 We had to go through a shopping mall – Shin Kong Mitsukoshi (新光三越) to get to Taipei 101. 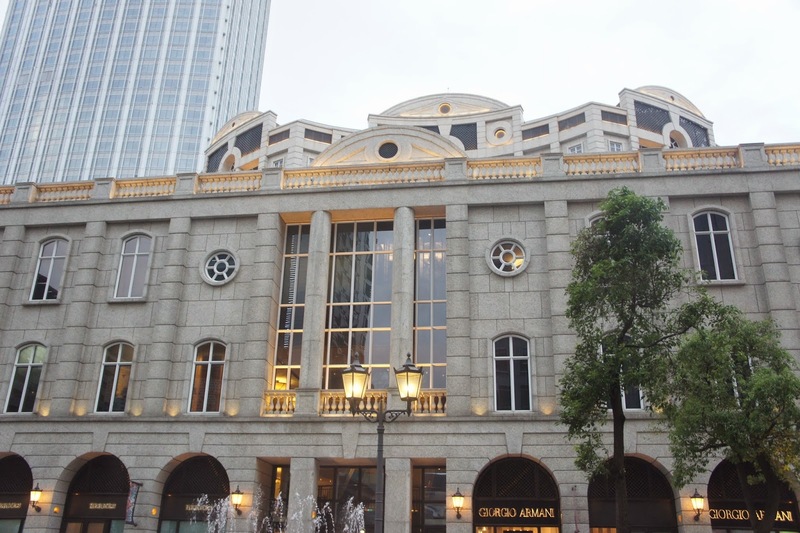 Since we were already at Shin Kong Mitsukoshi my friend and I decided to walk around a little. 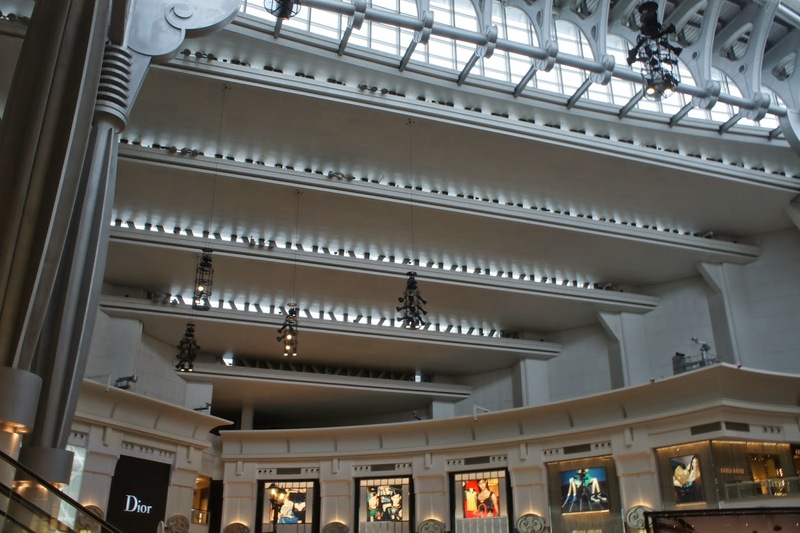 Shin Kong Mitsukoshi essentially is a mega shopping area, consisting of a few blocks of shopping malls, each with 7 storeys. There are practically every for everyone here. 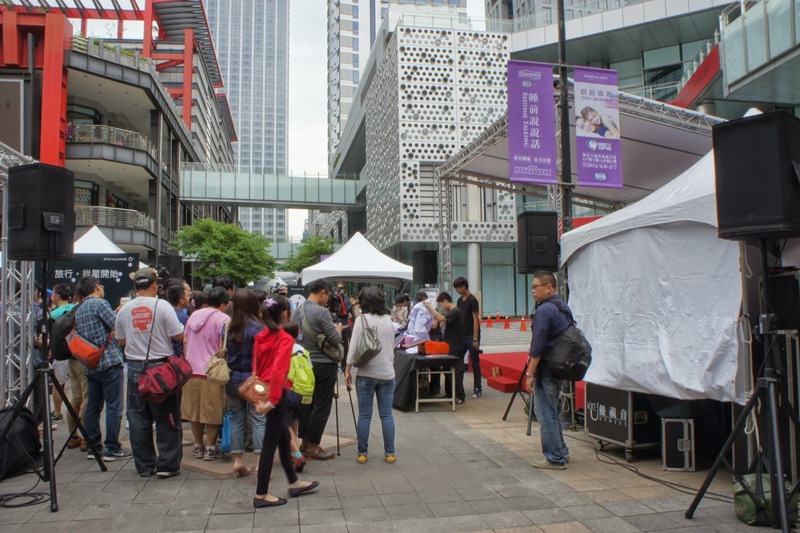 There are also several open spaces, where we saw a few events ongoing at the same time. 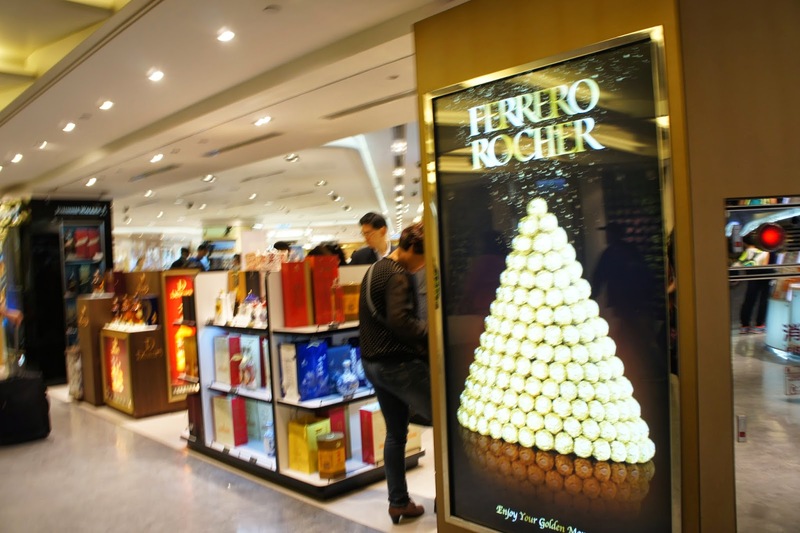 Shoppers would need to cater for at least half a day to shop to their heart’s content here. Well as for my friend and I we were merely passing through. 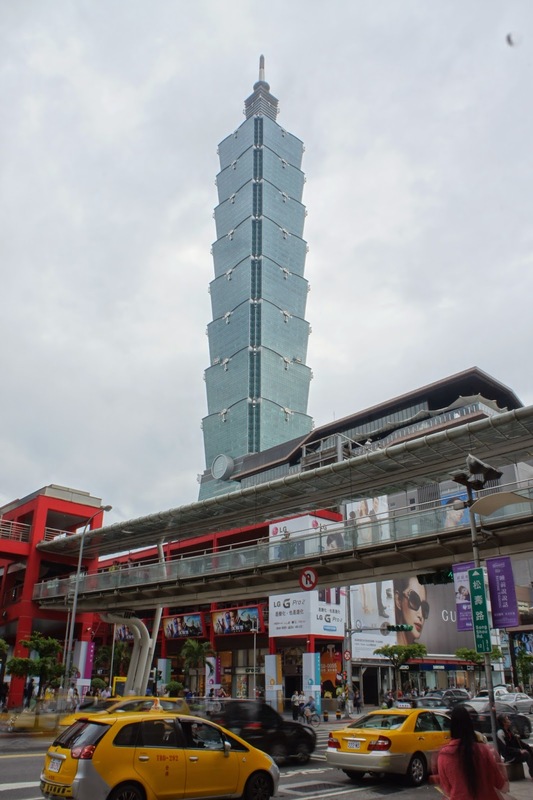 Diagonally opposite Shin Kong Mitsukoshi is Taipei 101 (台北101). 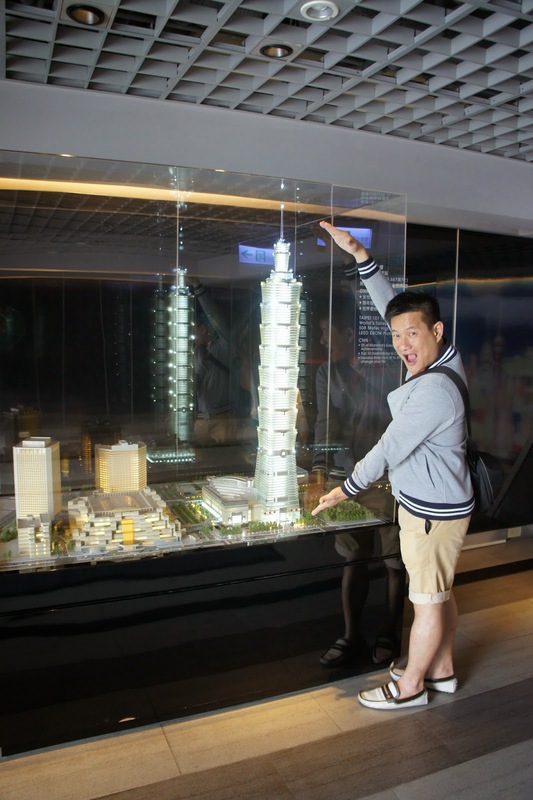 The iconic building is designed based on the bamboo and of course consist of 101 storeys. 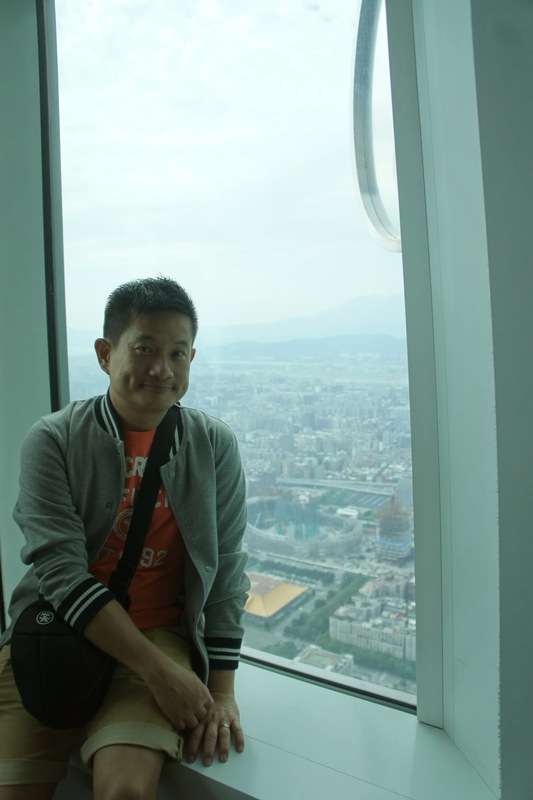 To get to the observatory deck of Taipei 101, one would have to get to the 5th floor, where the ticketing counter is. 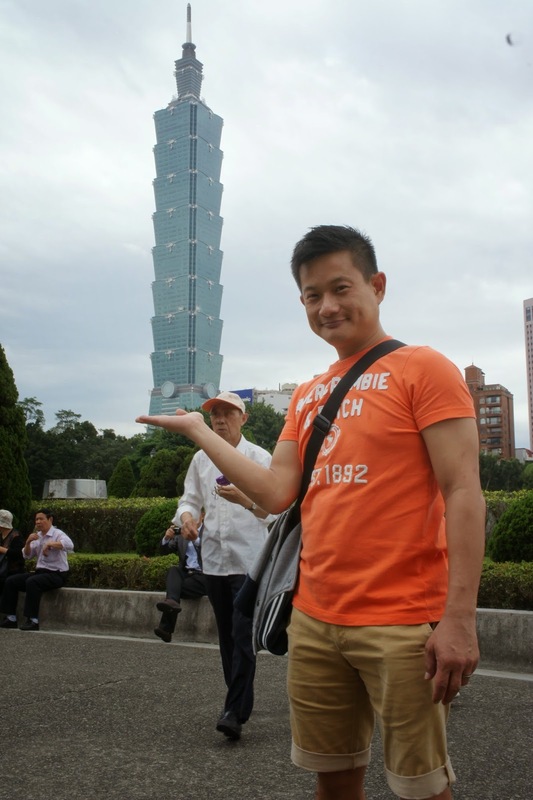 One would have to cater at least half a day for Taipei 101when visiting. Most of the time is spent on queuing. 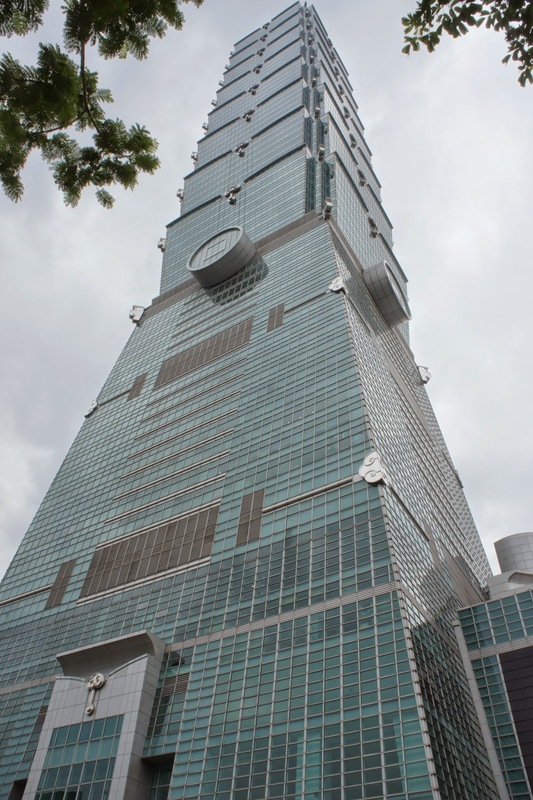 One would have to go through 3 queues during their visit to Taipei 101. One for the ticketing, which fortunately is the shortest one. On the ticket printed the time when we will be allowed to queue for the lift to the observatory deck. This is the part where we wasted the most time waiting for our turn to enter the lift. We spent around 1 hour waiting for our number to be displayed and another 30 mins to get into the lift. The lift towards the observatory deck is very fast. Within seconds we arrived at the observatory deck. 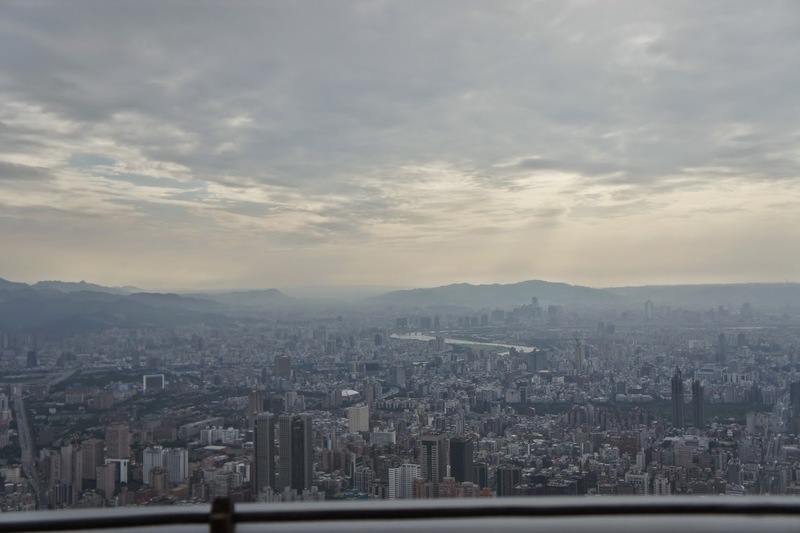 The 360 deg observatory deck allows one to see the whole of Taipei City and beyond. 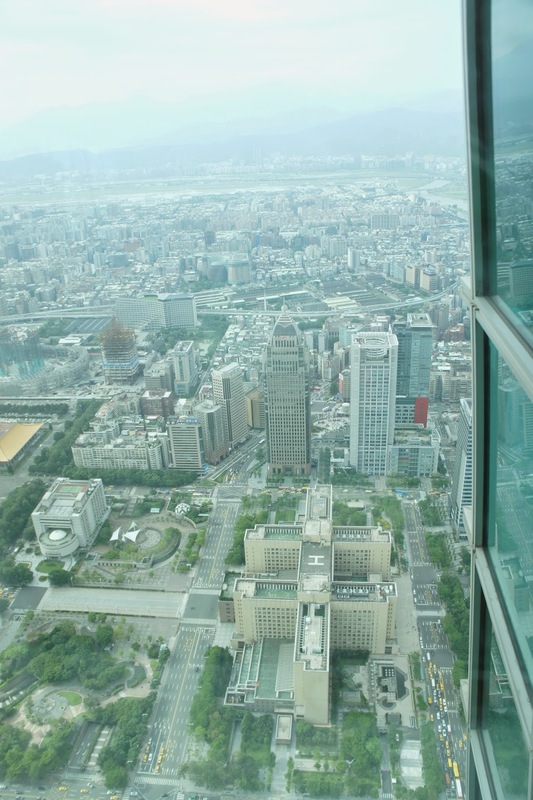 We spent a considerable amount of time looking around the Taipei 101 from this deck. 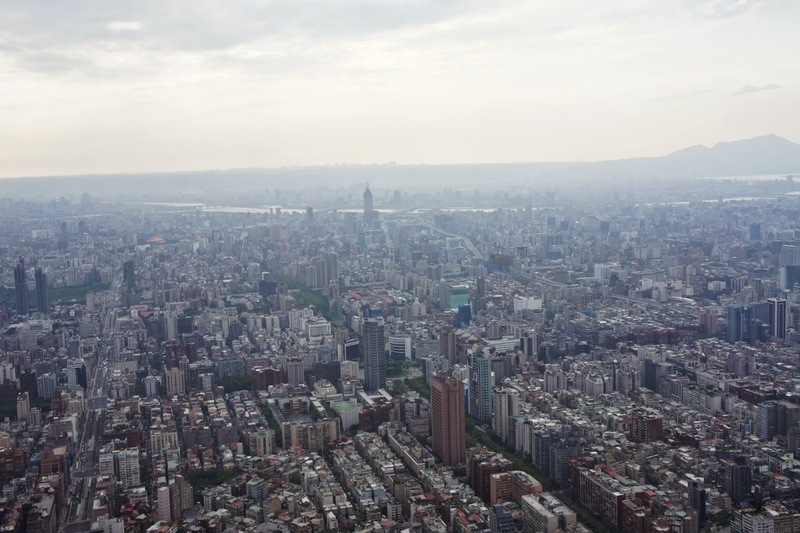 Only here will one feel Taipei is actually a huge city. 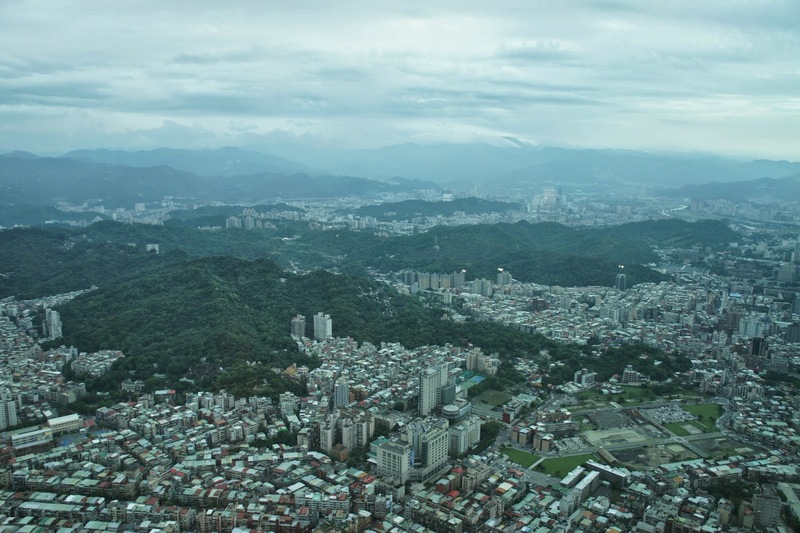 We were even able to see the mountains outside Taipei City. As we were heading towards this room where the tuned mass damper was placed to stabilise the building in the event of an earthquake or typhoon, we spotted an entrance that seem to be leading upwards. 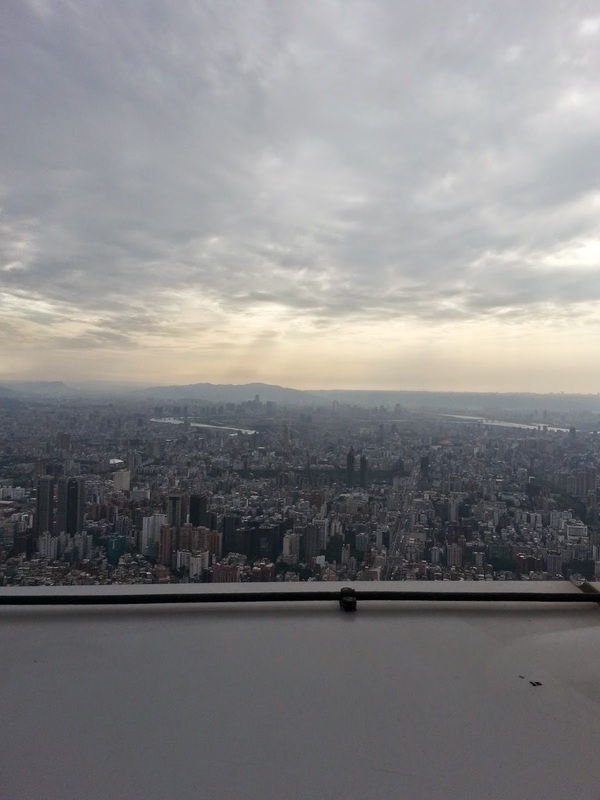 We realised that this is the way to the outdoor observatory deck located on the 91 floor of the building. My friend mentioned he did not been to this part of the building during his last visit as it was closed then. Once outside the outdoor observatory deck, I feel a sense of freedom! I was able to see far into the horizon without being cocooned inside the confines of glass and steel. Though it is chilly at the outdoor deck, the breeze is welcomed! My friend and I spent more time here then indoors, looking around where our hotel is, where we were at and where we are heading next. As it got too chilly for us to bear, we headed back down towards the floor where the damper is located. 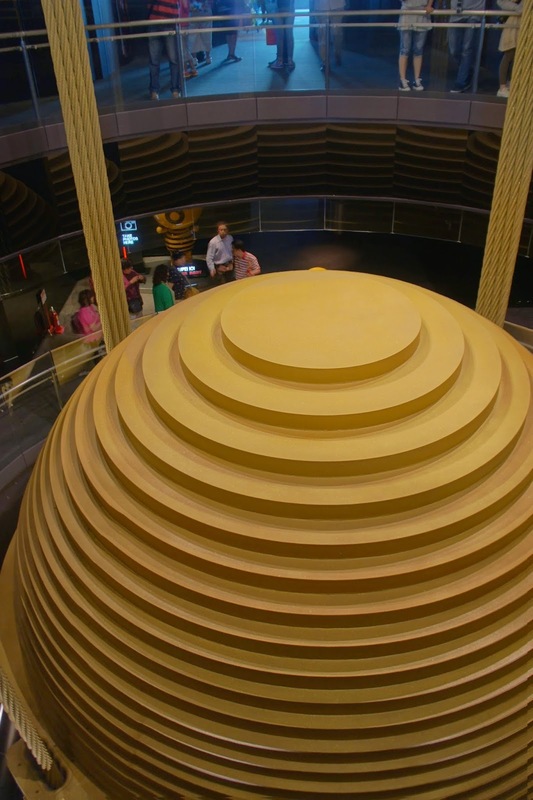 The damper looks like a huge metal ball. Its appearance looked more for ornamental purposes then what it is designed for. 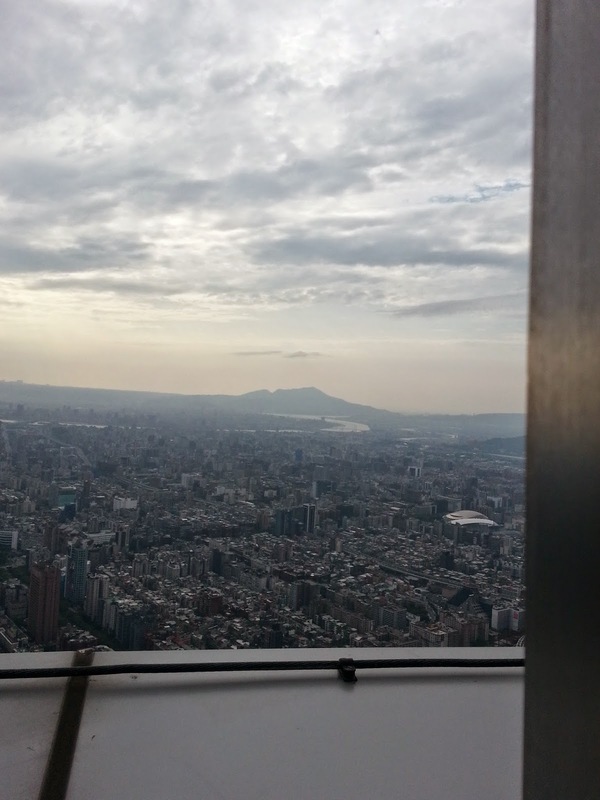 This is where most of the visitors to Taipei 101 will stop before heading down. We then decided to head to our next destination. The exit lifts are located one floor lower from the observatory deck. 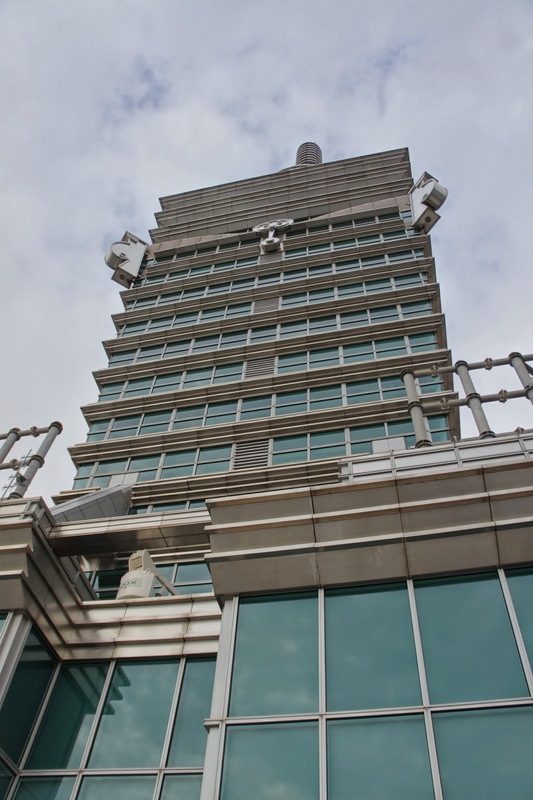 This is the 3rd queue one would have to go through as part of visiting Taipei 101 – queue for the lift to the entrance levels of Taipei 101. We were rather put off when seeing the queue and decided to rest a little. 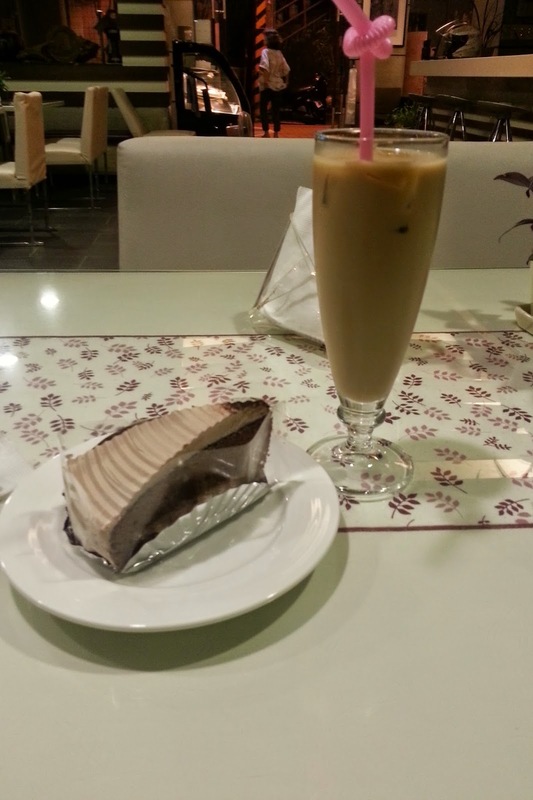 My friend and I ordered coffee and a slice of cake to relax while hoping for the queue to subside. 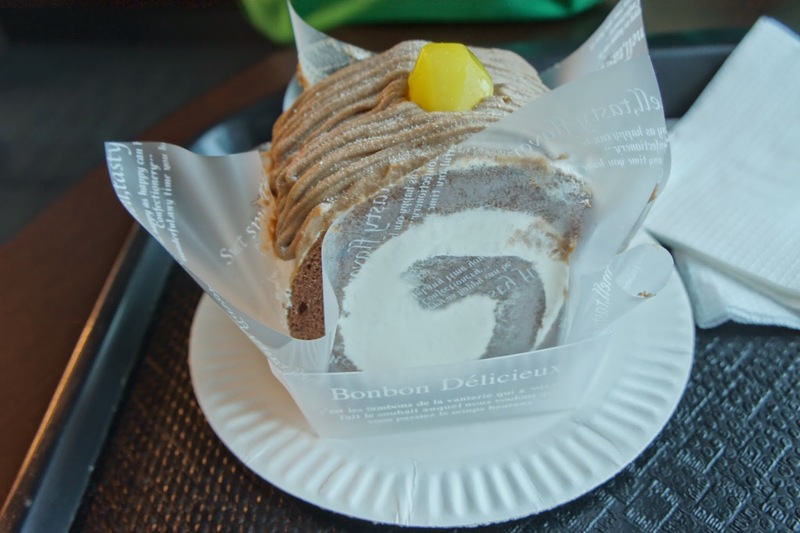 After eating our cake, we returned to the queue. As though the queue have never moved! 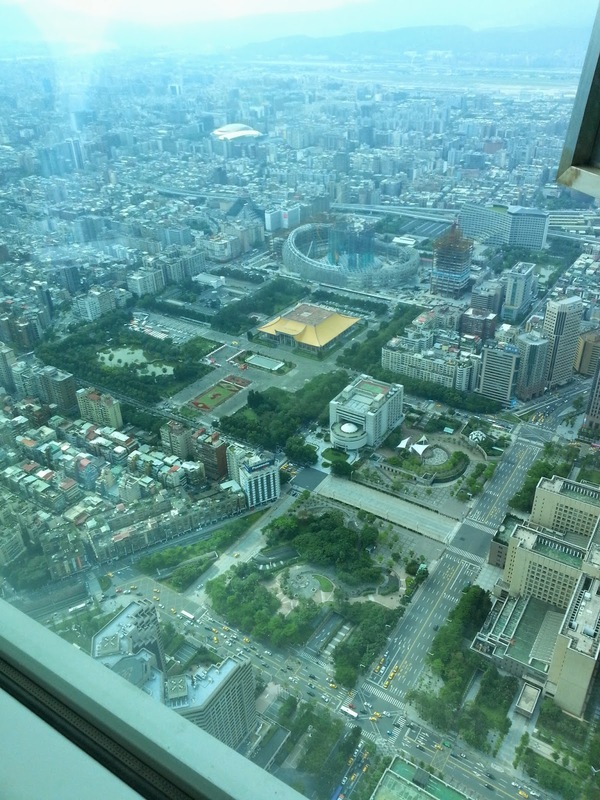 At this point we saw another queue for lifts that stops on level 5 instead of level 1. This is a shorter queue. We opted for this lift instead. 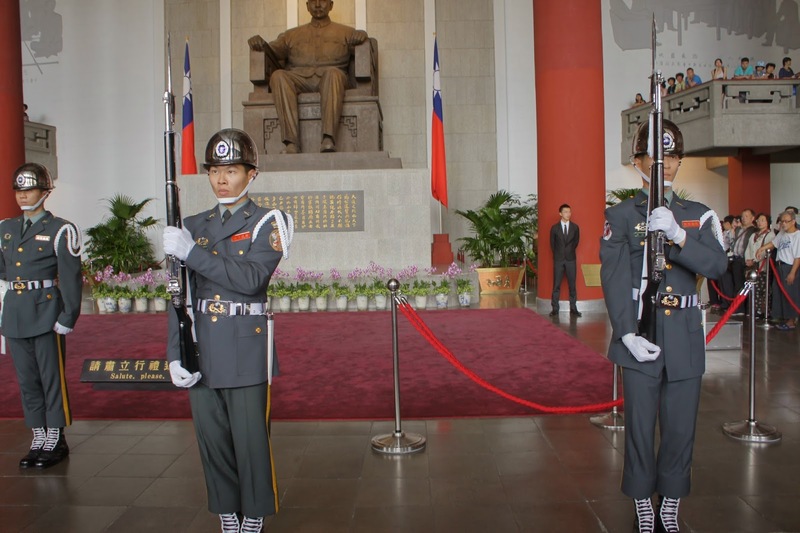 We had planned to visit Chiang Kai-Shek Memorial Hall to observe another change of guard ceremony. 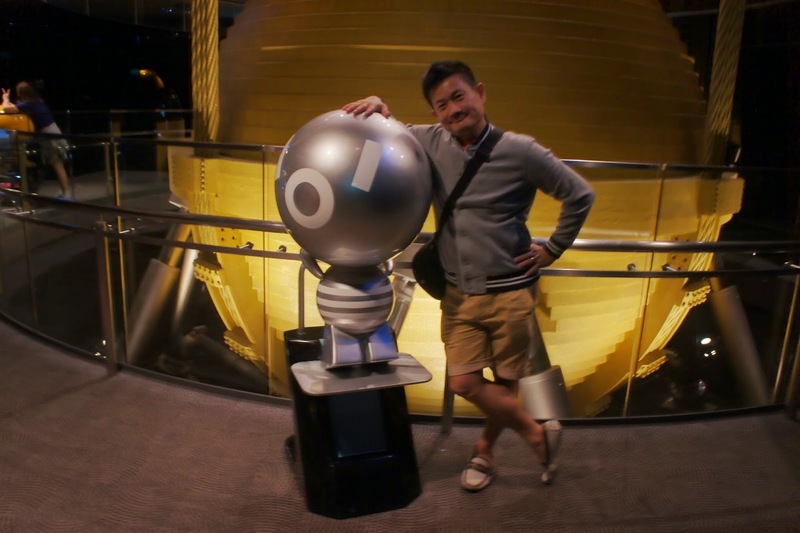 However we visiting Taipei 101 has taken up too much time that Chiang Kai-Shek Memorial Hall was about to close by the time we reached the ground floor of Taipei 101. 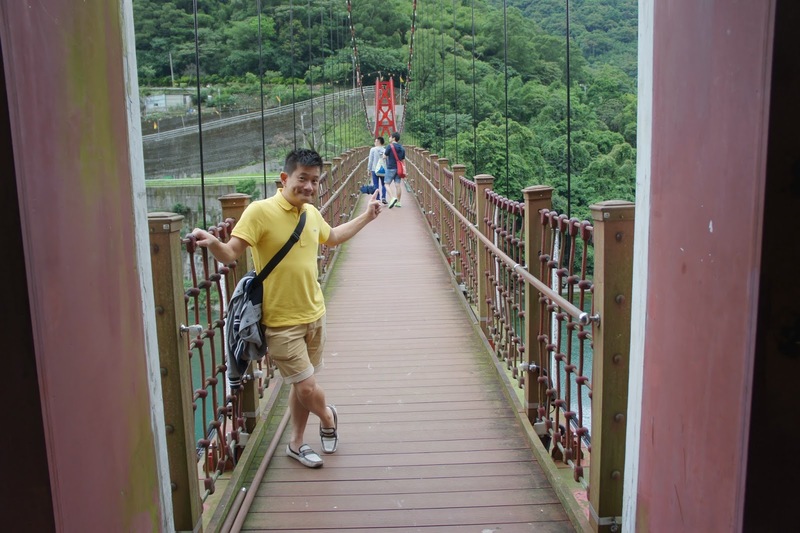 Instead of rushing, my friend suggested to visit Danshui (淡水). 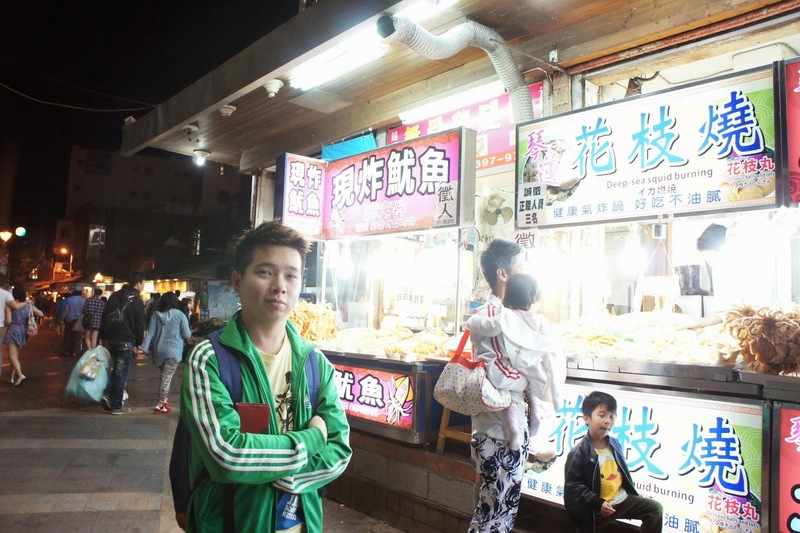 I was told that there is another night market at Danshui. We headed for Danshui on the subway and arrived in no time. Danshui is a coastal town, famous for the Fisherman’s Wharf. As we arrived at Danshui in the night, there is little point for us to take the ferry across the river for Fisherman’s Wharf. 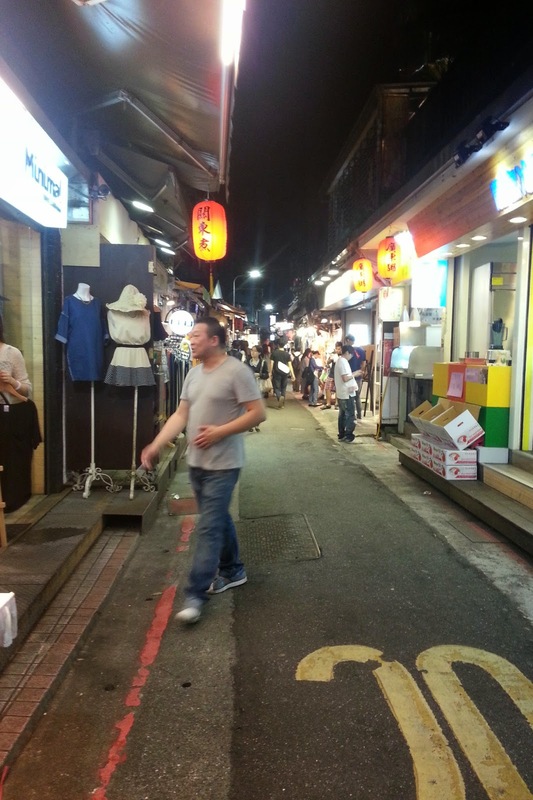 Instead we stayed at the area near the Subway station, where the night market is located. 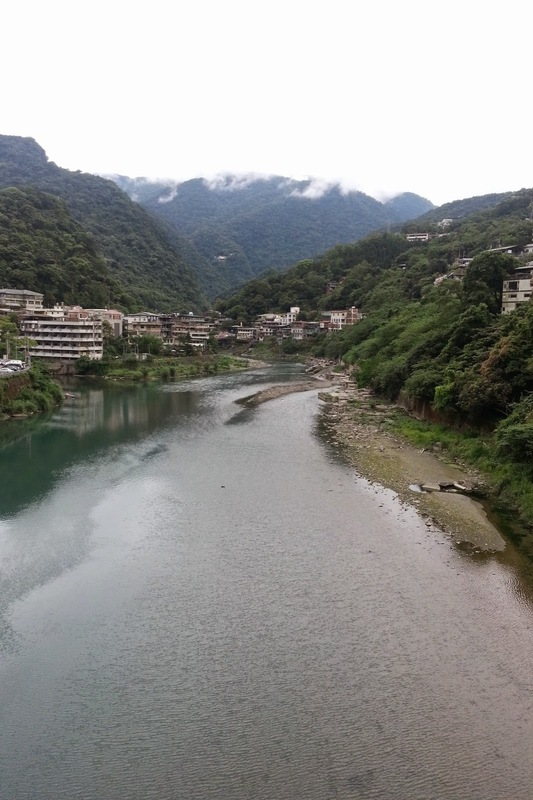 My friend and I headed to the river side, where there are some shops selling goods ranging from clothings to handcrafted keychains. There are also snacks and restaurants in this area. 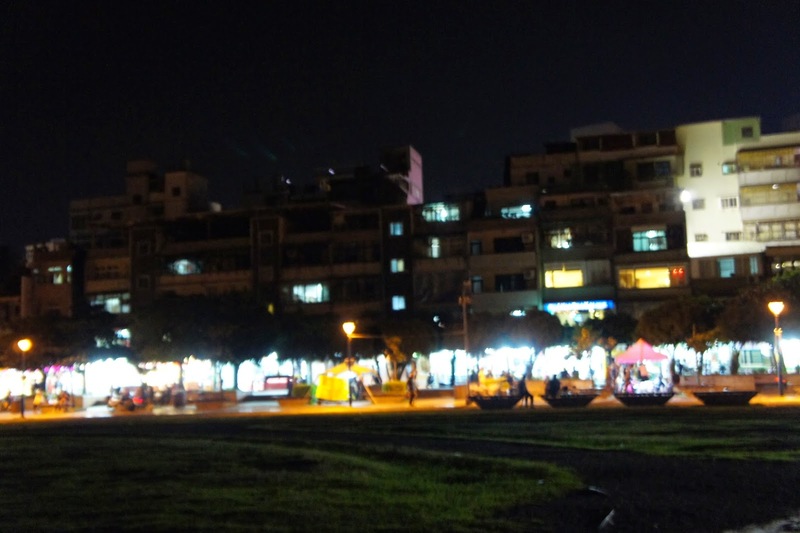 We strolled along the river banks, enjoying the night breeze from the river, after which we headed for the night market. 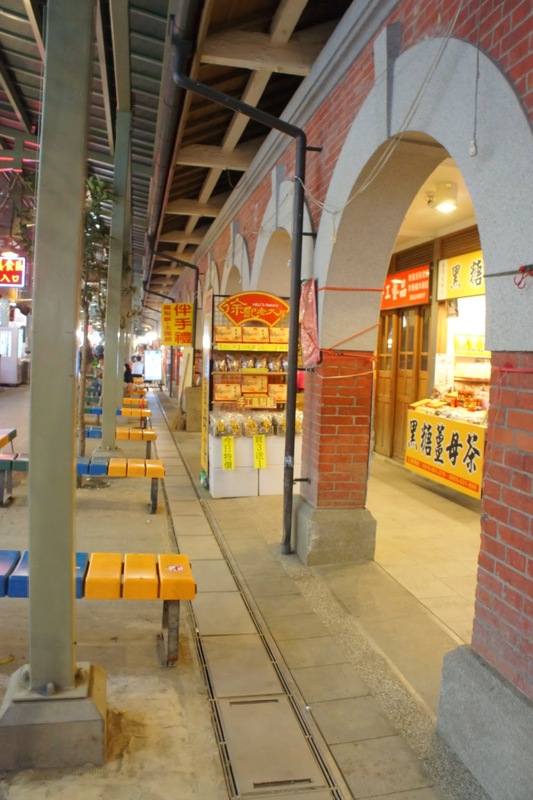 Danshui night market is small in scaled as compared to Shilin and Shida night markets. 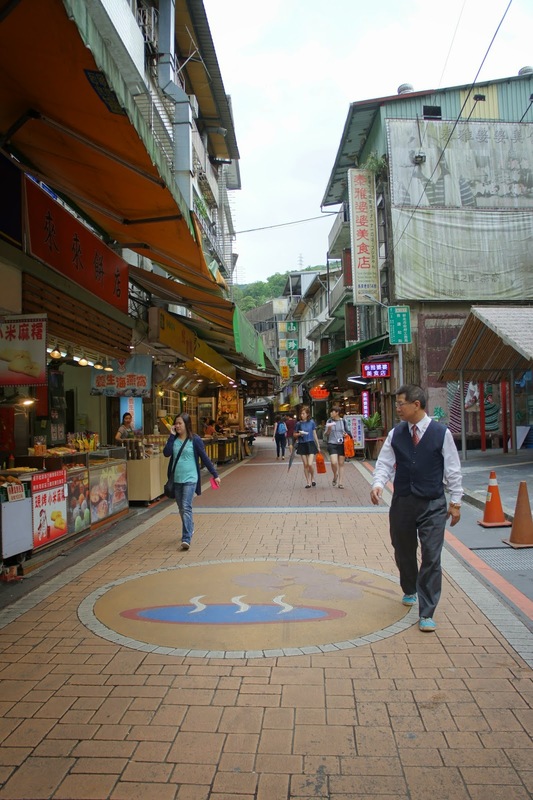 We walked along the street to see if there are some food or souvenirs unique to Danshui. However to our dismay, the merchandise on offer is similar to those that are offered in other night markets. 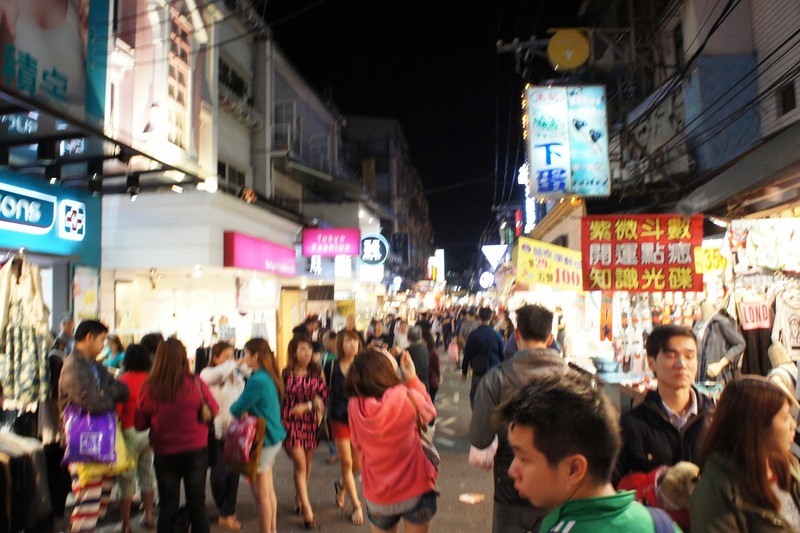 After a short 15 mins stay at the night market (the shops seemed to be closing anyways), we left Danshui and headed back to Shilin Night Market, after all this is our last night in Taipei. 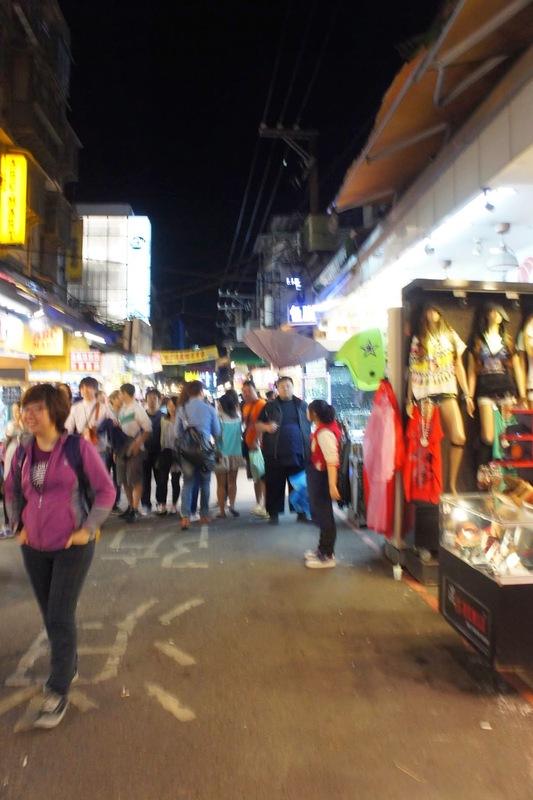 Shilin Night Market is just a few subway stops away from Danshui, we arrived in Shilin Night Market within minutes. 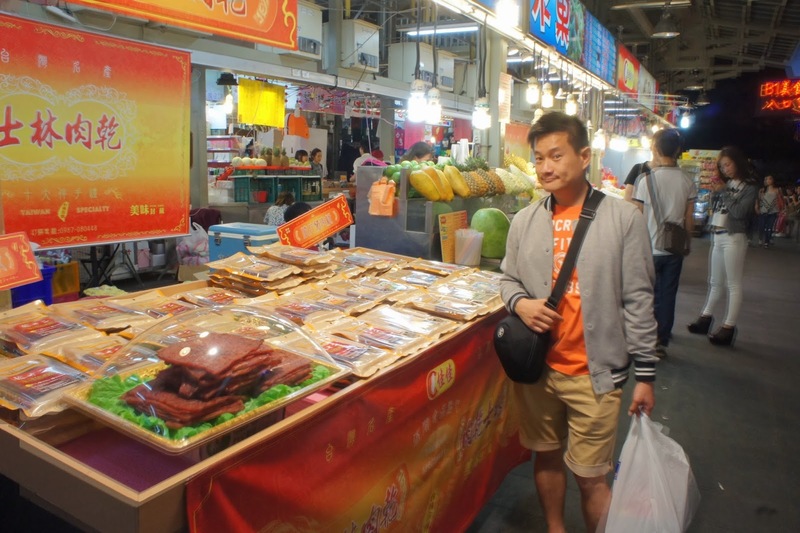 This is our second visit to Shilin Night Market during our short stay in Taipei. Despite having been here just a couple nights before, Shilin Night Market never fail to impress me. The shear size of this night market is befitting the title of Mother of Night Markets. Despite being rather late in the night, most of the stalls remain open. 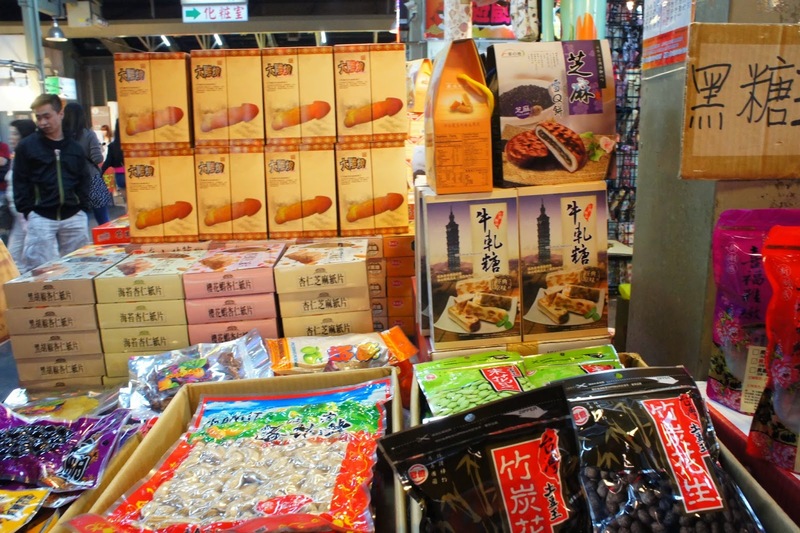 We walked along Shilin Night Market, grabbing snacks along the way, buying cloths and getting some last minute souvenirs. The food being sold here is enormous!! 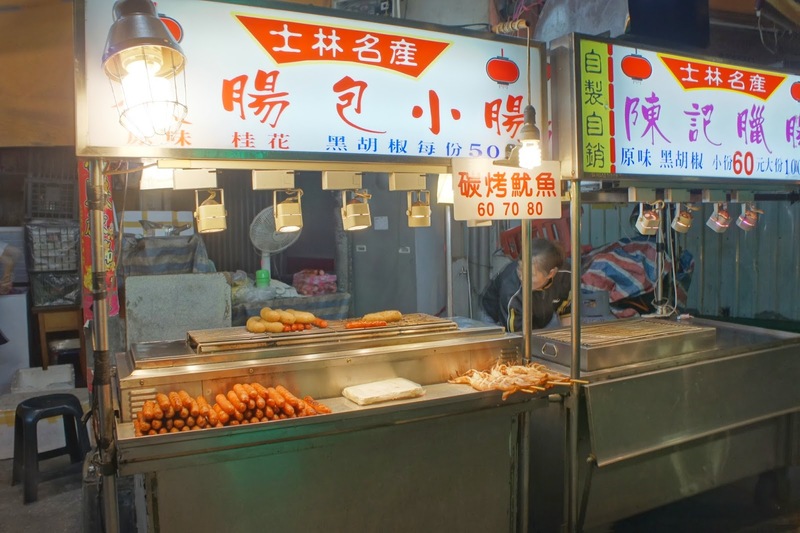 One will never walk around Shilin Night Market without a bite on one’s hands. My friend and I even tried our luck at some of the carnival games and won ourselves some prizes. 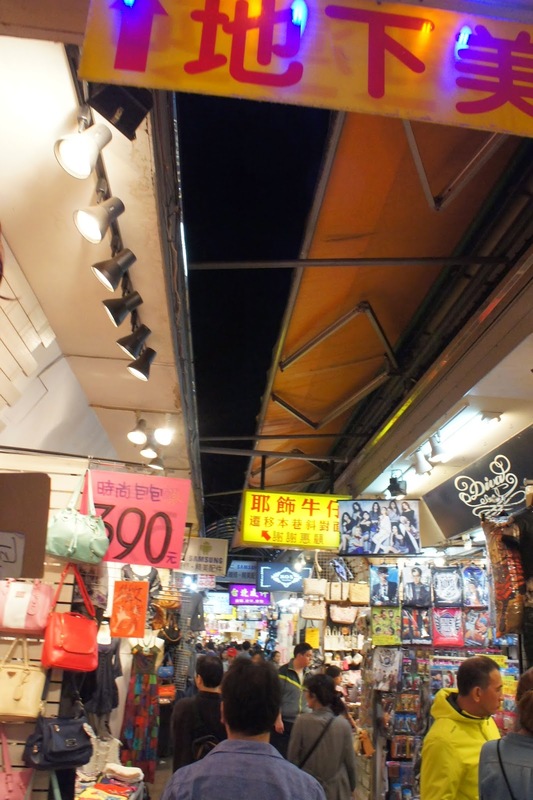 We continued to stay at Shilin Night Market until it closes. This is our cue to heading back to our hotel. Soaking in hot spring popped up when I was planning for this trip. 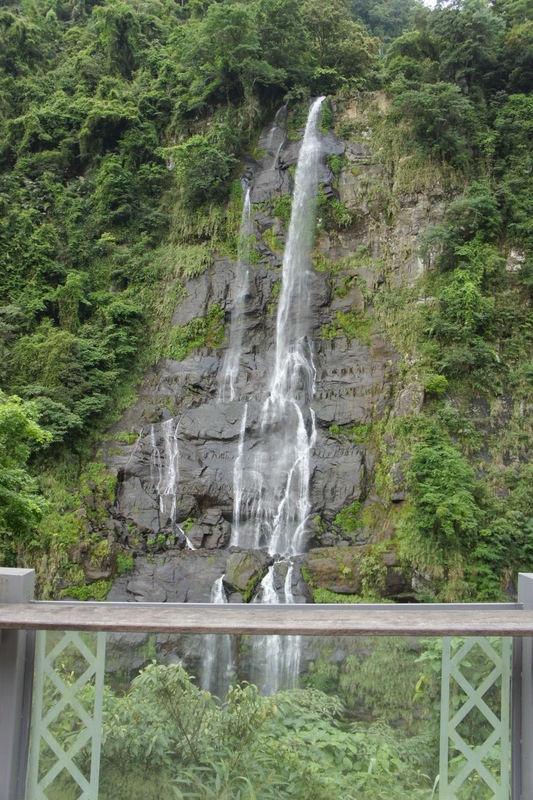 There are several places near Taipei where one can enjoy hot spring bath. 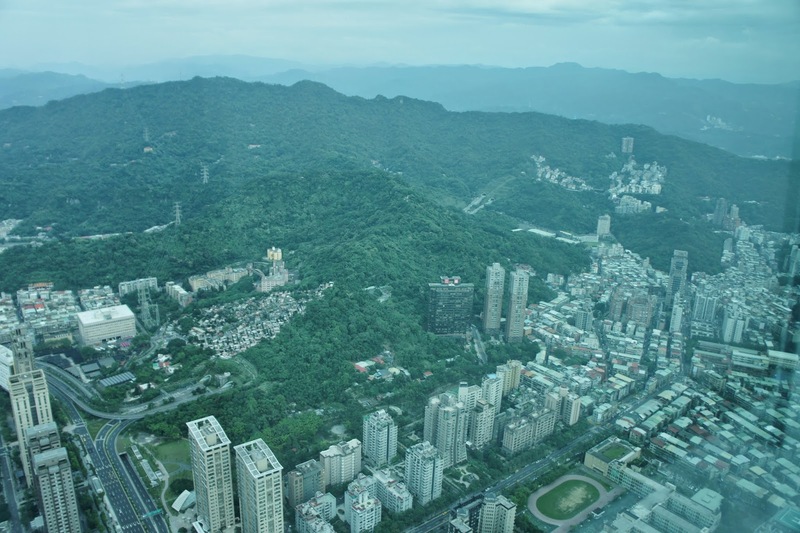 The 2 nearest to Taipei are Beitou and Wulai. 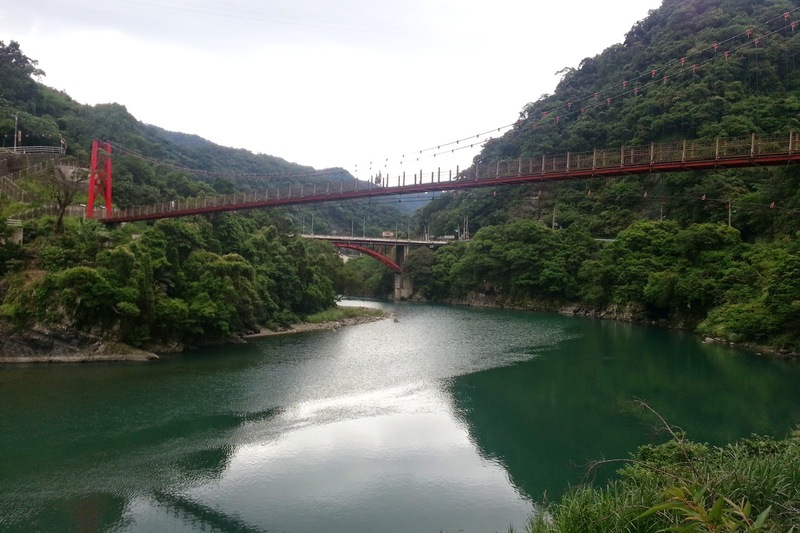 I was recommended Wulai by one of my friends to visit the ones in Wulai, as Wulai has more then hot springs. 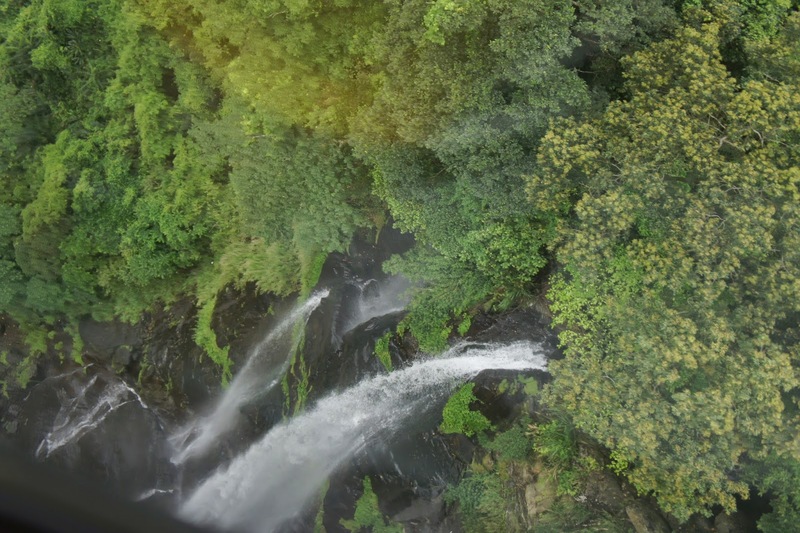 There are scenic views there, particularly the waterfall. 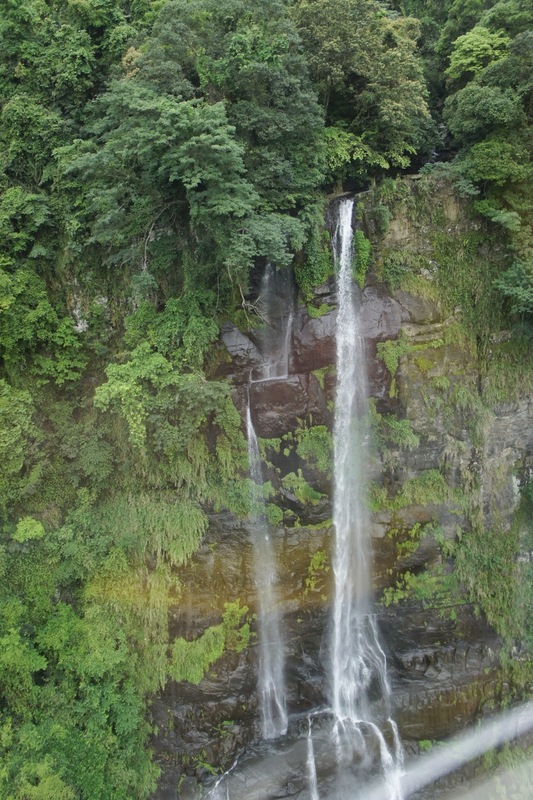 True enough most visitors to Wulai are here for the waterfall and the sceneries. 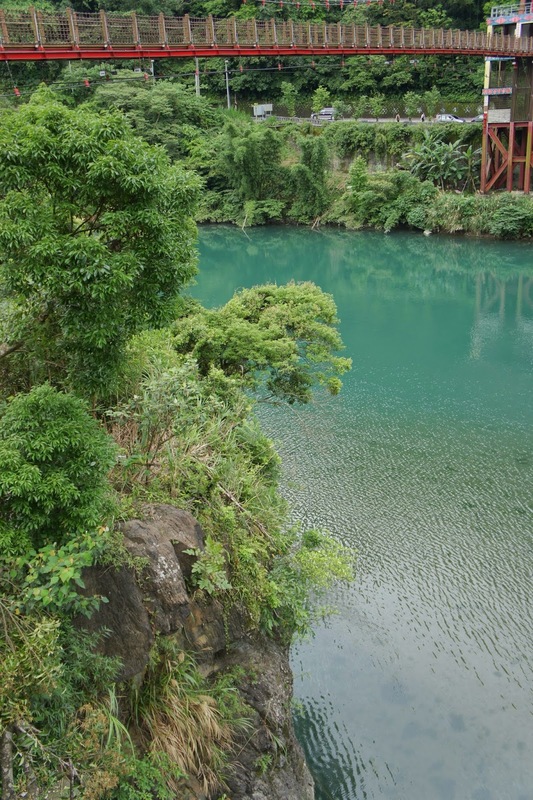 I did a little research and found out that Wulai is actually where the aborigine tribe of Atayal traditional inhibits. 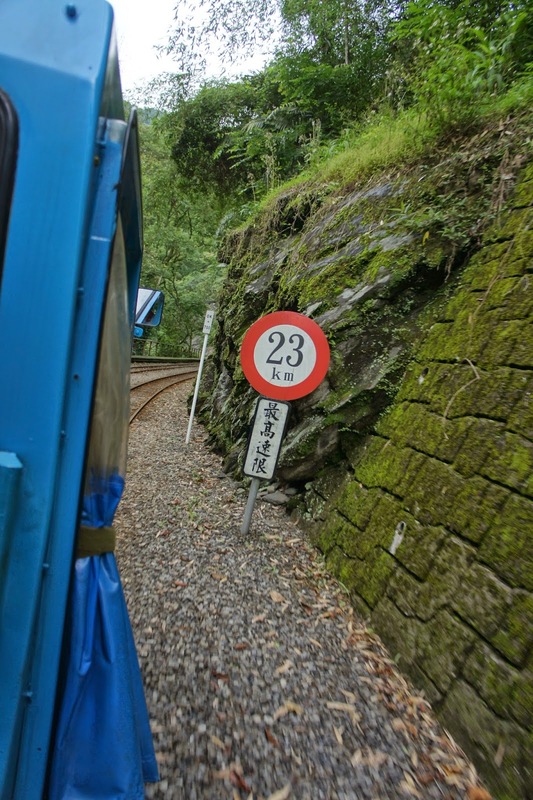 There are several ways to Wulai, of course the more convenient way is to hire a driver to take one straight to Wulai. 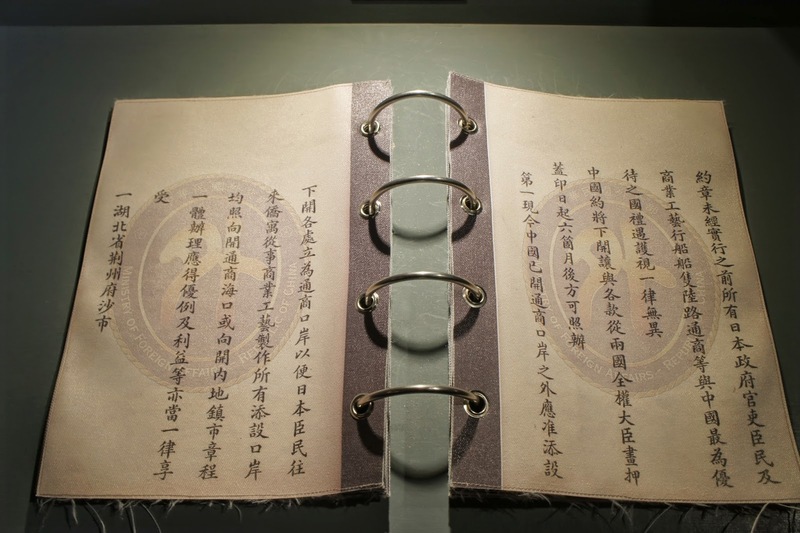 This is option will save a lot of time for visitors to Wulai. 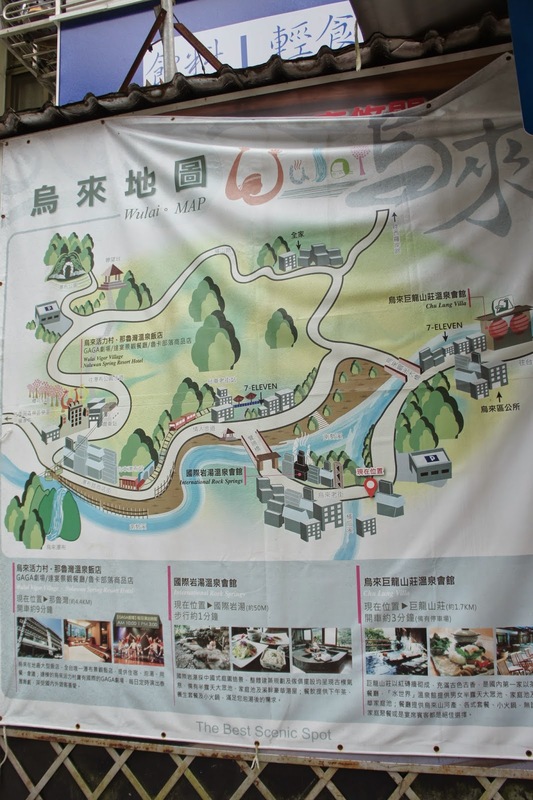 The other option would be to take the subway and then transfer to a bus to Wulai. 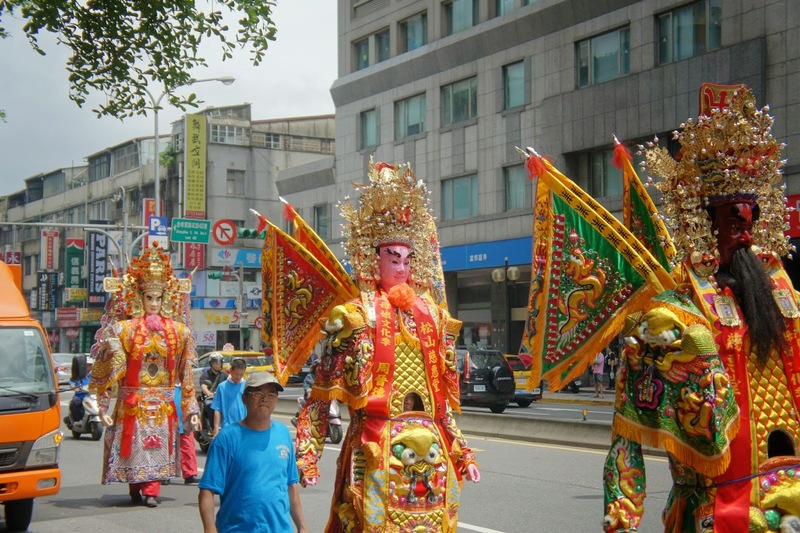 This is a cheaper option and allows visitors to rub shoulders with the locals. 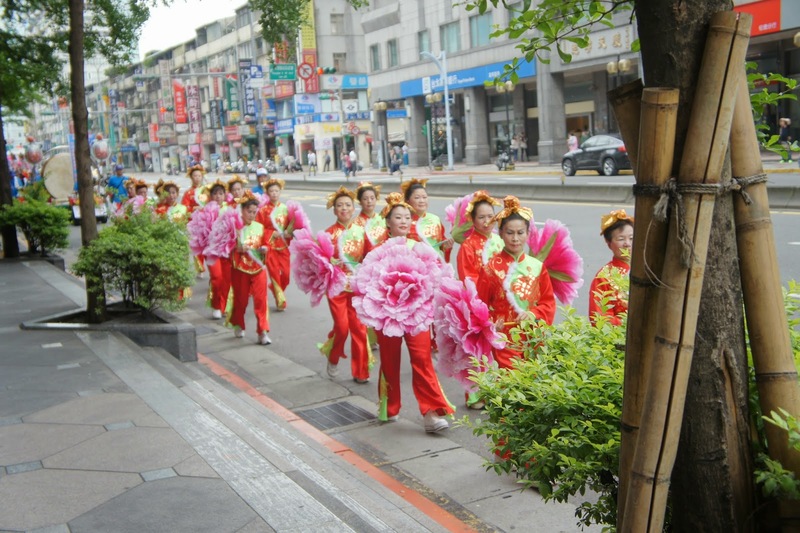 As we were heading towards the subway station in Xinyi from our hotel, my friend and I witness a parade along the roads. 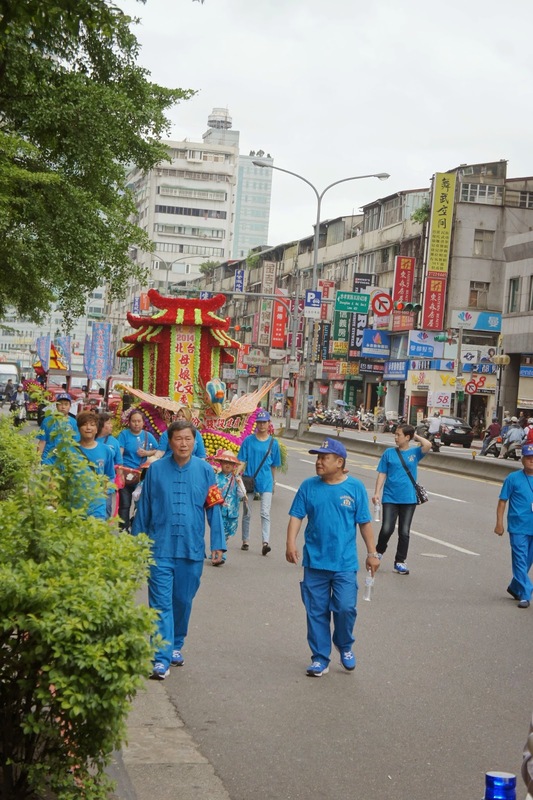 The main street was partially closed for the parade, which celebrates the birth of Goddess of Heaven, a deity in accordance to the Taoist religion most Taiwanese subscribe to. 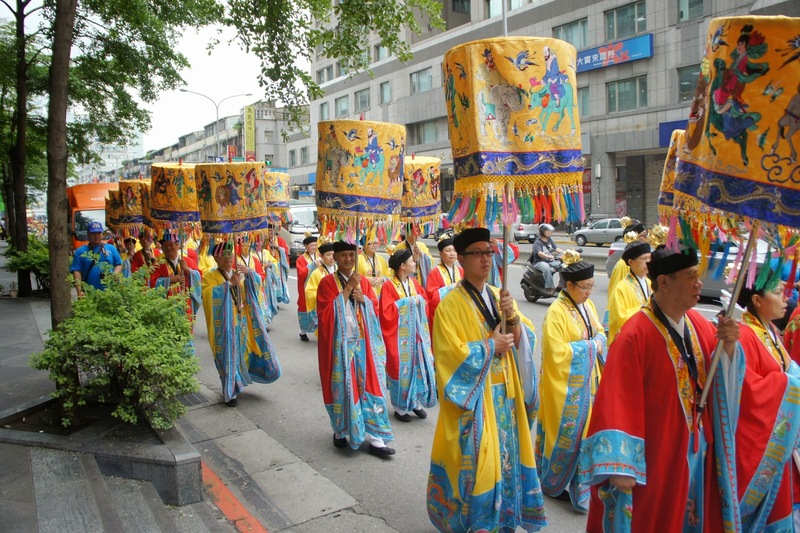 There are locals, part of the parade, dressed up in traditional costumes of Taoist deities and demons walking down the road. 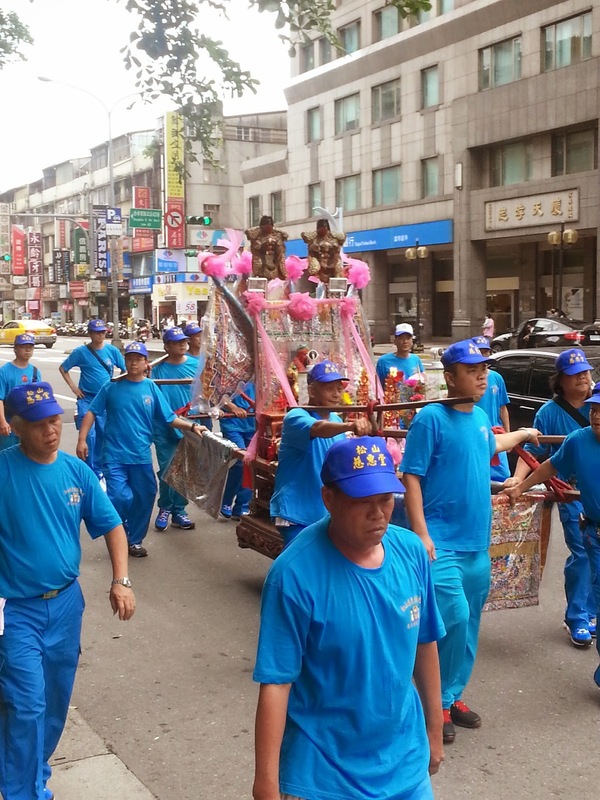 There are firecrackers being set off by some of the parade staffs along the road. 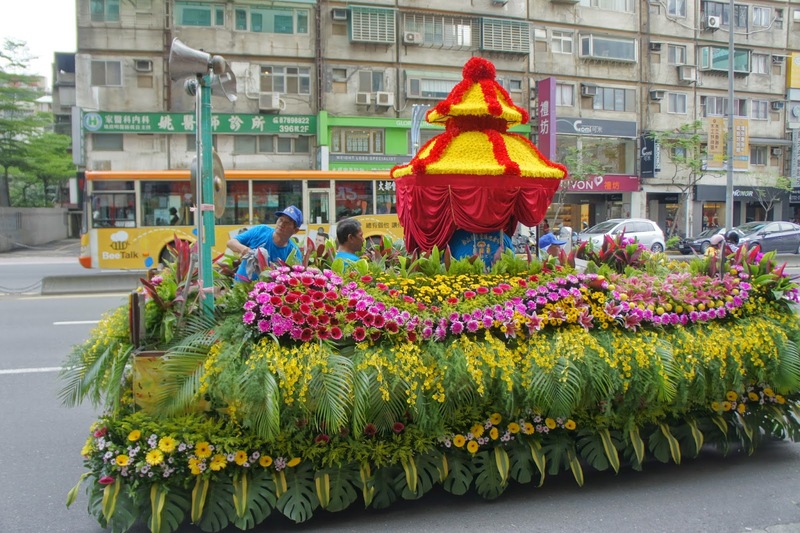 It is a scene of celebratory. As we were taking pictures, some of the staffs stopped by and volunteered to take pictures with us. 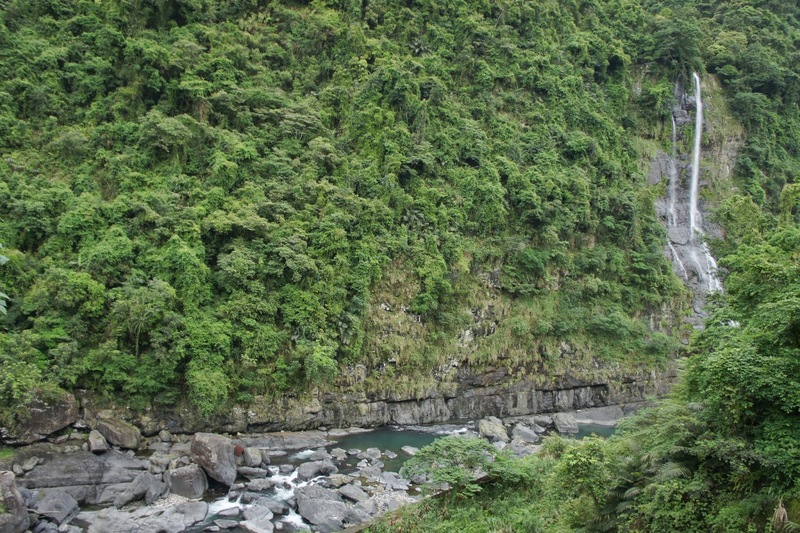 This truly shows the warmth and welcoming nature of the Taiwanese. 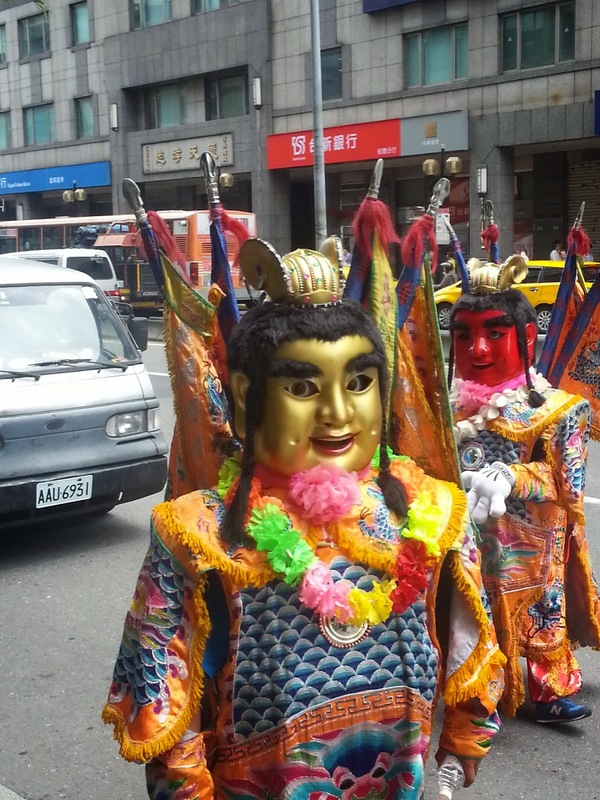 After the parade past by, my friend and I headed towards the subway station. 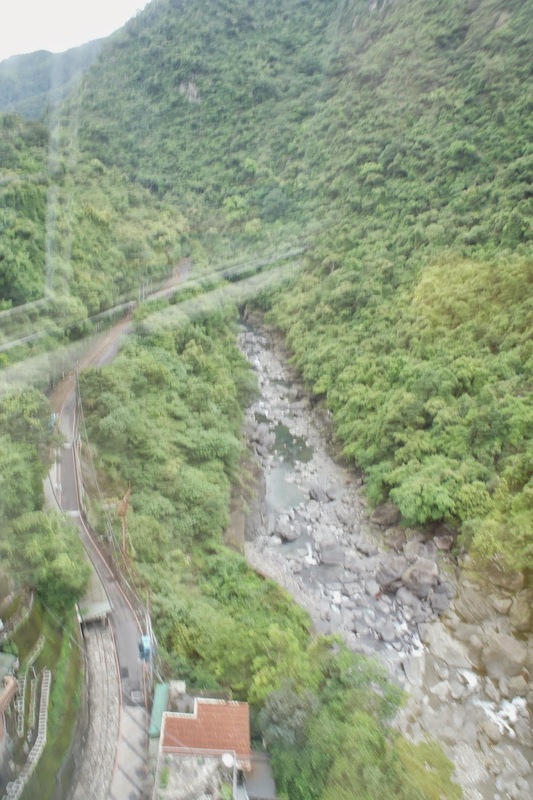 We took the subway to Xindian station, where we will be changing to a bus, which will take us to Wulai. 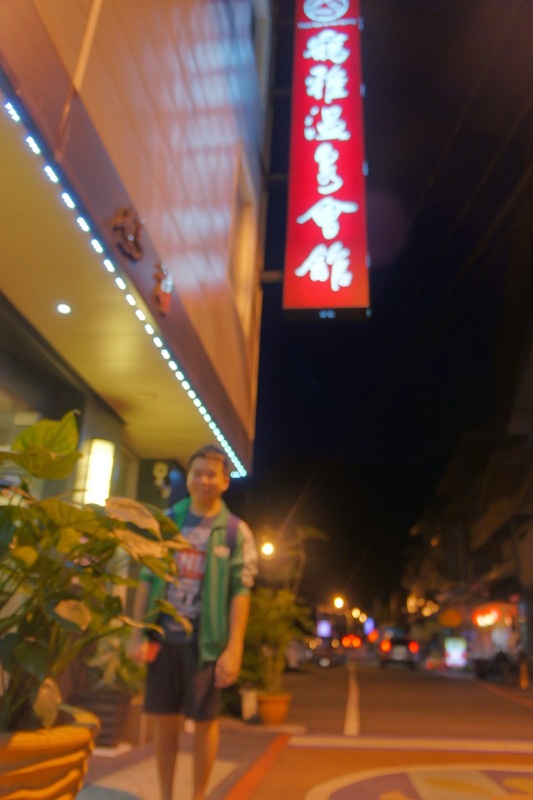 As we were waiting for the bus, my friend saw a restaurant selling traditional Taiwanese food. 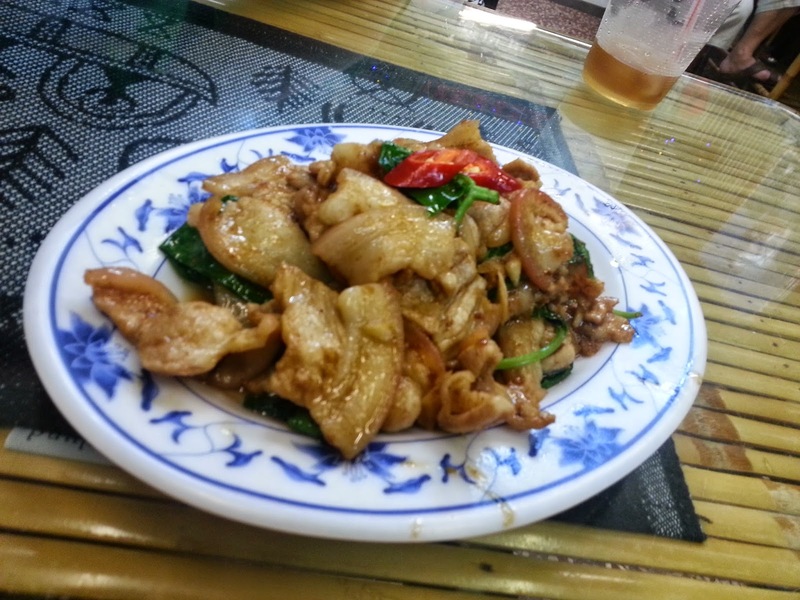 The food offered in the restaurant is very tasty and is at the right amount of saltiness, sweetness. We had the braised pork rice. 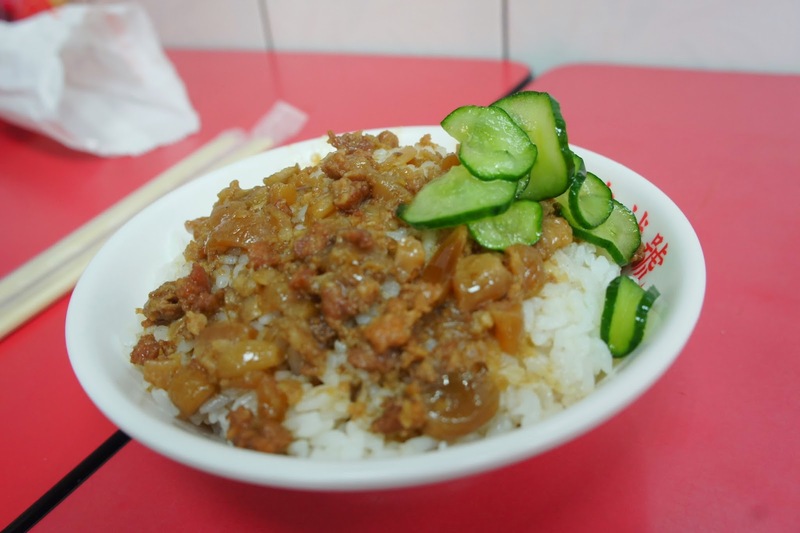 The pork was tender and well braised, coupled with the rice, it is heavenly. 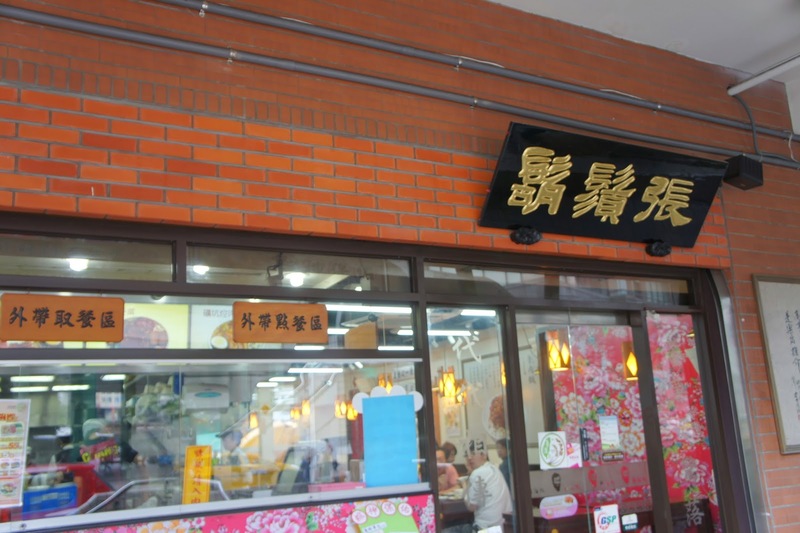 Do pop by this restaurant should one travels to Wulai via the subway. After lunch we proceeded to the bus stop to wait for the bus to take us to Wulai. The bus was regular and we did not have to wait for too long before the next bus heading to Wulai comes. 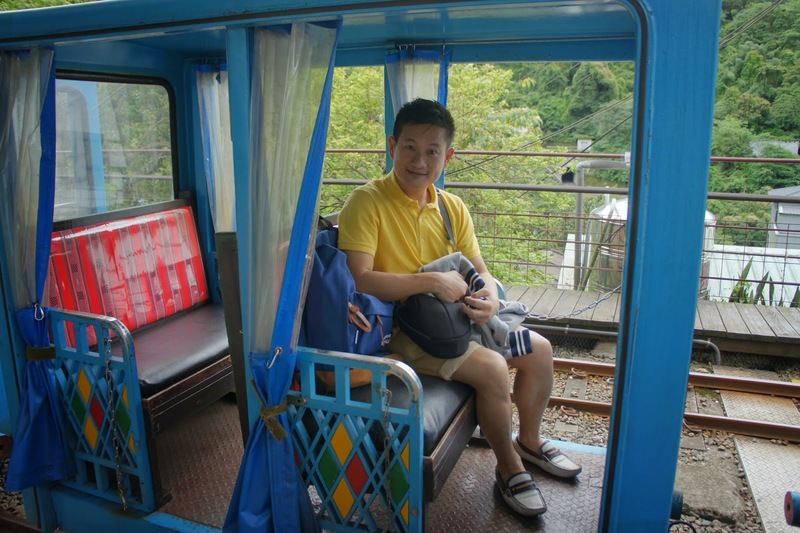 As this is the only bus to Wulai, many visitors and locals alike boarded the bus. 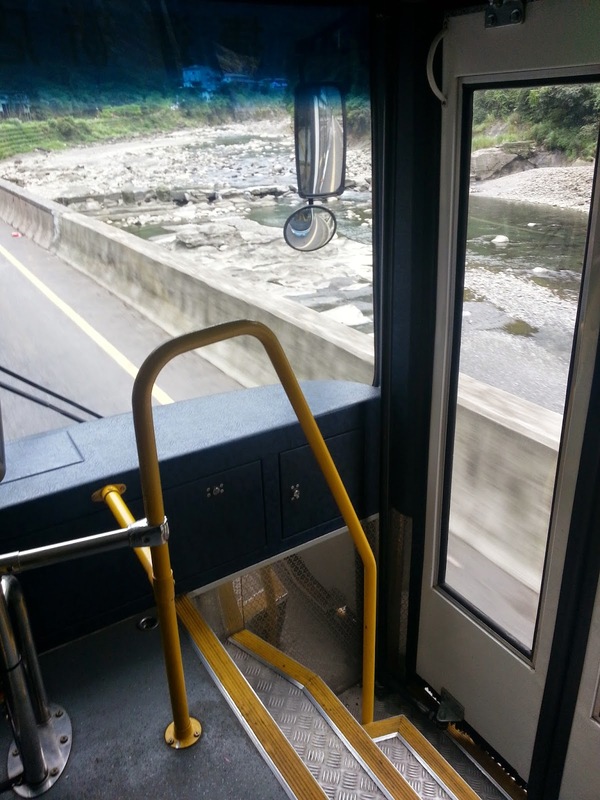 The bus goes through city roads and windy mountainous routes and finally reached Wulai in around 30 mins. 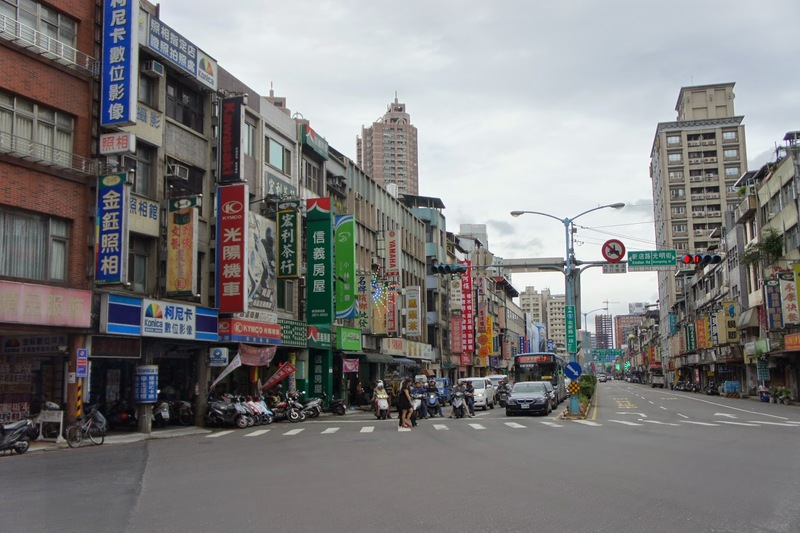 For visitors to Wulai, the final stop for this bus is at Wulai bus terminal, which is located within 5 mins walk to Wulai Old Street. 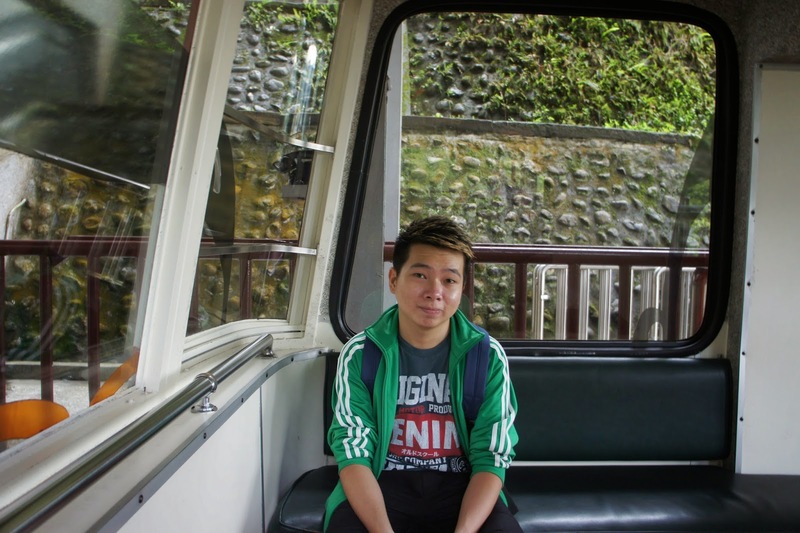 When we alighted from the bus, My friend and I were captivated by the scenery just by being at the bus terminal. This is where the greeneries from the mountains meets the blues from the river running down from the mountain. We saw a number of locals enjoying themselves by the river banks. 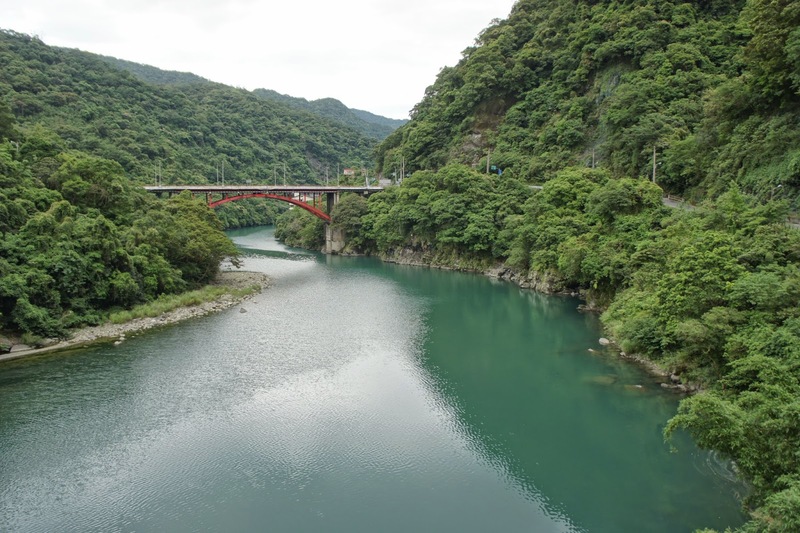 The water in the river contains natural spring water, it is well known for its benefits by the locals. 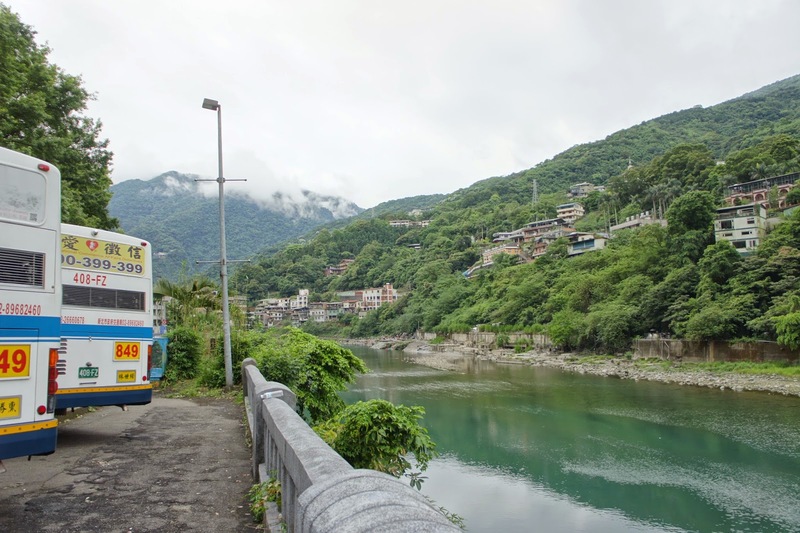 From the bus station, we spotted a suspension bridge which links to a temple across the river. 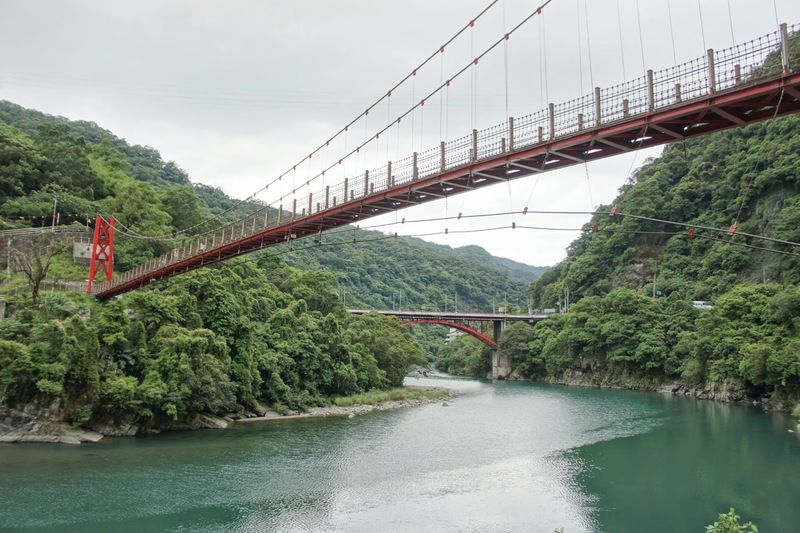 My friend and I hurried to the suspension bridge to see if we could get a good spot to take some nice pictures of the surroundings. 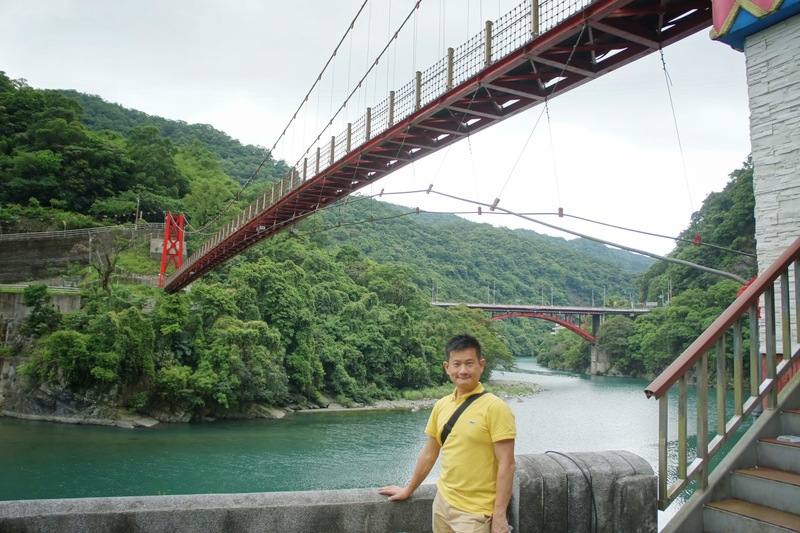 True enough, the best spot to capture the mountains, the valleys and the river would be on this bridge. After taking some pictures, we headed over to the temple on the other end of the bridge. 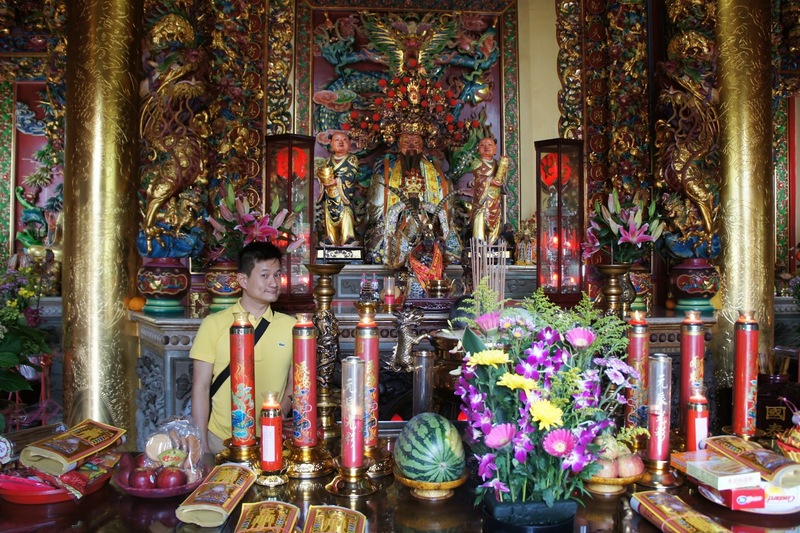 The single storey Taoist temple, despite being modest in size, is by no means modest in the decorations and the carvings on the temple building. 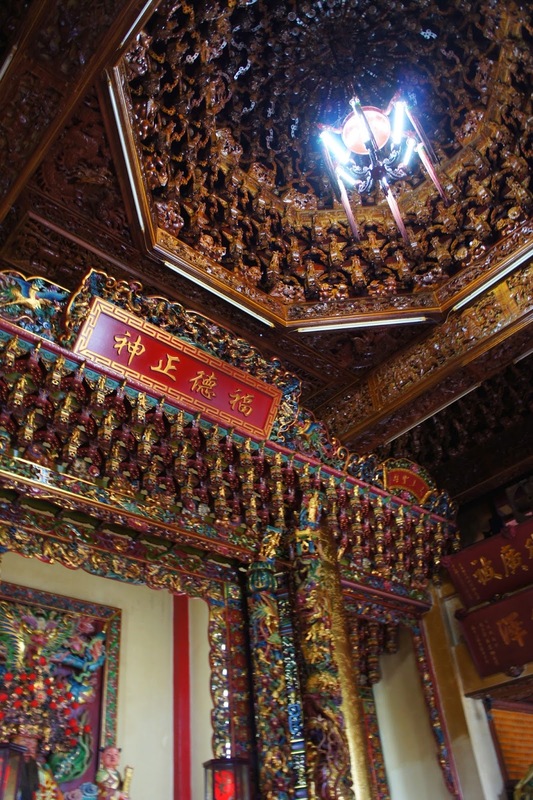 We spotted the traditional dragon carvings on the roof and the walls of the temple. 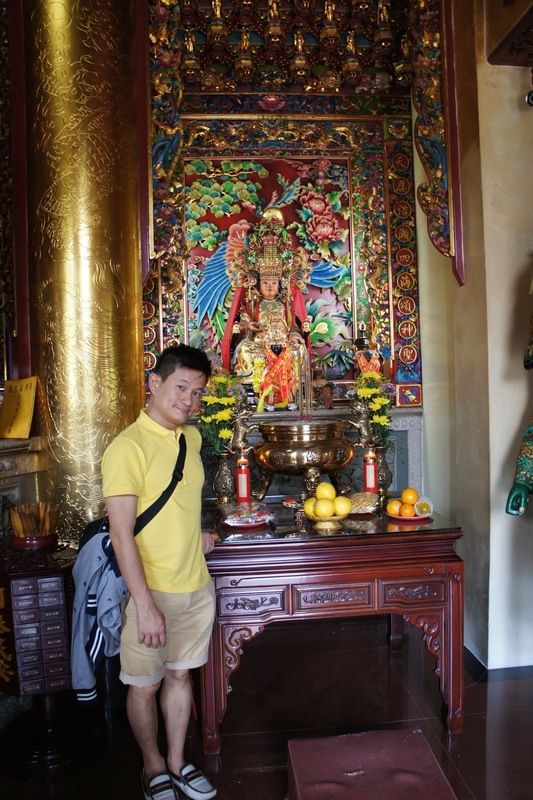 Since we are already here, my friend and I proceeded to the temple to offer our prayers to the local gods, after which my friend and I headed to the front of the temple, where one can get a nice view of Wulai. 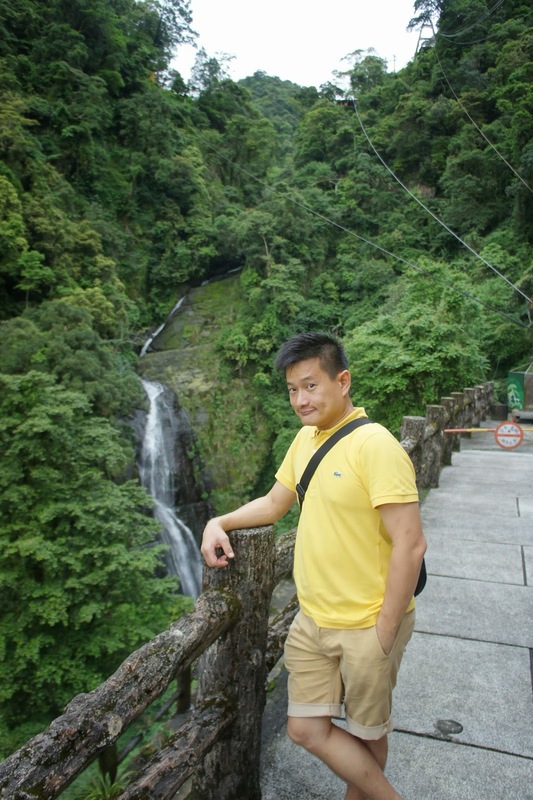 We were mesmerised by the scenic view from the front of the temple into Wulai and started to snap our camera away. 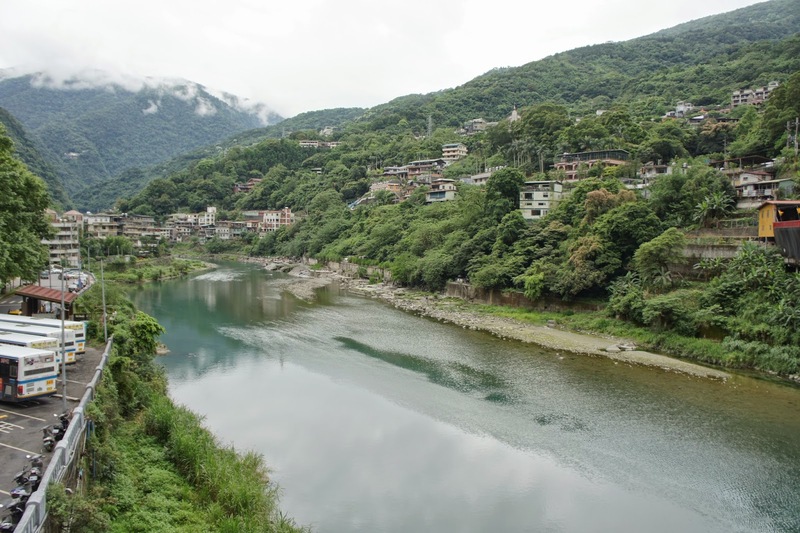 From here, one can glimpse into the vast landmass in Wulai, views of the river and the town, with the surrounding mountains as the backdrop. As the temple wasn’t crowded at the time of our visit, this makes a great spot to take undisturbed scenic pictures of Wulai. 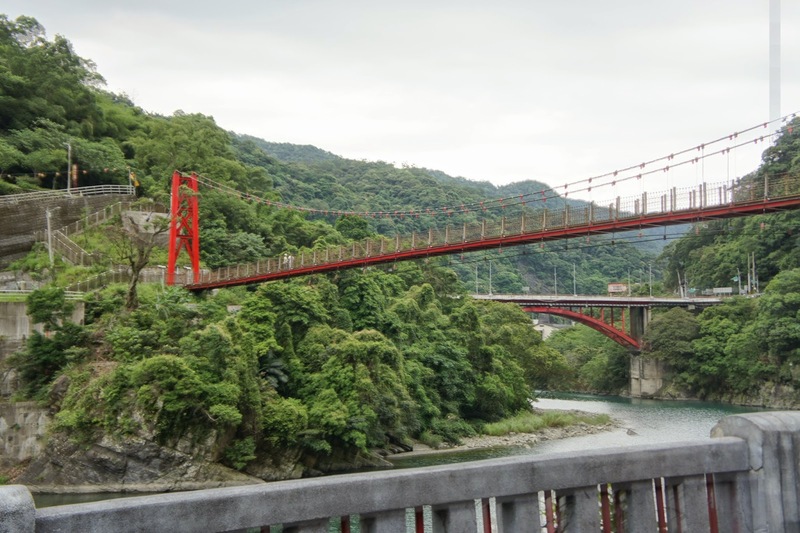 We headed towards Wulai town via the suspension bridge. From here, one would have to walk pass the bus terminal. 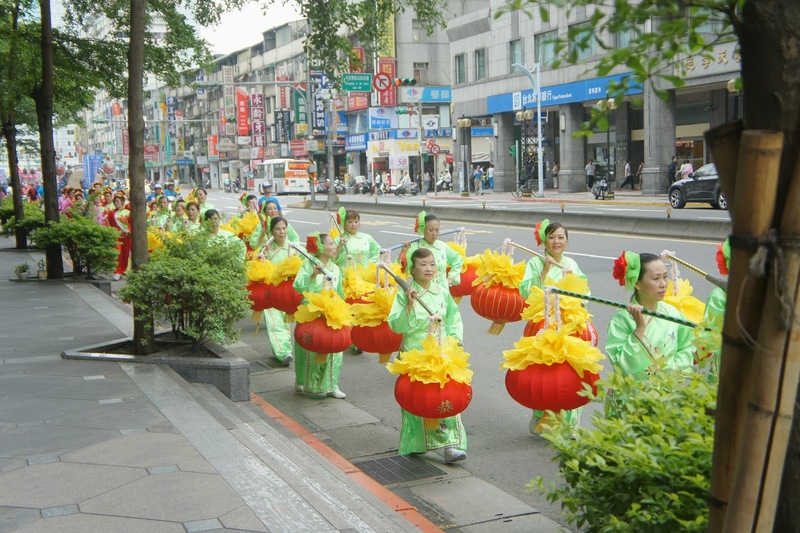 Wulai town is accessible via foot within mere minutes. Soon we were at the Wulai town, at the beginning of Wulai Old Street. 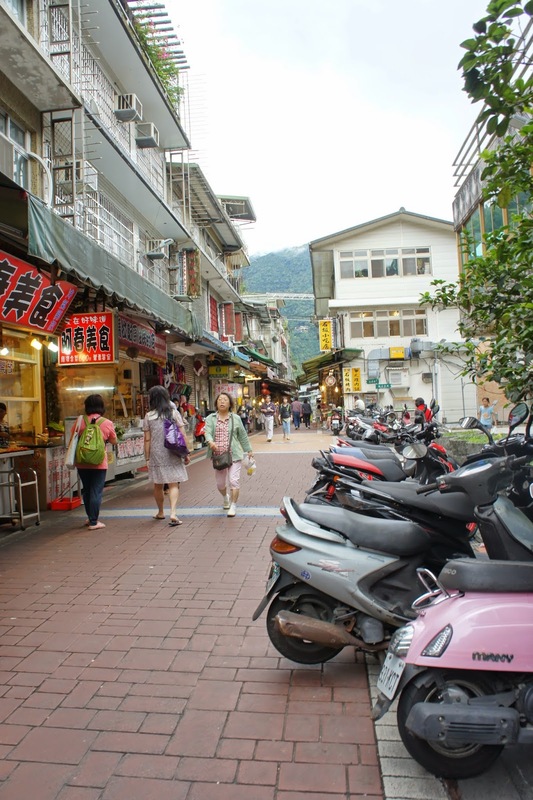 There is a Atayal Tribe museum on the right, located at the start of Wulai Old Street. 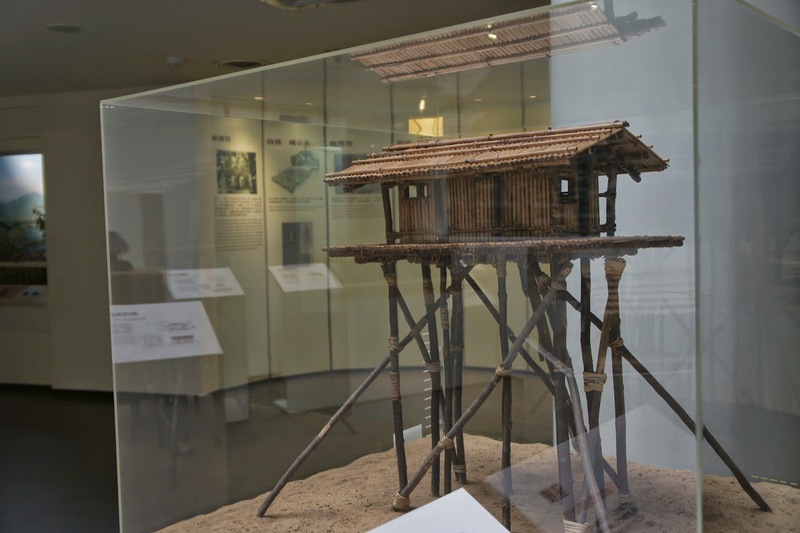 The 3-storey museum is open to public at no charges and gives visitors an in-depth understanding of the culture, the way of life and the beliefs of the Atayal Tribe. 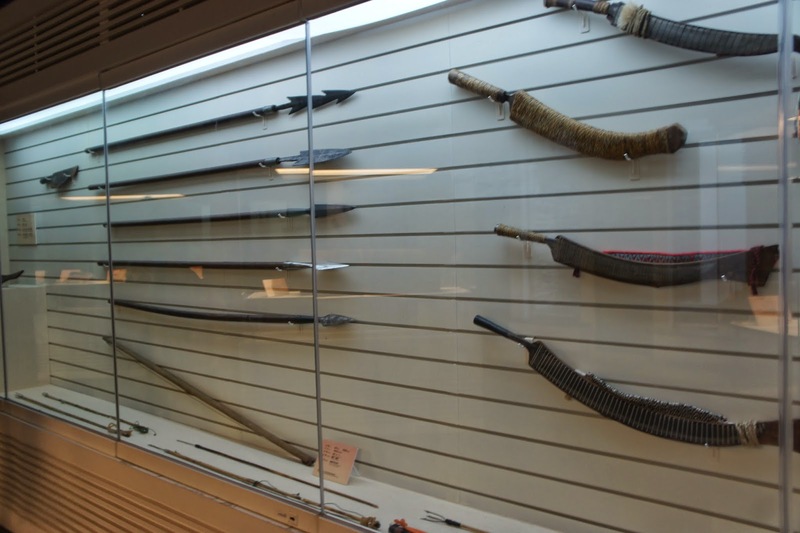 There are also exhibits on the equipment, both hunting and for daily livelihood, on display here. 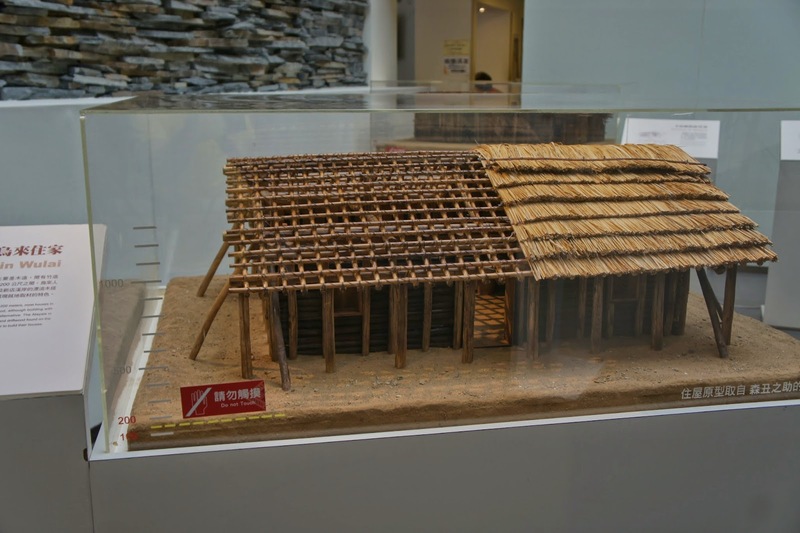 There is a small shop in the museum for visitors to pick up some traditional tribe souvenirs. 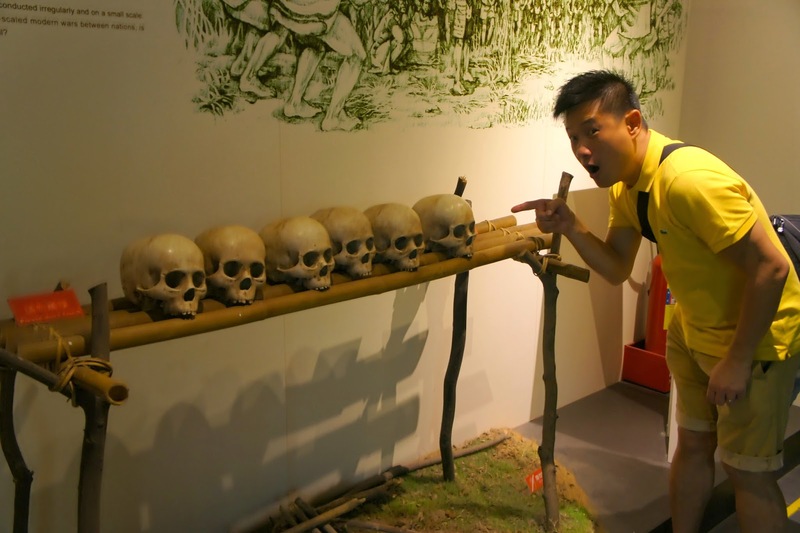 This is a great place to explore and one can be expected to spend at least an hour to understand the way of life of the Atayal Tribe. Exiting the museum, my friend and I wanted to head to the waterfall next. 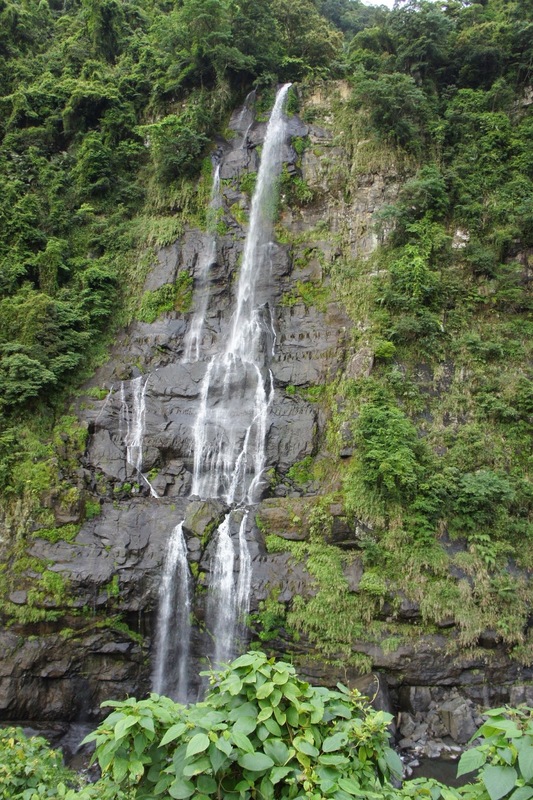 In order for one to reach the waterfalls, one would have to walk through the Old Street. 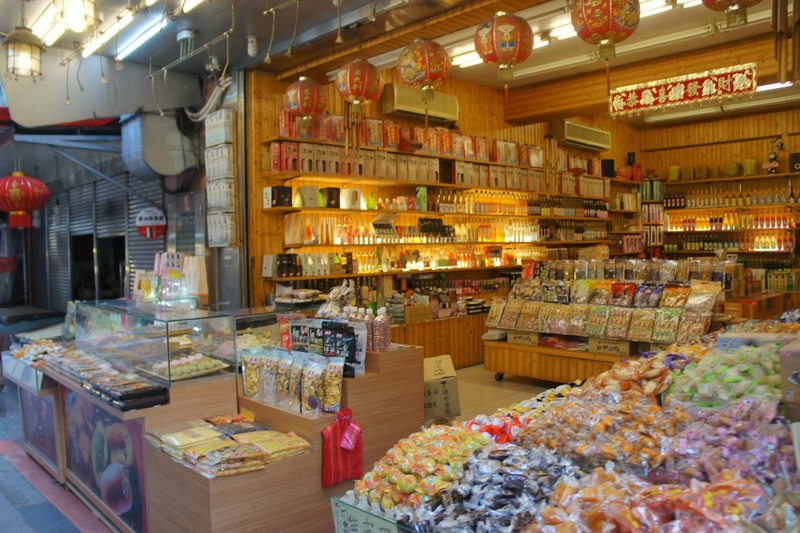 Walking through short Wulai Old Street (as compared to that in Jiufen), we saw shops selling a variety of merchandise ranging from local delicacies to snacks to souvenirs. 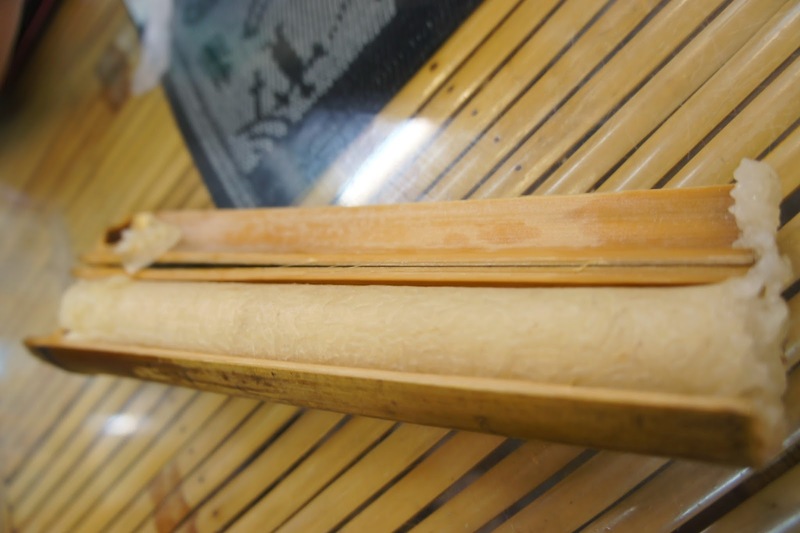 Nothing here is unique to Wulai and one can easily grab these from Taipei city itself. 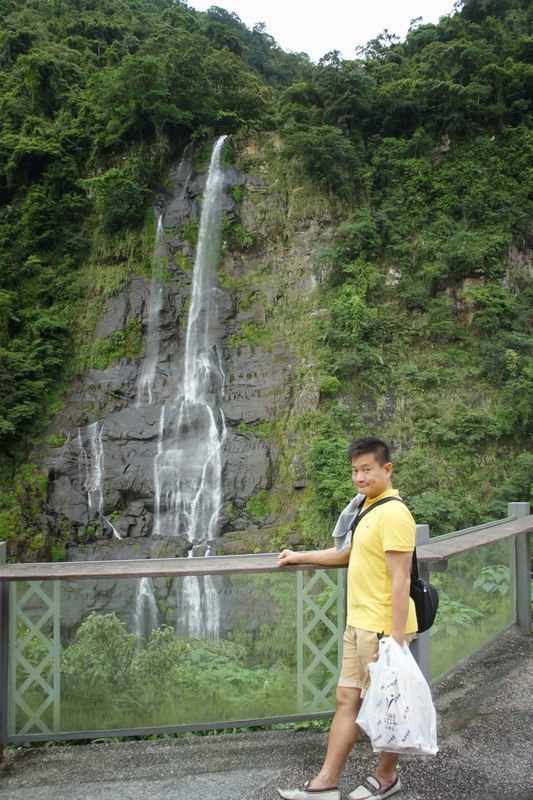 My friend and I merely browsed through the goods on offering and headed towards the waterfall. 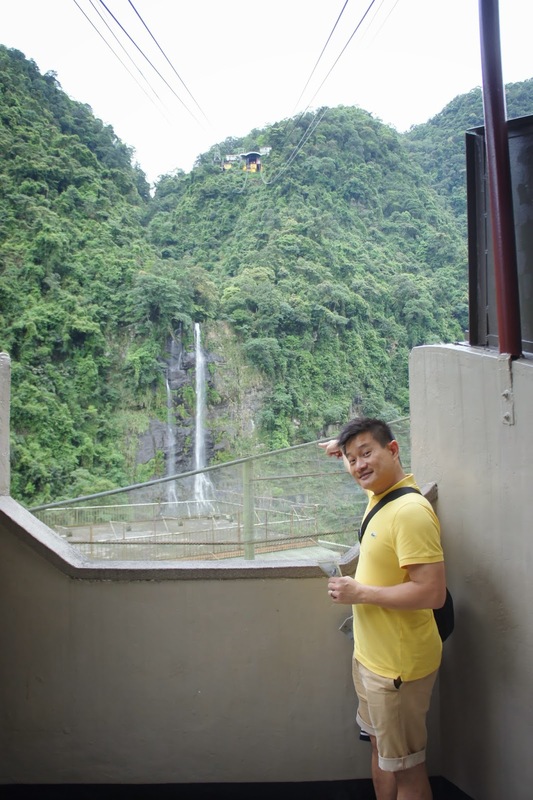 There are 2 ways to get to the waterfall. 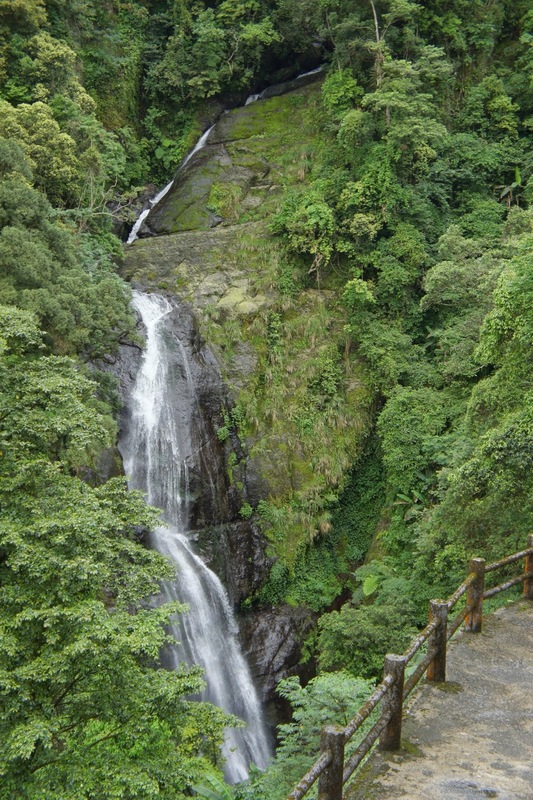 One can either choose to walk to the view point by foot, through the Lover’s Walk (a street that is famous for couples to stroll while admiring the scenic surroundings), or take the Wulai Log Cart towards the waterfall view point. We opted for the Log Cart ride as it sounded refreshing. 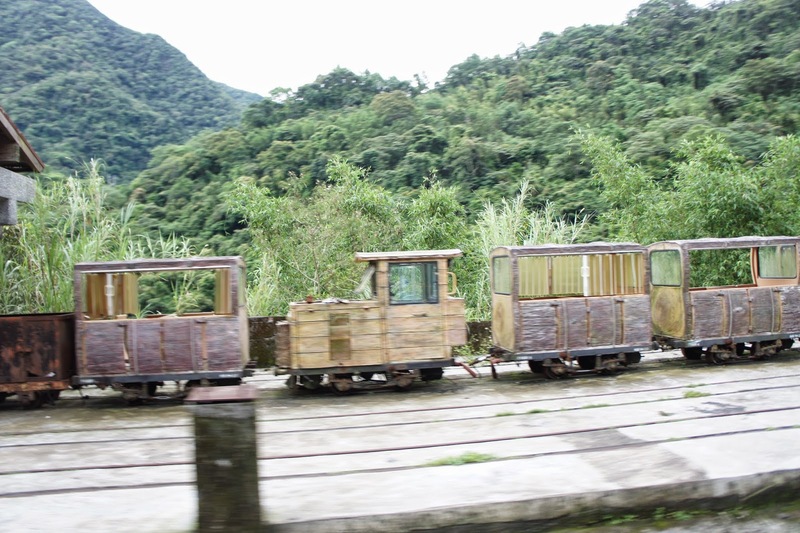 The Log Cart ride is essentially a tram system that brings visitors to the view point station. It is a relaxing way of absorbing the scenery whilst allowing the breeze caused by the log cart ride to caress one’s face. The ride took around 5 mins soon the waterfall is before us. 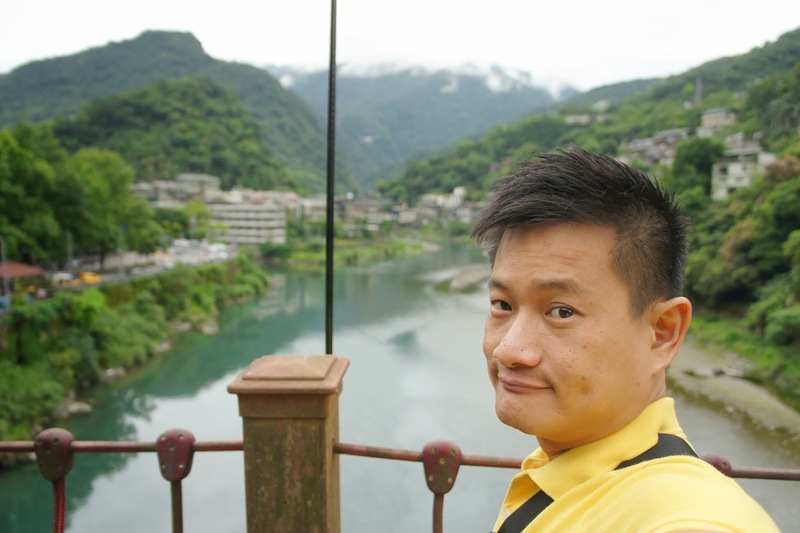 My friend and I hurried to the view point and took some pictures. 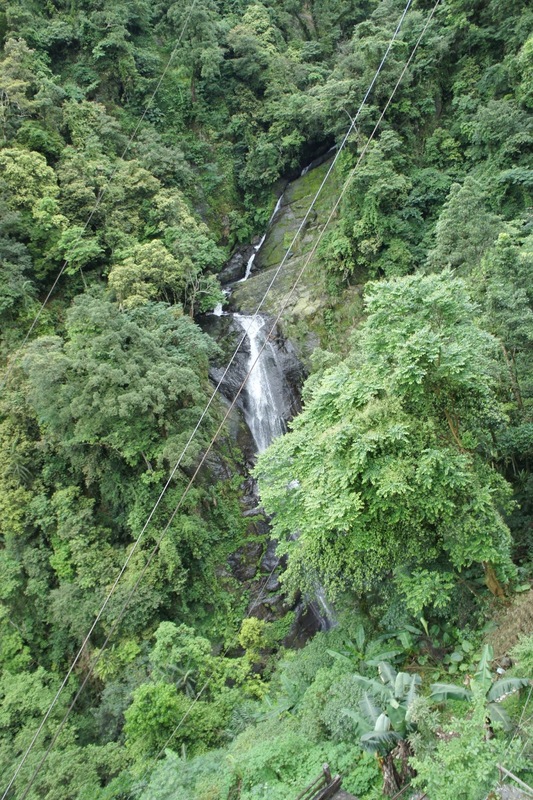 At this point we realise there is a cable car going up to the waterfall. As it is already late, we were sceptical that the cable car is still working. 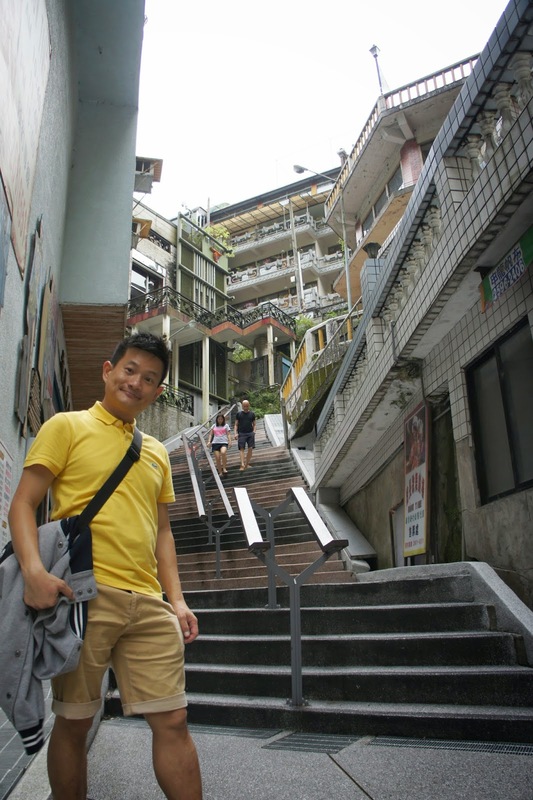 Nonetheless, my friend and I headed to the station via a series of stairs to check it out. It must have felt forever to reach the station. 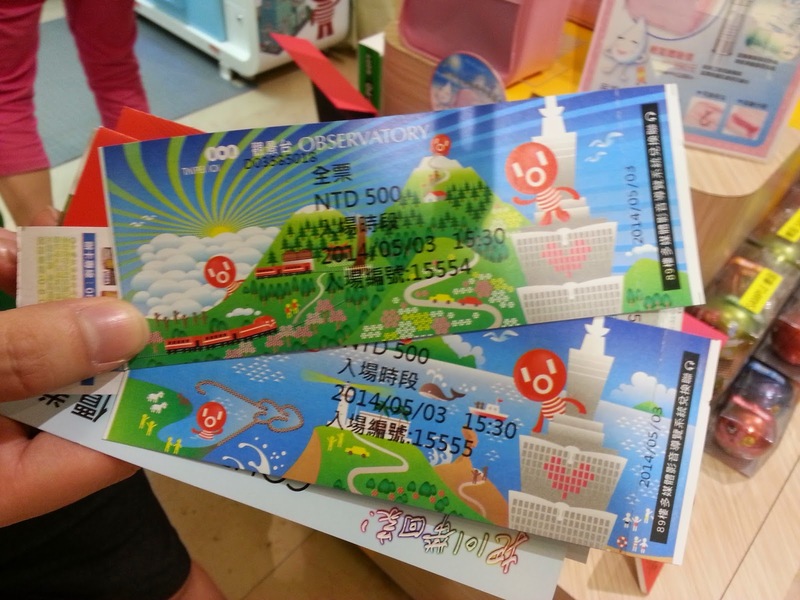 We headed to the ticketing counter and checked with the staff if the cable car is already closed for the day. We were delighted to be informed that the cable car was still in operation till 9pm. 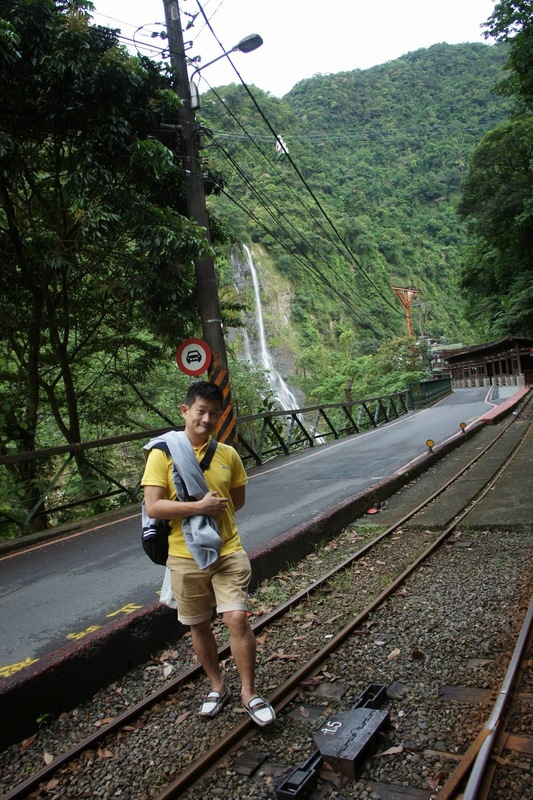 We spared no time, got our tickets and headed to the platform for our ride up to the waterfalls. 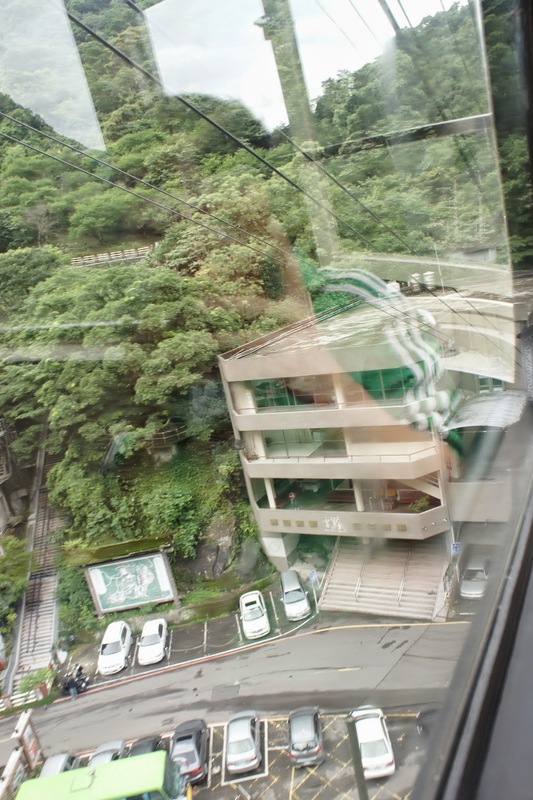 We spotted a cable car (must have been waited for awhile) and hurried to board the cable car. 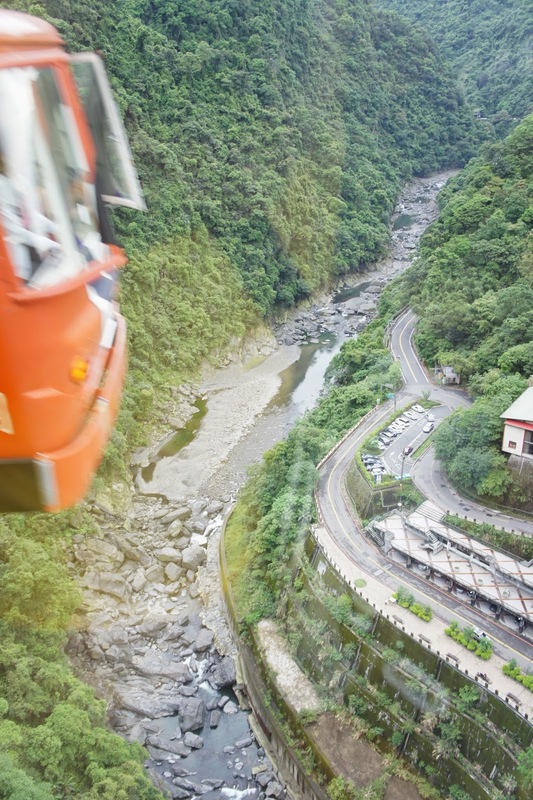 The staff operating the cable car must have been waiting for visitors before operating the cable car. 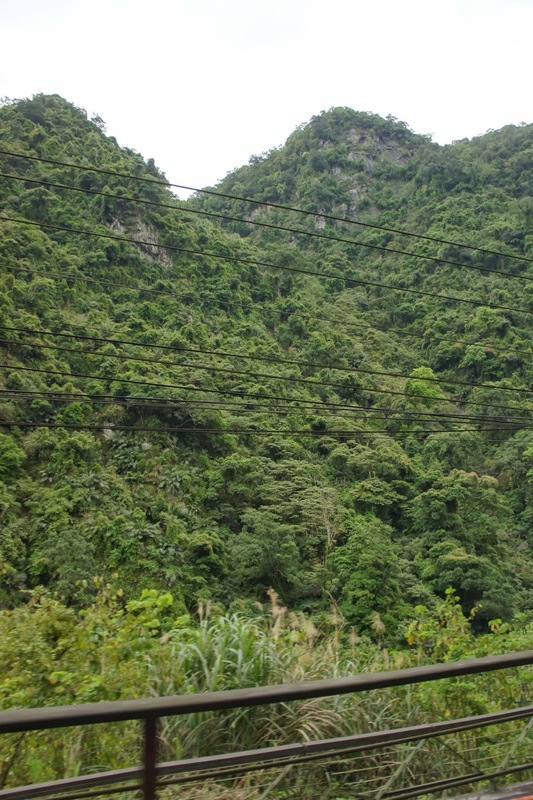 Soon we set off for the top of the waterfall in the cable car. 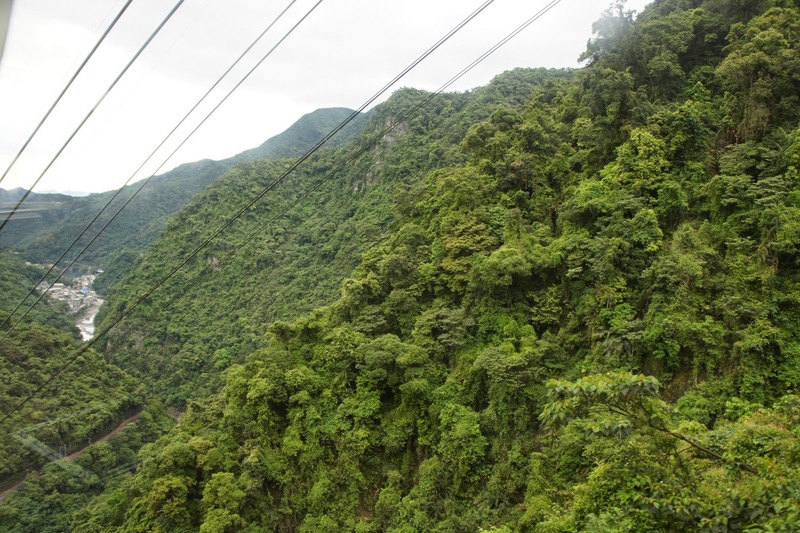 As the cable car ascend to the top of the waterfall, we were able to see more and more of the valley and finally the sceneries afar from the cable car. The ride to the top took about 10 mins. 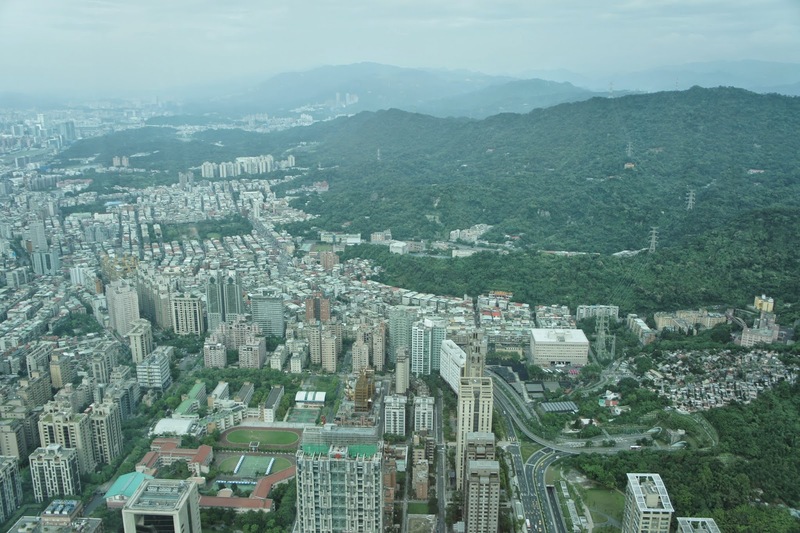 The view of Wulai from the cable car and the top of the mountain is certainly refreshing and different from that from ground zero. 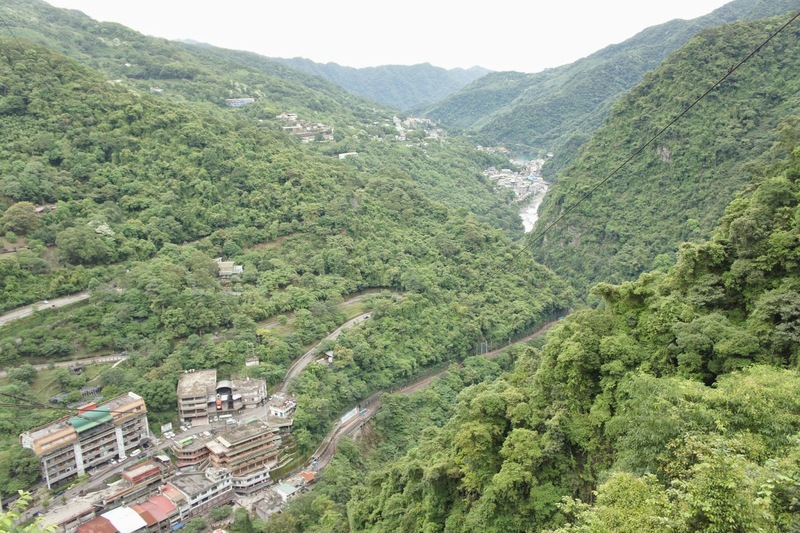 It is recommended for visitors to Wulai to head for the cable car to the top of the mountain to absorb a different view of the area. 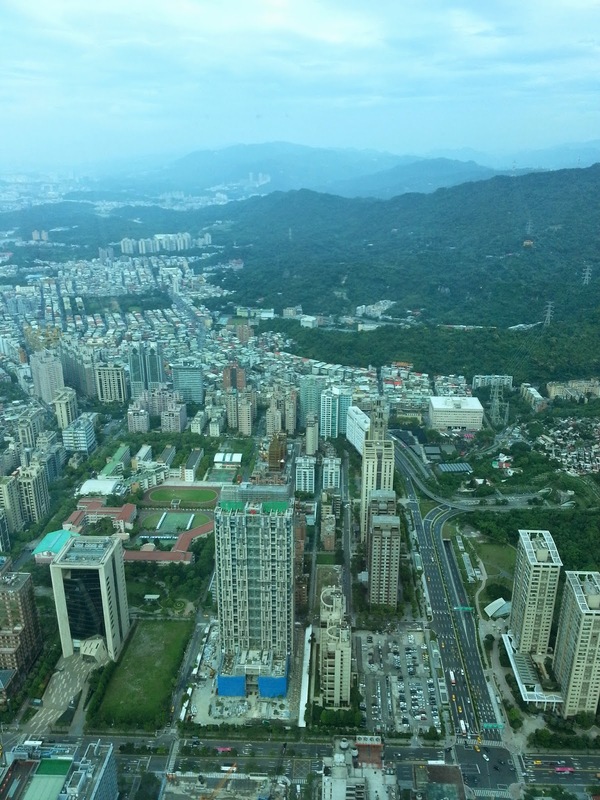 As soon as we alighted the cable car, we headed straight to the view point. 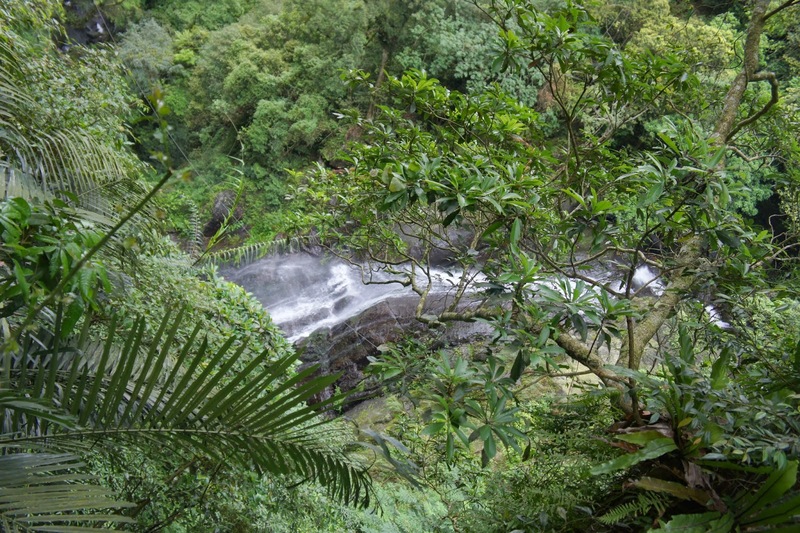 From the view point, we could see the whole valley and even traced to where the beginning of the waterfall is. 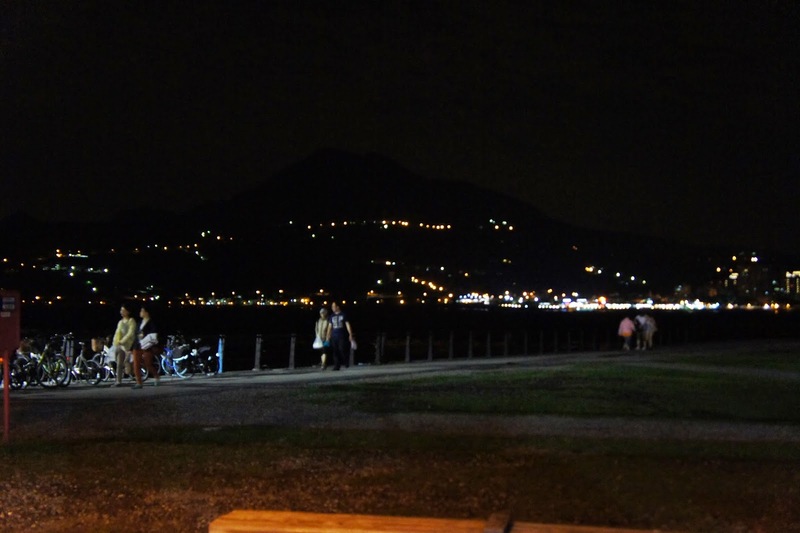 As it was getting late, my friend and I decided not to venture further in and remained near the cable car station. The area felt abandoned and there did not seem to be lighting in the area. It was very serene from the view point, perhaps due to the time of the day, when the crowds thin. 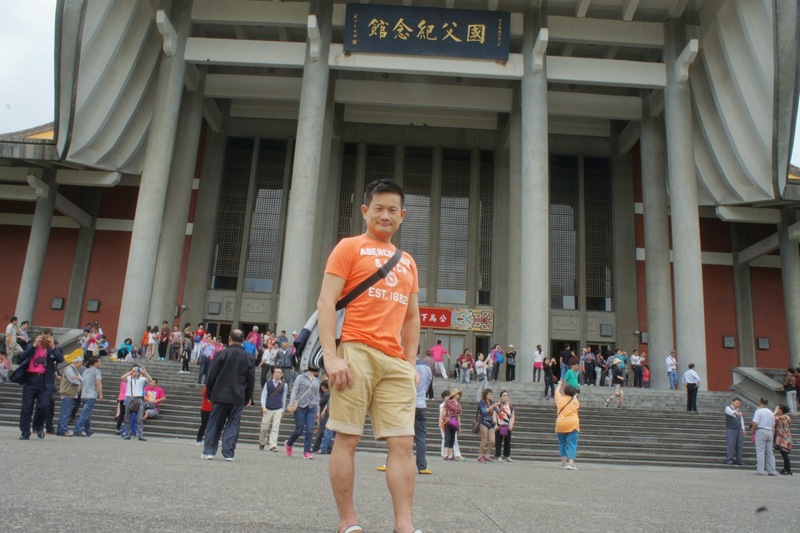 We stayed for a few more minutes to enjoy the tranquility and the vastness of the place before heading back down and search for a hot spring, the very reason we came to Wulai for. 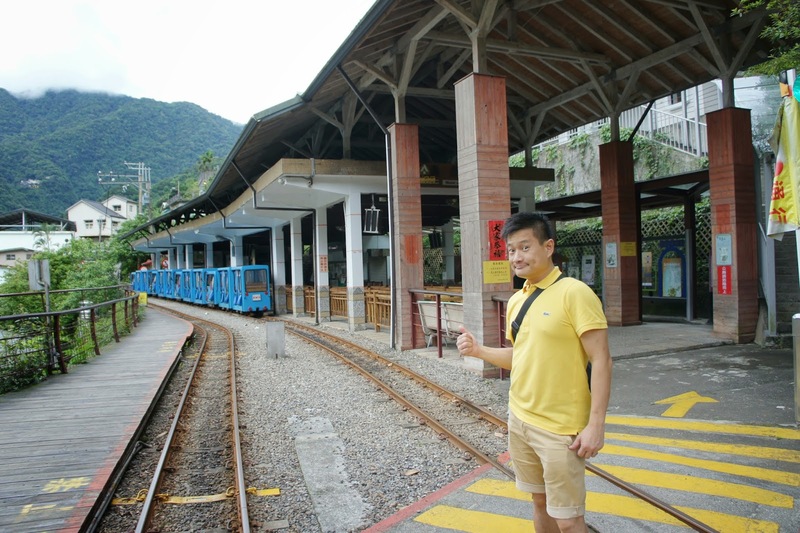 Soon my friend and I reached to base of the cable car station. As the log cart ride has ceased operation for the day, we took a hike to the town. As I read from the map, there is a Hot Spring Street at the end of Lover’s Walk. My friend and I took a stroll back to the town, appreciating the serenity of the surroundings and the fresh air the mountains produced. 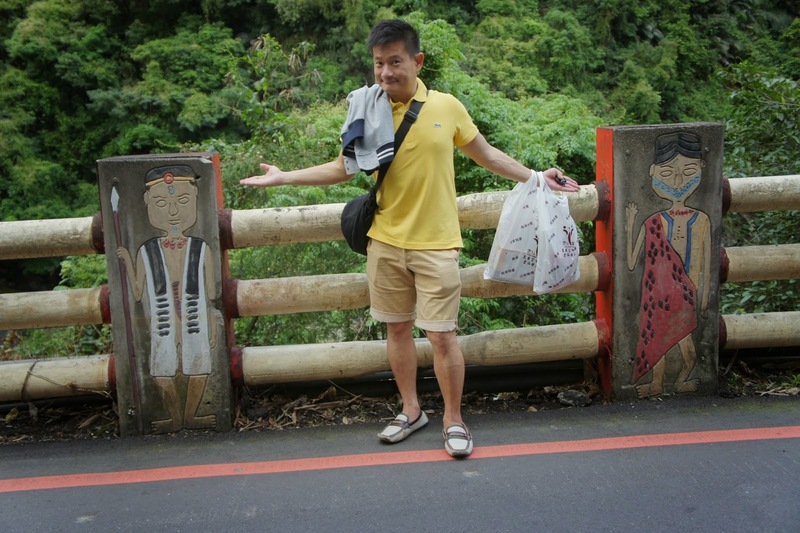 There are paintings of the Atayal idols along the street, onto the railings that prevents visitors from falling into the river. It is not tough for one to spot them. It must have took us 10 mins to reach some form of civilisation. 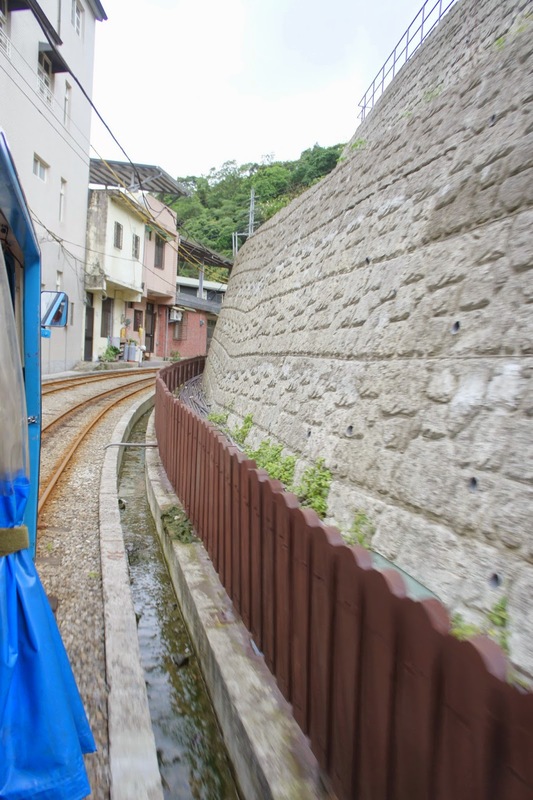 Before we knew it, we have arrived at the Hot Spring Street, where one can find heaps of Hot Spring Baths. 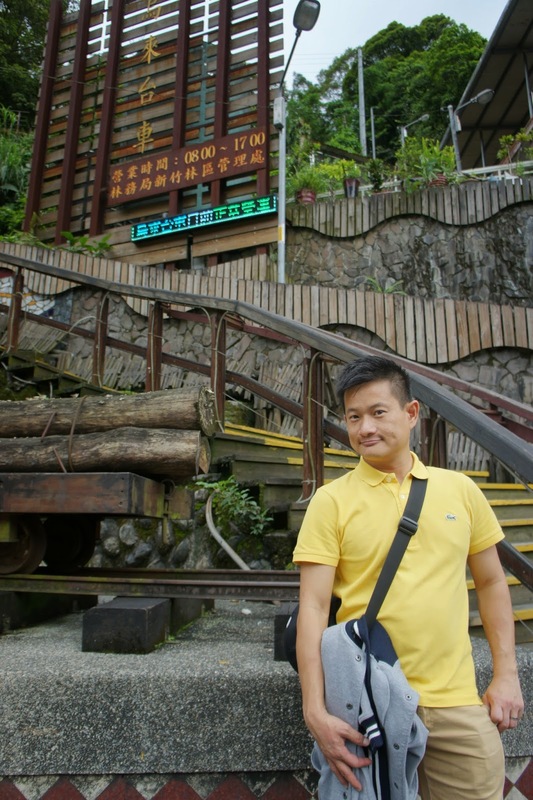 The moment when one enters Wulai Old Town, there are no lack of Hot Spring Baths. Most of these establishments doubles up as hotel for weary guests to spend the night in. According to our research, one can only check into the hotel at 10pm and have to check out the next day at noon time. 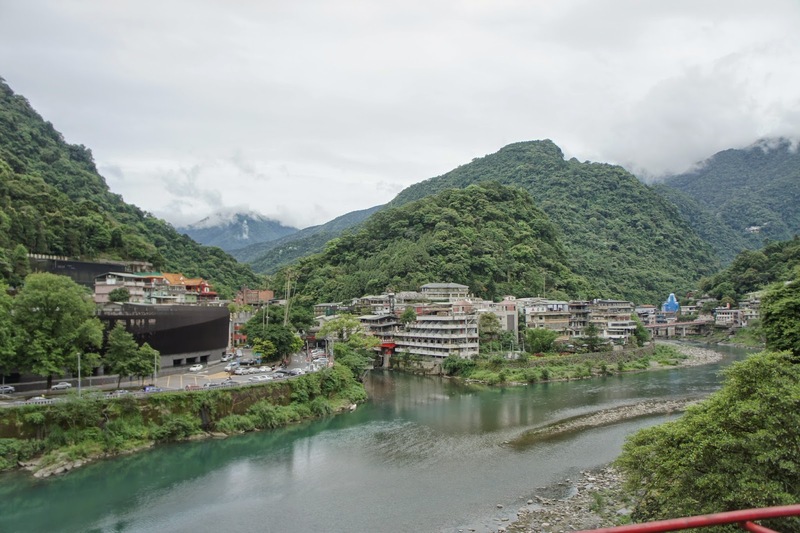 It is not worth staying over in these hotels, a day hot spring trip will suffice for a great time in Wulai. 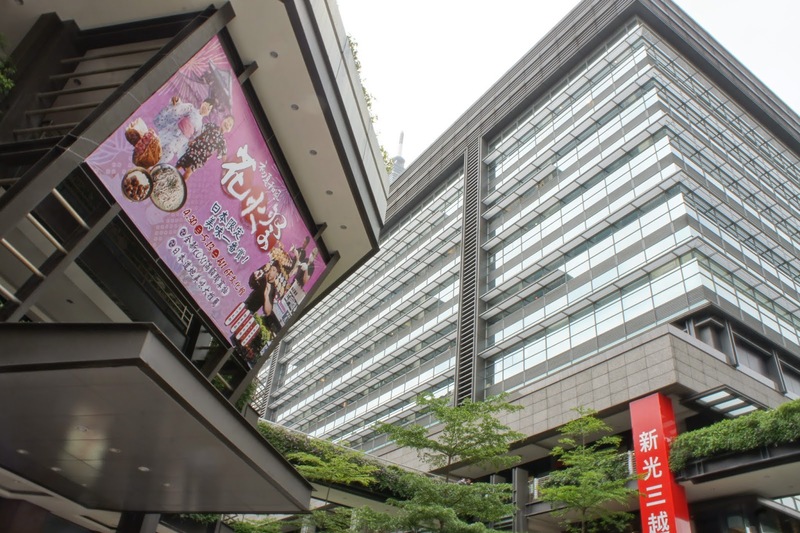 Most of the Hot Spring Baths are located along the Hot Spring Street, there are no lack of choices for visitors. Perhaps due to the season, it isn’t particularly crowded. As we were walking past the first Hot Spring Bath, we were welcomed by their staff. The friendly staff promised no pressure and invited us to take a look at their price. And we did. The price the quoted was way lower then what we expected to pay, best of all, the package came with a drink and desert to be consumed after the session. My friend and I spared no time and went for this establishment. The friendly staff showed us to our private room and left us to enjoy the scenery. 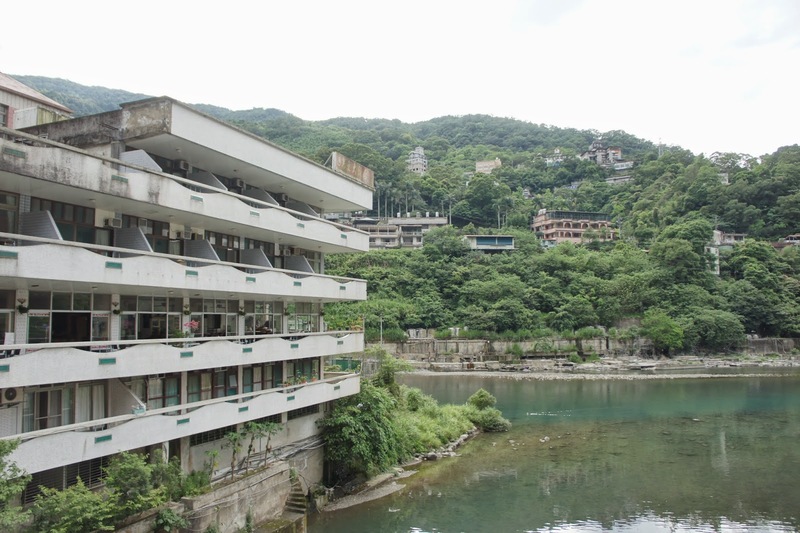 This bath has rooms that overlooks the river and the mountain surrounding Wulai. 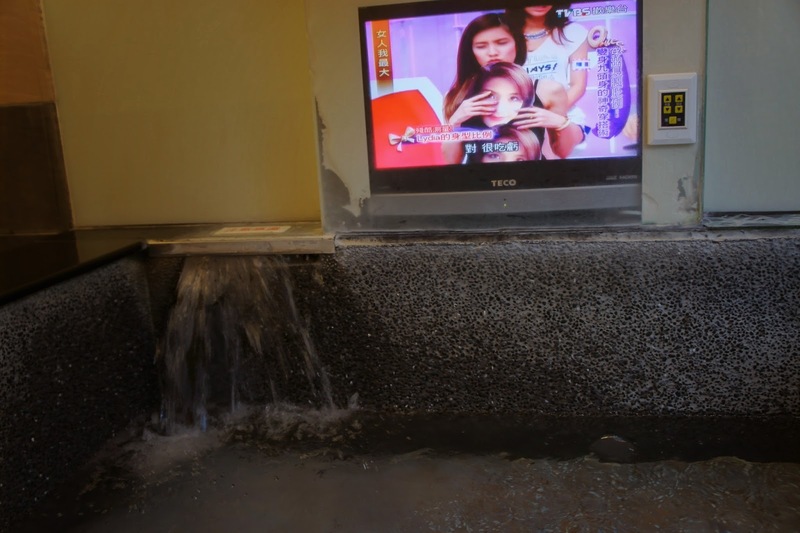 There is even a TV inside the room for guests to enjoy whilst soaking in the heated spring water. My friend and I enjoyed the hot spring bath for about one and a half hours before calling it quits. After the hot spring session, the friendly staff checked with us how was the hot spring and served us the drink and desert. This Bath has really great deserts, fragrant and yet not too fattening. This is indeed a great way to end the session. As it was rather late at night, we wanted to try out the Atayal tribal food. 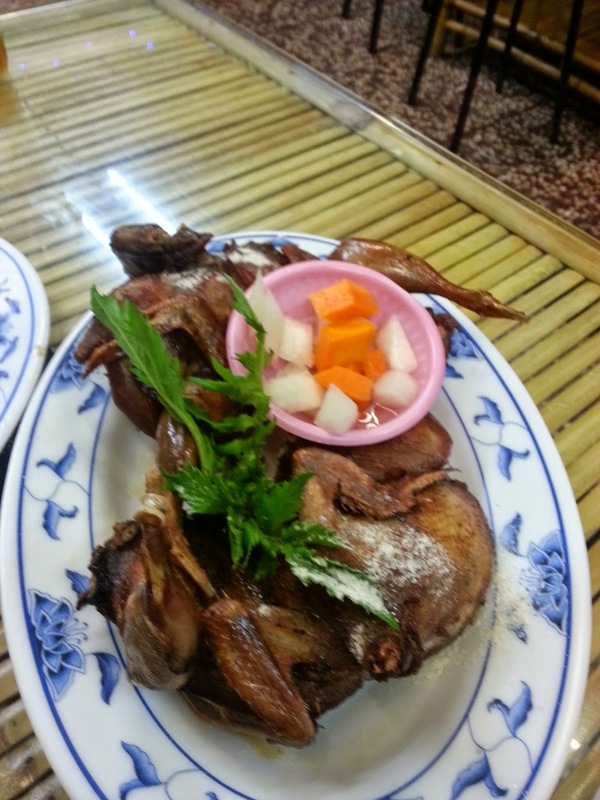 I read that there is a renowned restaurant in town and proceeded back to Wulai Old Street and searched for this restaurant. It did not took us long to locate this restaurant. I was particularly excited to try some Atayal Tribal food. However my excitement was proved to be short-lived. 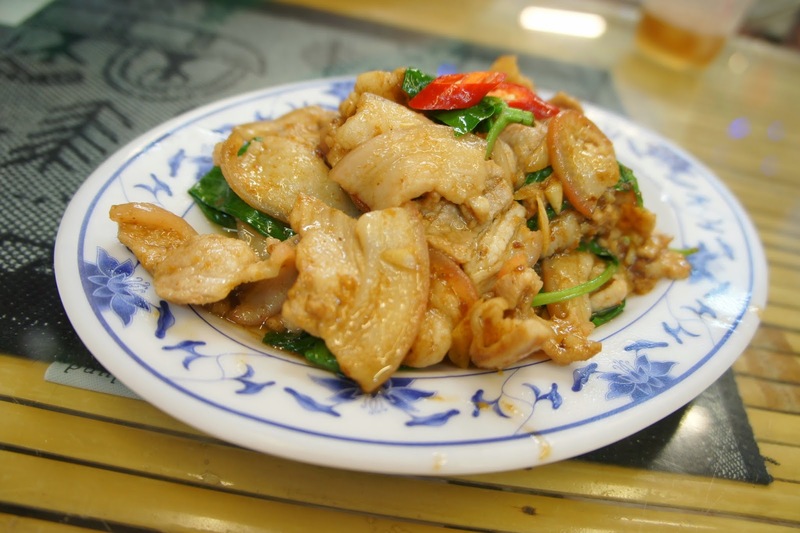 The food is rather bend and the chicken is dry and tough. I guess it wasn’t to our liking and did not finish the food we ordered. 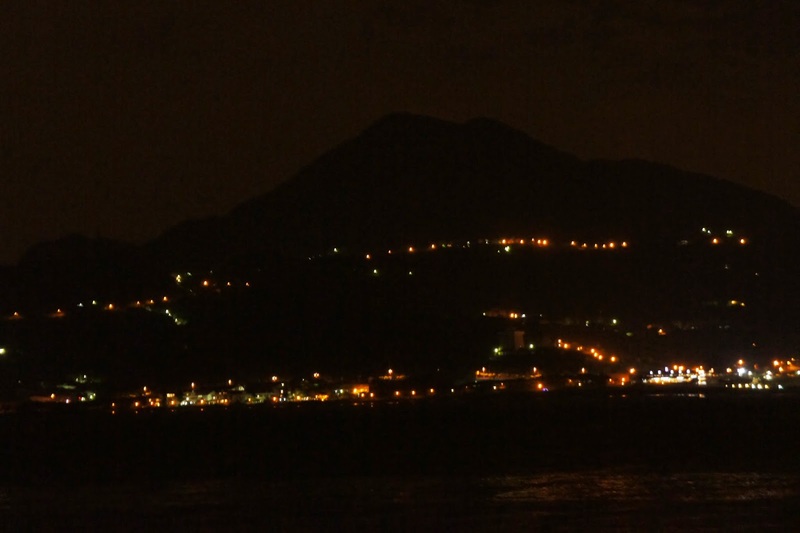 As the night has fallen, my friend and I decided there isn’t much to see in Wulai and headed back to Taipei City. 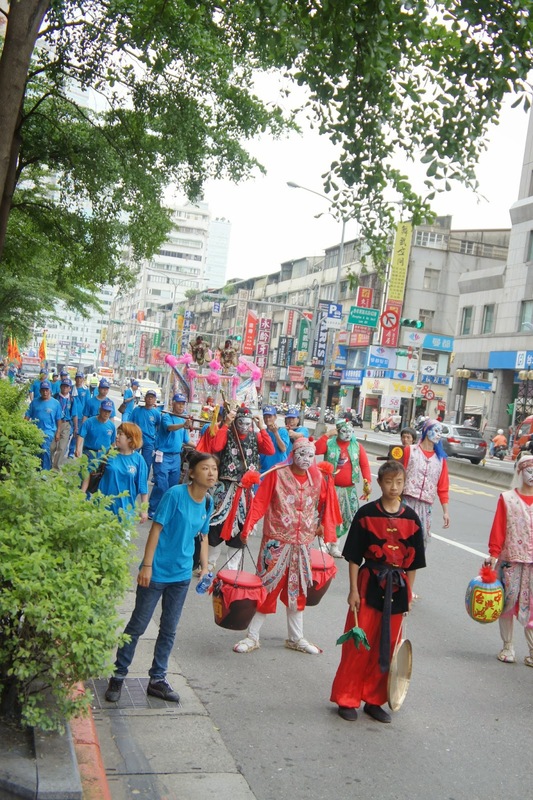 As we were heading for the subway station in Xindian, my friend suggested to head for Shida Night market. 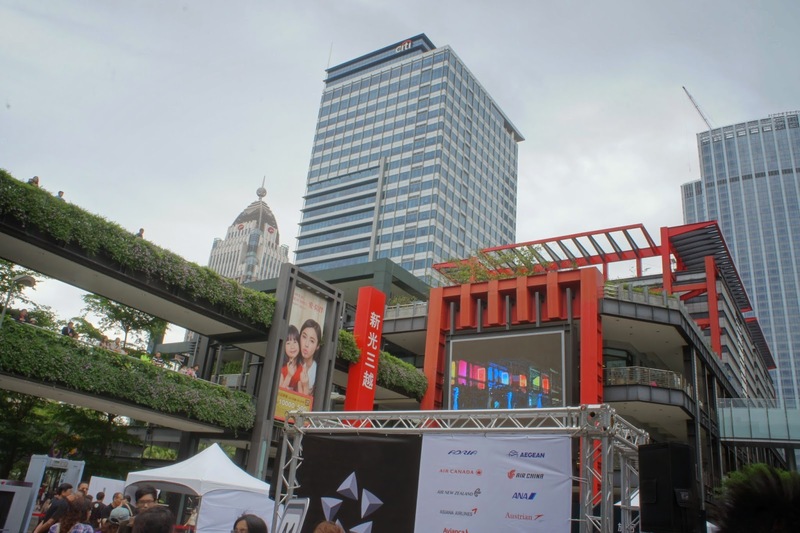 Since the night is relatively young for Taipei, I agreed and we quickly searched which station we needed to alight and made our way there. It did not take us too long to reach Shida Night Market (師大夜市). 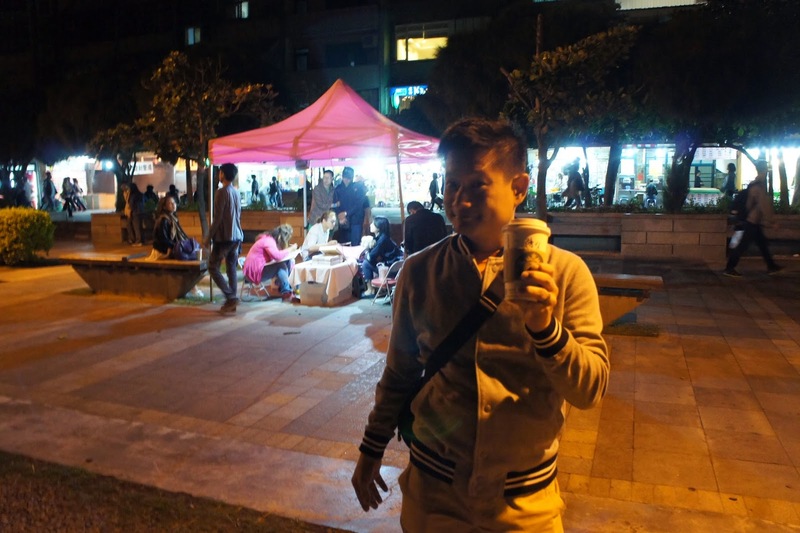 The night market is located near a university and the crowd is relatively young. 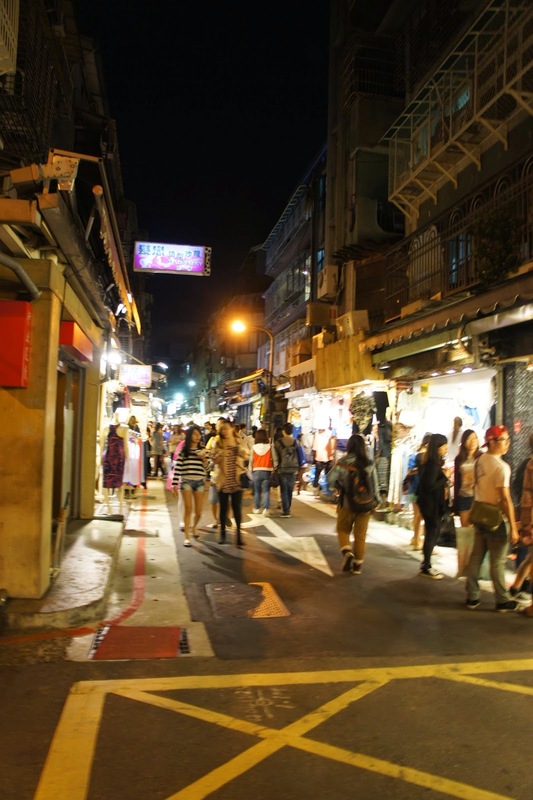 Despite being at night, the night market is still bustling with life. 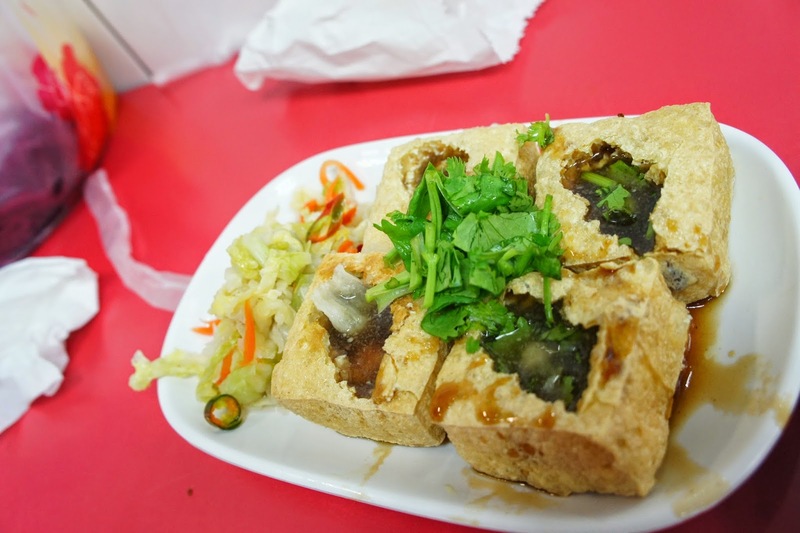 This is testimony to night market being an integral part of Taiwanese. 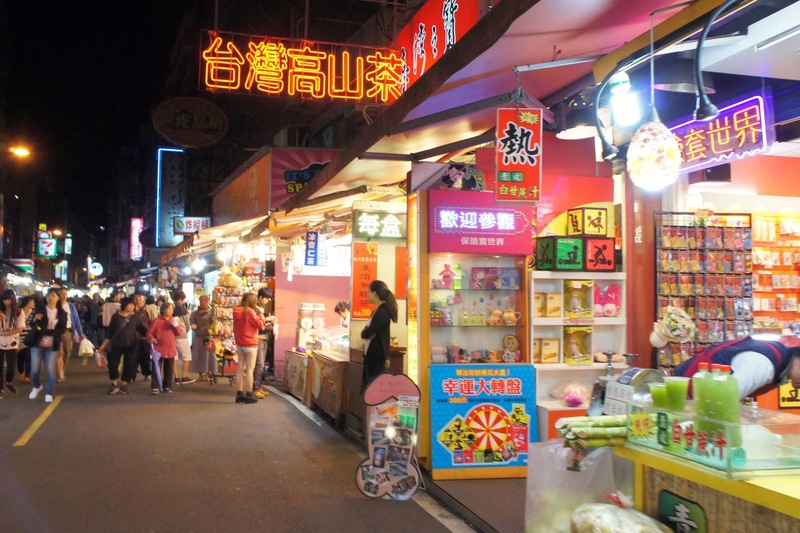 Compared to Shiling Night Market, Shida is relatively smaller, however it is still sizeable for one to spend hours exploring the shops, the food being sold at this market. 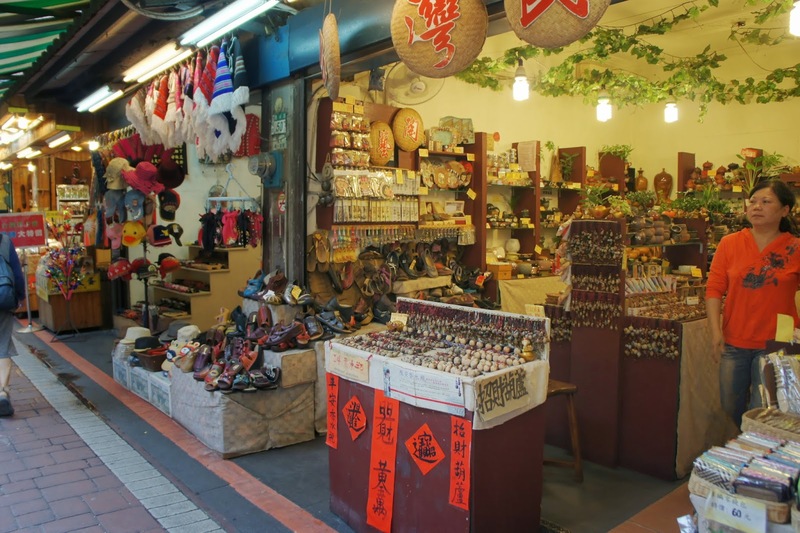 As this market caters mostly to the young, there are no lack of clothing and accessories shops. 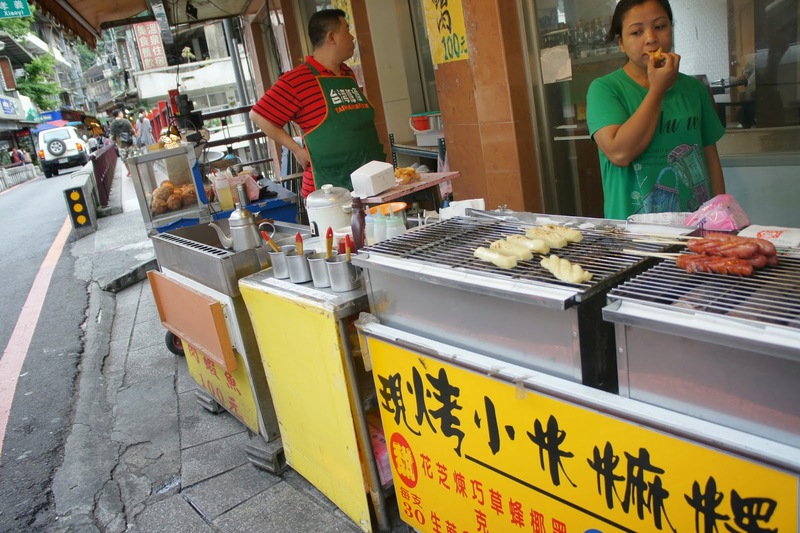 Even the food on offer here consist of mainly fried stuffs. 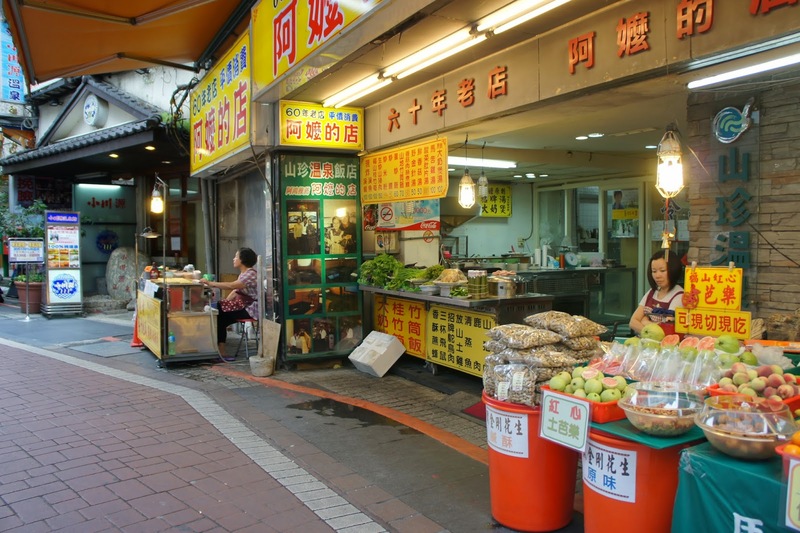 My friend and I walked through alleys and alleys of shops, occasionally queuing up for snacks to be eaten as we walk. 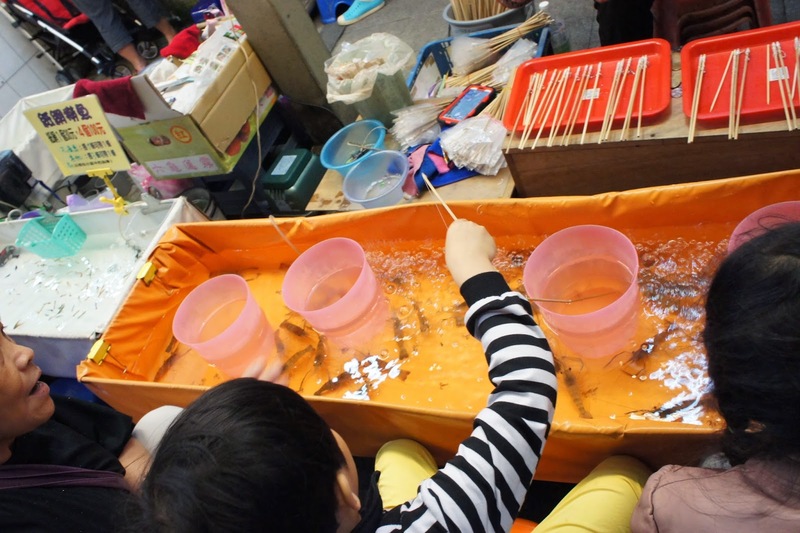 This is how we settled our dinner in the days we spent in Taipei. 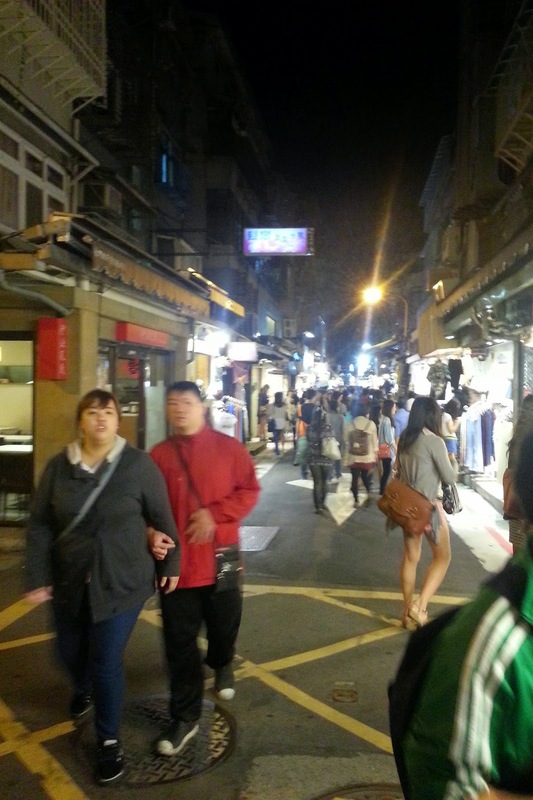 As we were walking up and down the night market, we realise the crowd started to thin. This is sign for us to depart the night market as it seem that the night market is calling it a night. 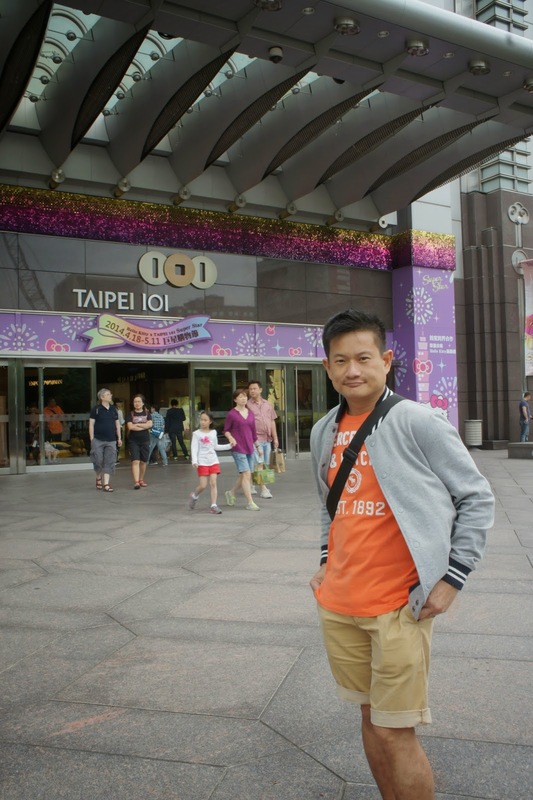 We headed back to our hotel via the subway getting ready to explore Taipei City the next day.